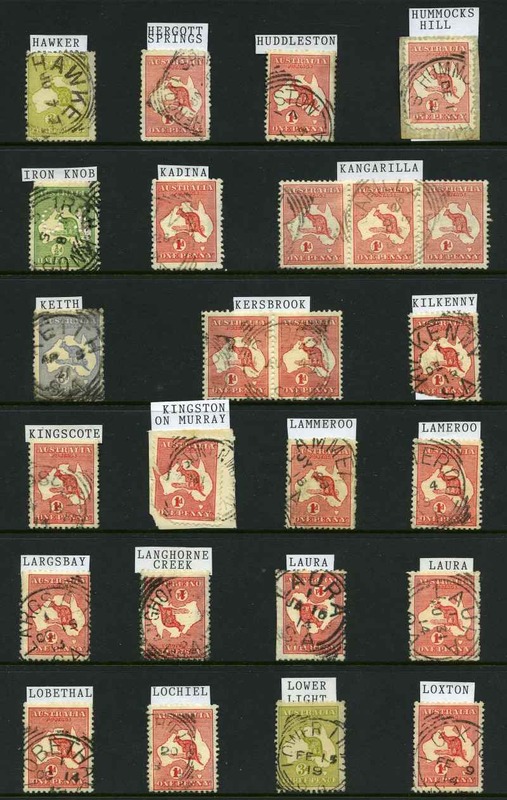 Collection of 573 mainly Commonwealth Type Circular Date Stamp postmarks on Kangaroo issues including Armatree, Bungarby, Burraga, Burren Junction, Catherine Hill Bay, Dandaloo, Dungog, Five Dock, Goolagong, Gooloogong, Goonumbla, Gurley Siding, Karuah, Kiandra, Lake Cargelligo, Lostock, Liverpool Military Camp, Miller's Point, Nambucca Heads, New Angeldool, Nymagee, Pallamallawa, Pokataroo, Running Stream, Shuttleton, Taverner's Hill, Timbery Range, T.P.O. 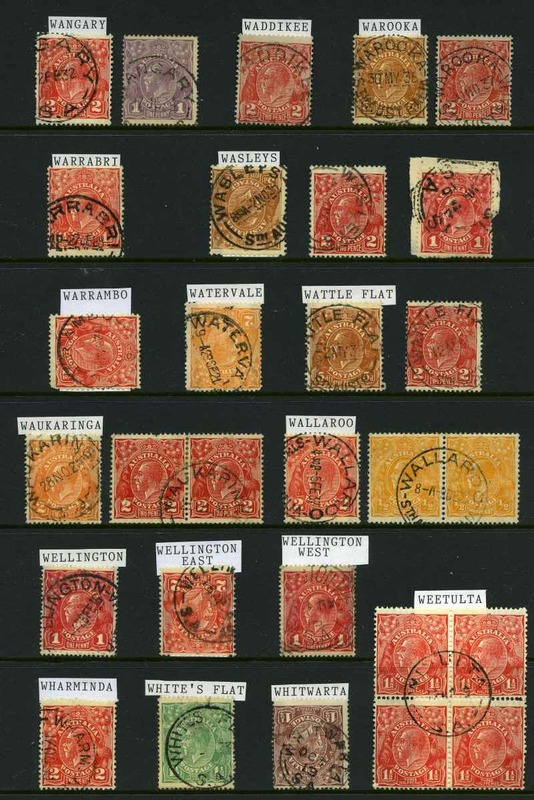 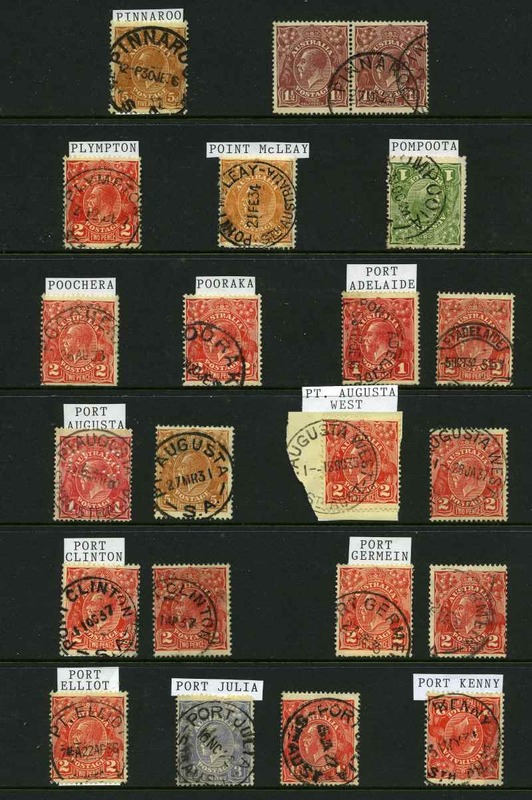 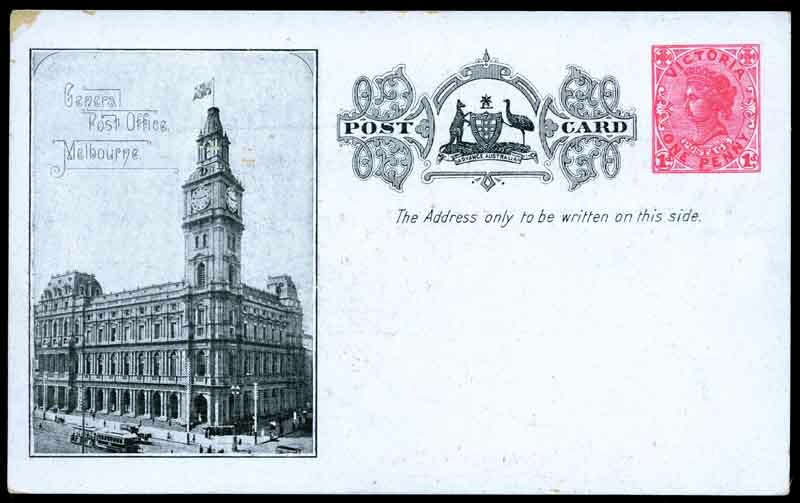 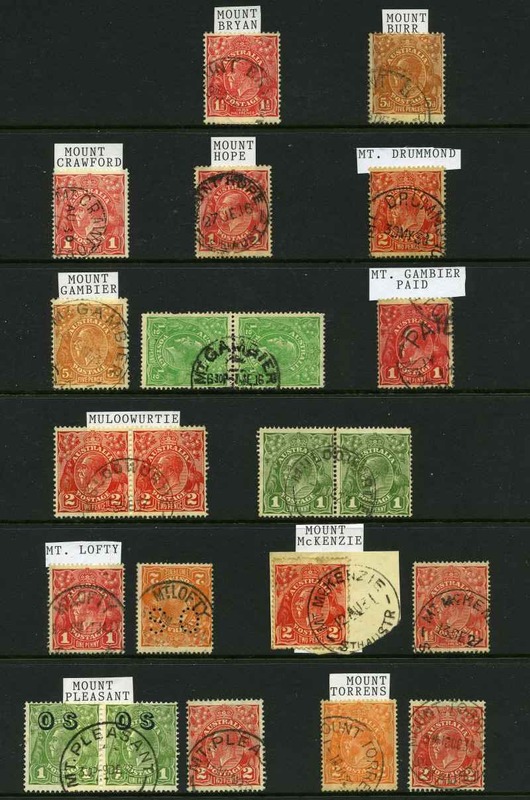 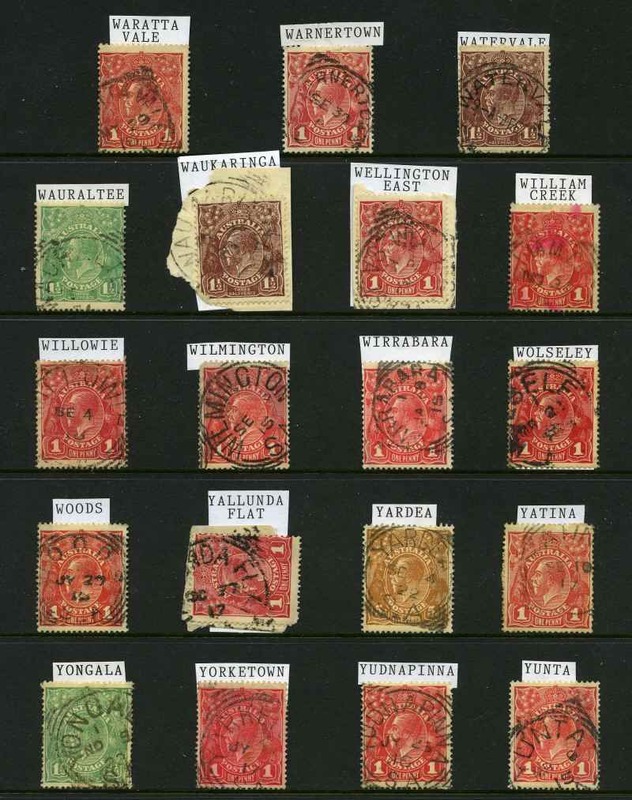 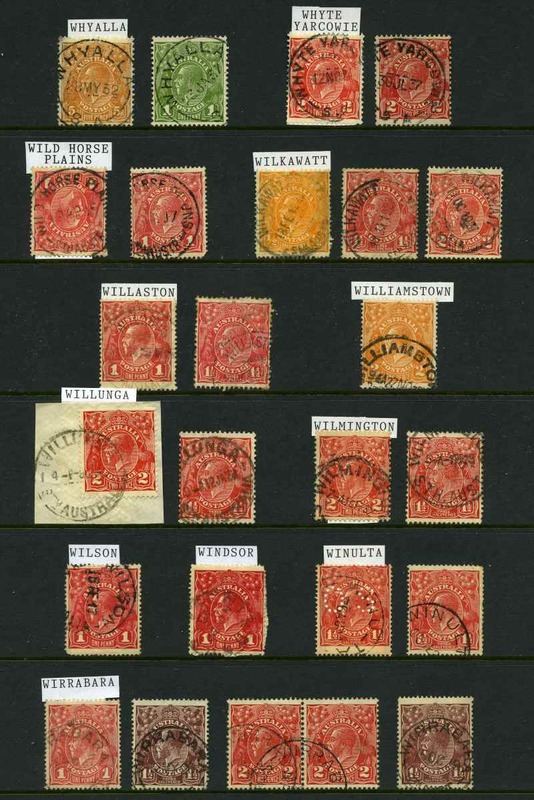 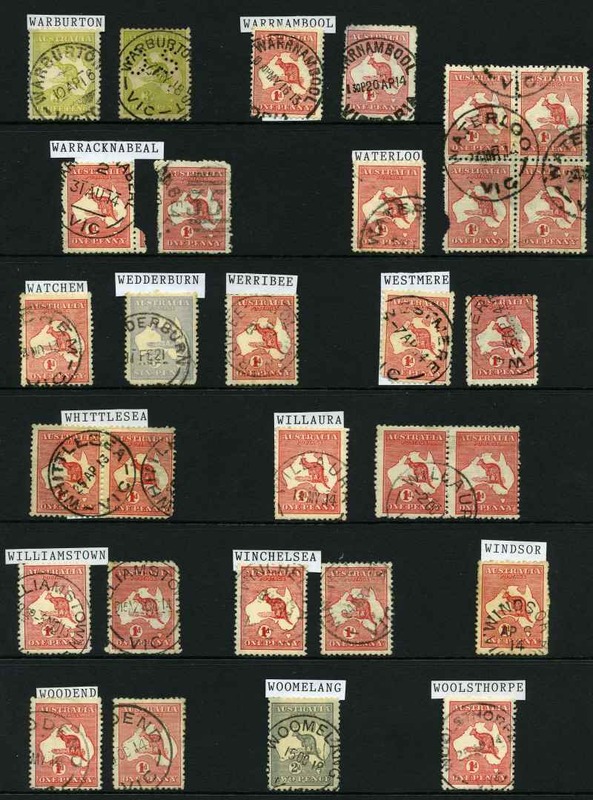 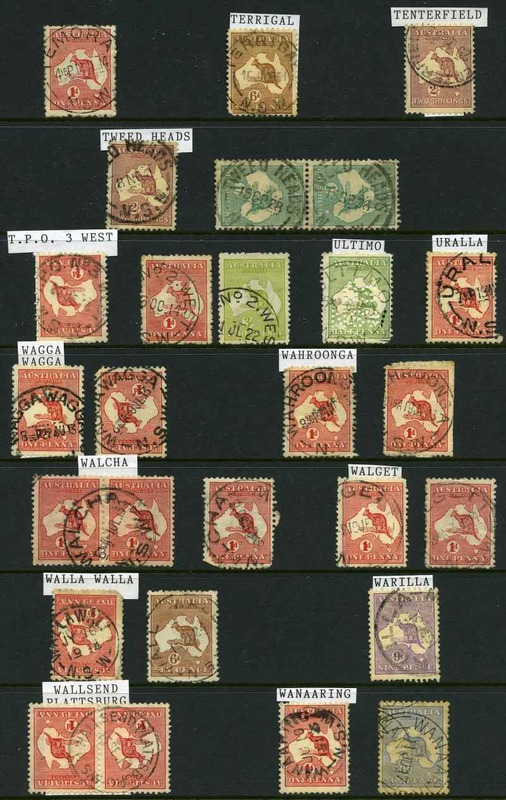 No 2 West, Wallsend Plattsburg, Wattamondah and Wilson's Downfall, plus small range of Australian Capital Territory postmarks. 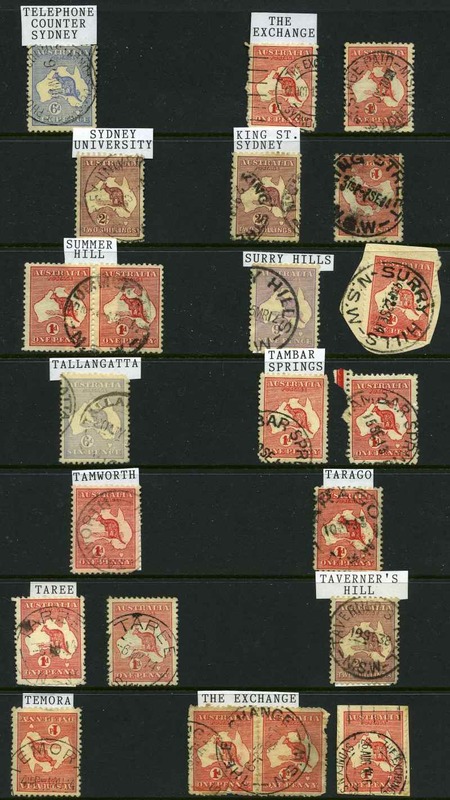 A good range of near complete strikes with 405 different suburbs and towns represented. 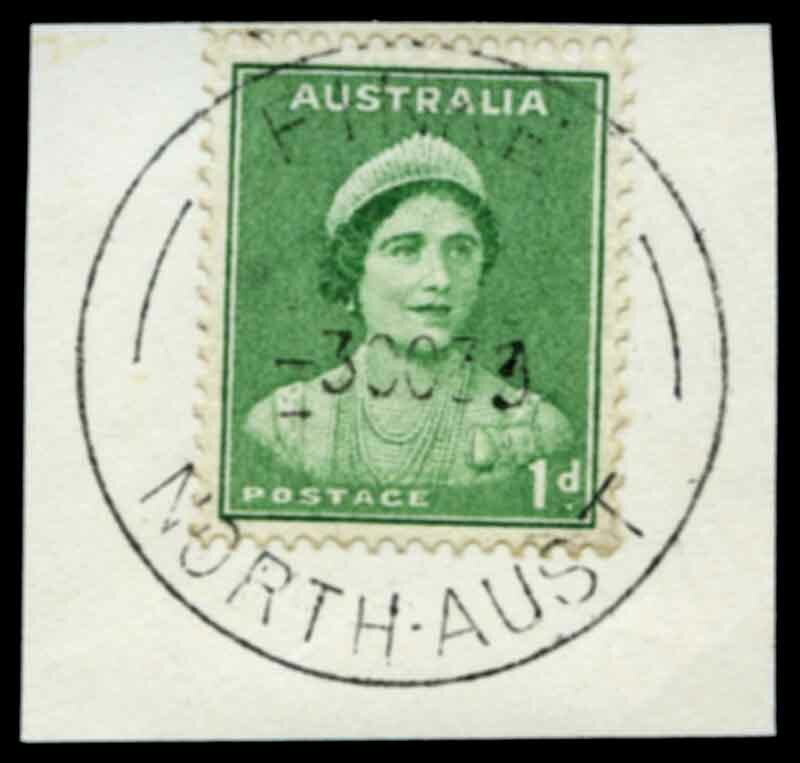 Finke 3OC39 North Aust CDS postmark on 1d Green Queen Mother on piece. 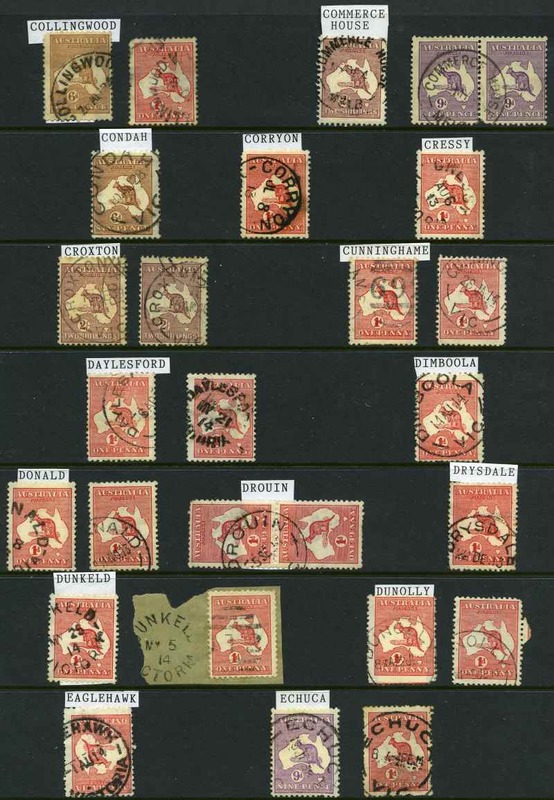 Full complete strike. 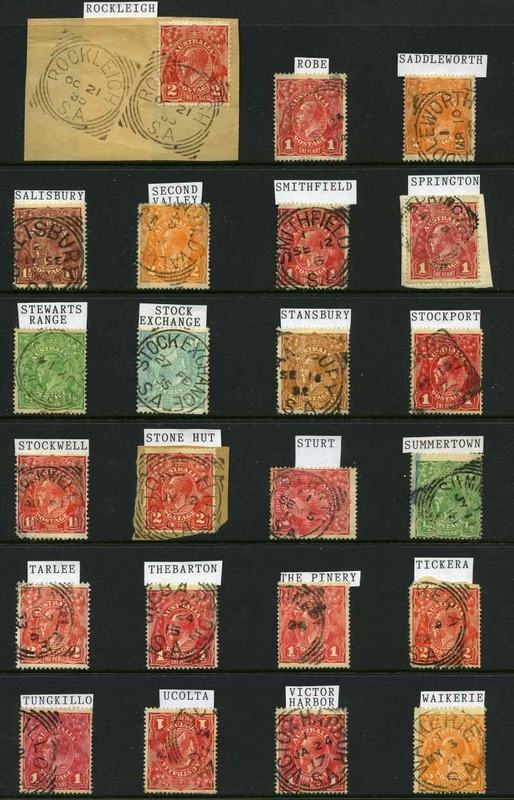 Rated 3R. 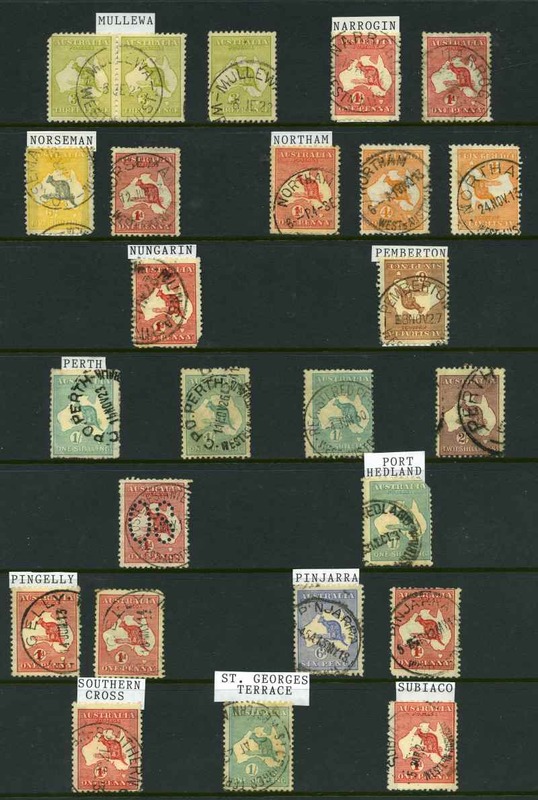 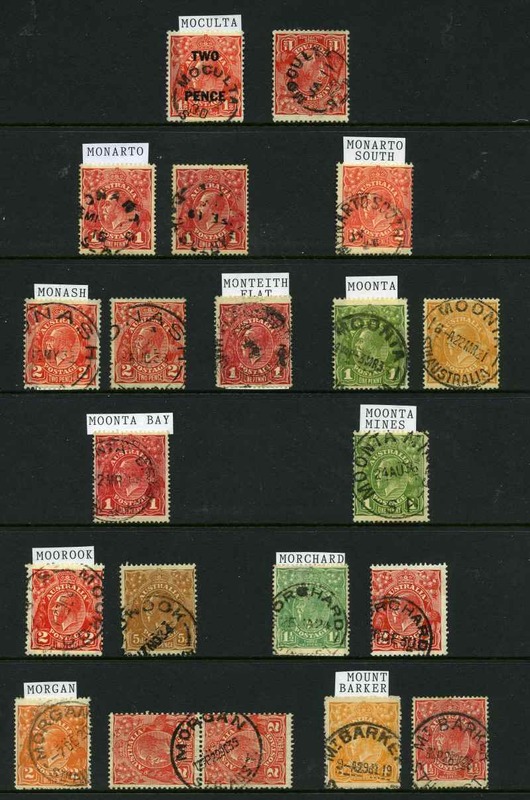 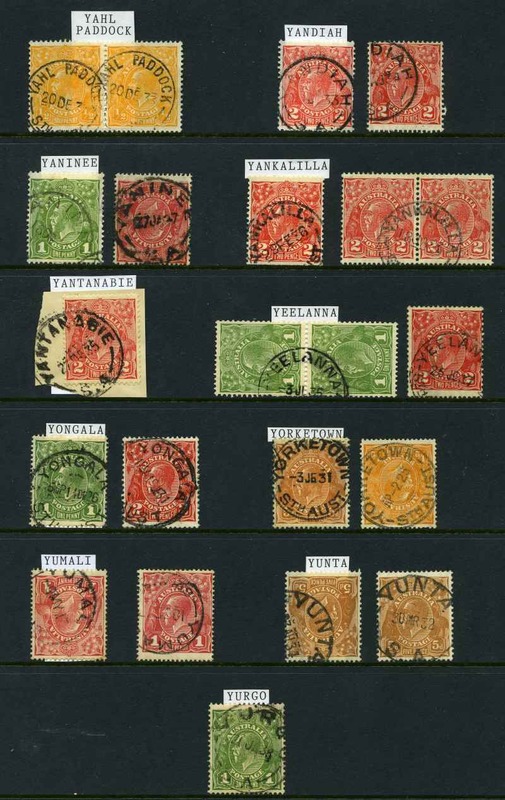 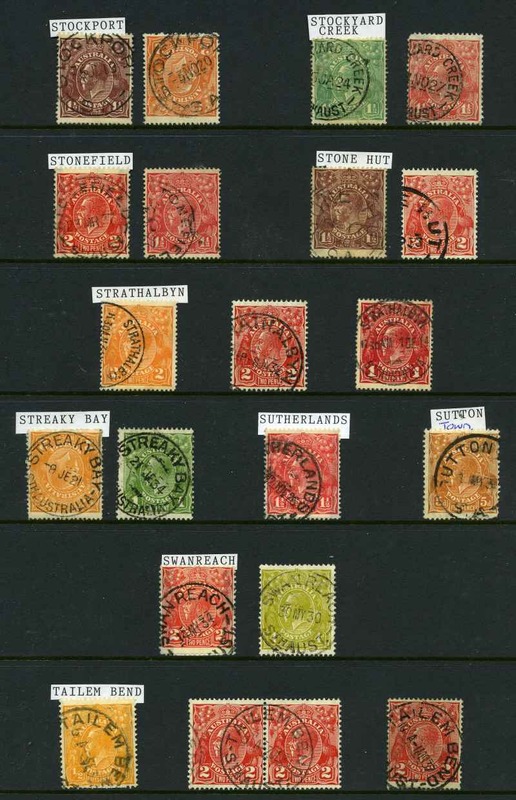 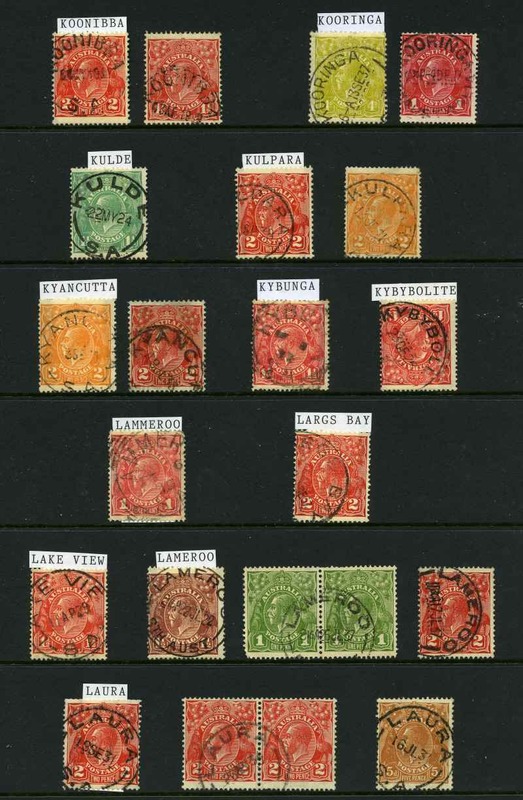 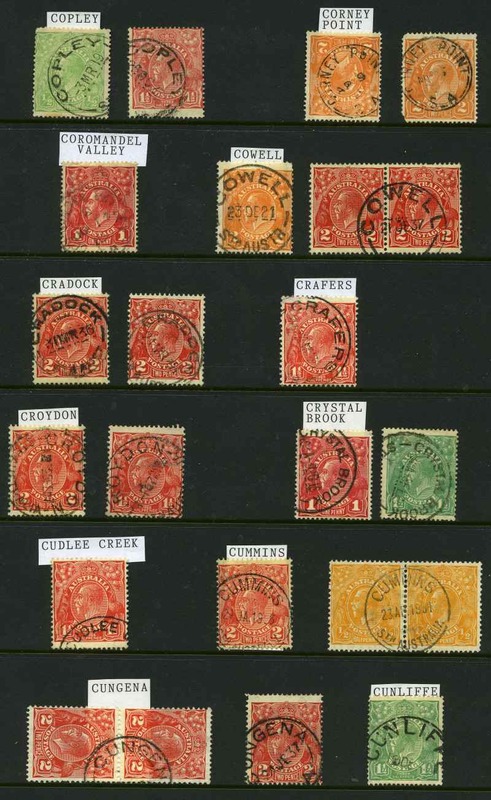 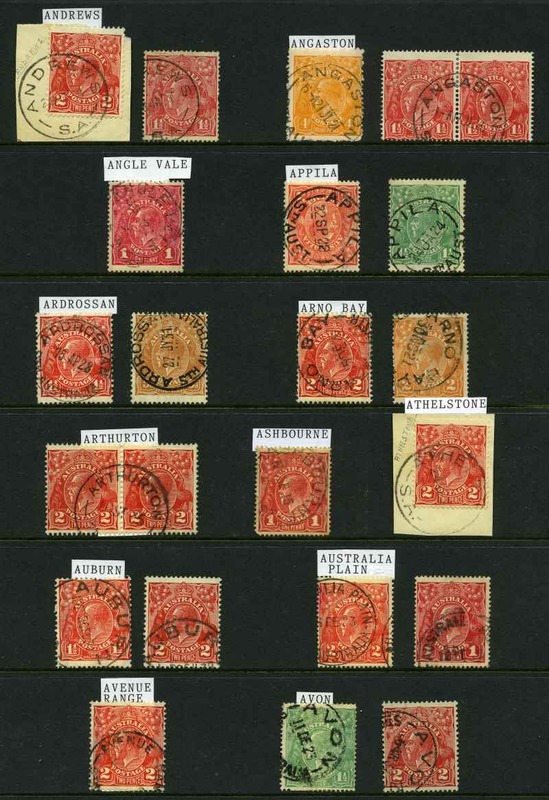 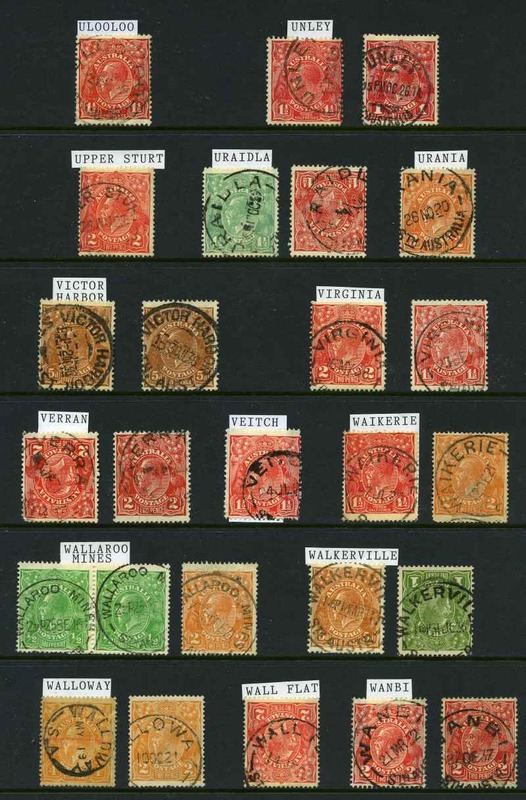 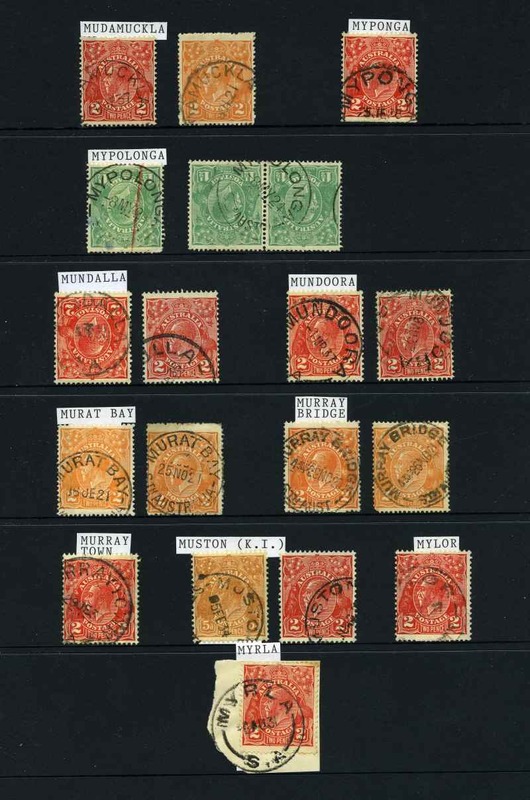 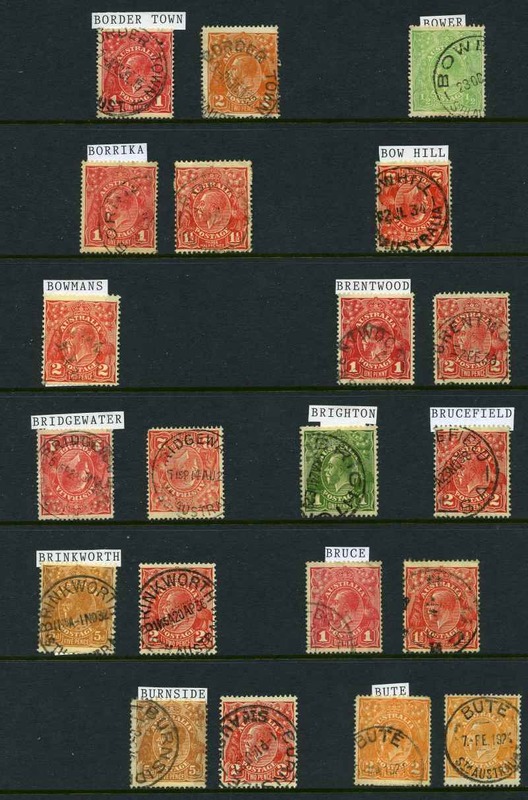 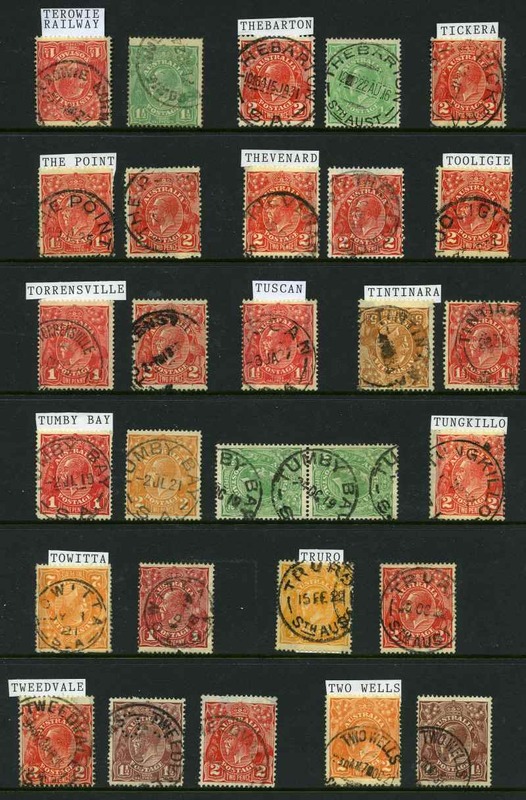 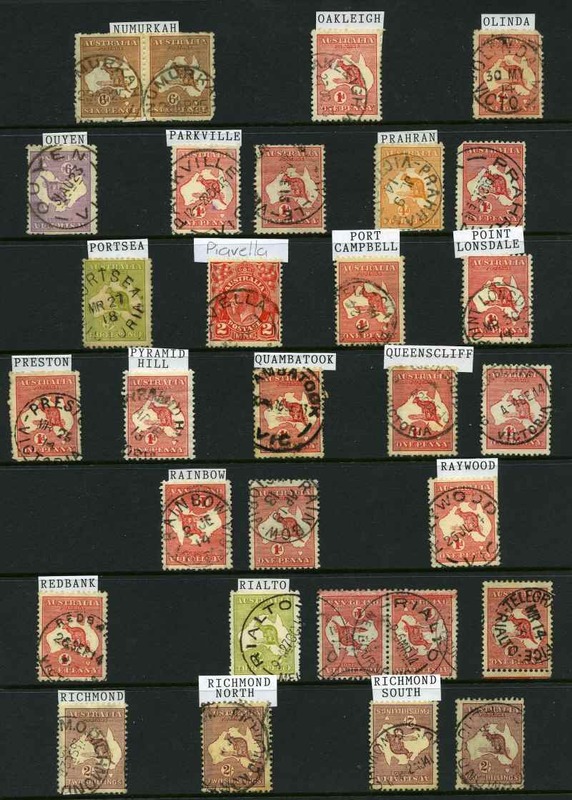 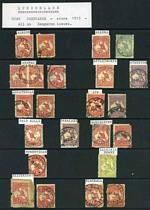 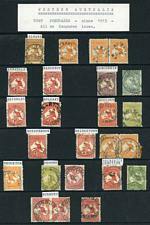 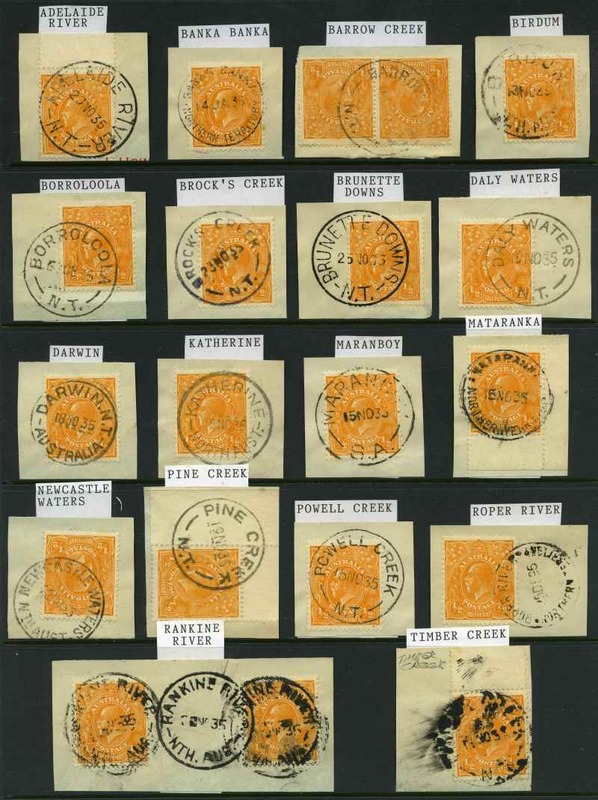 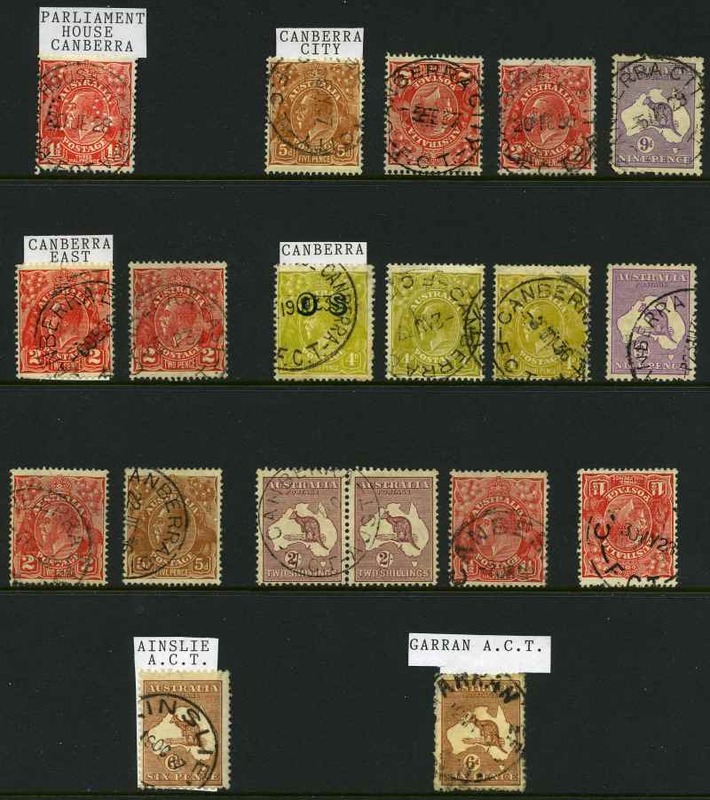 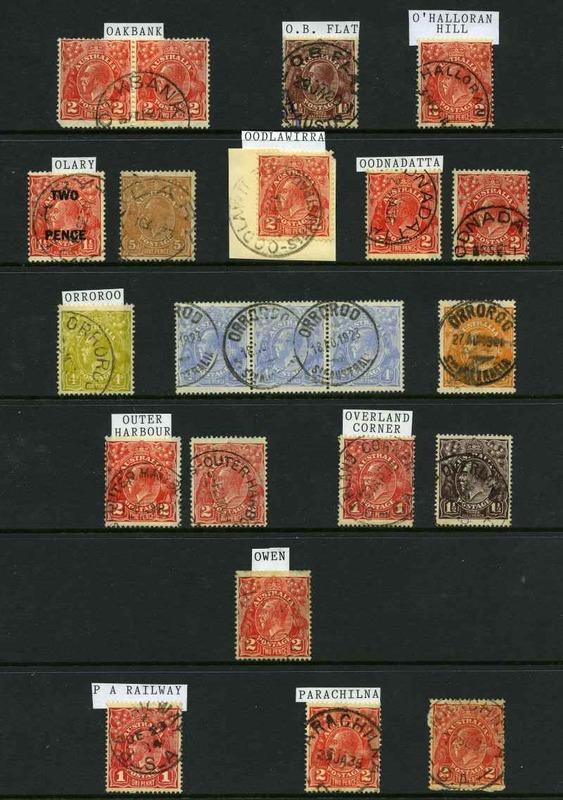 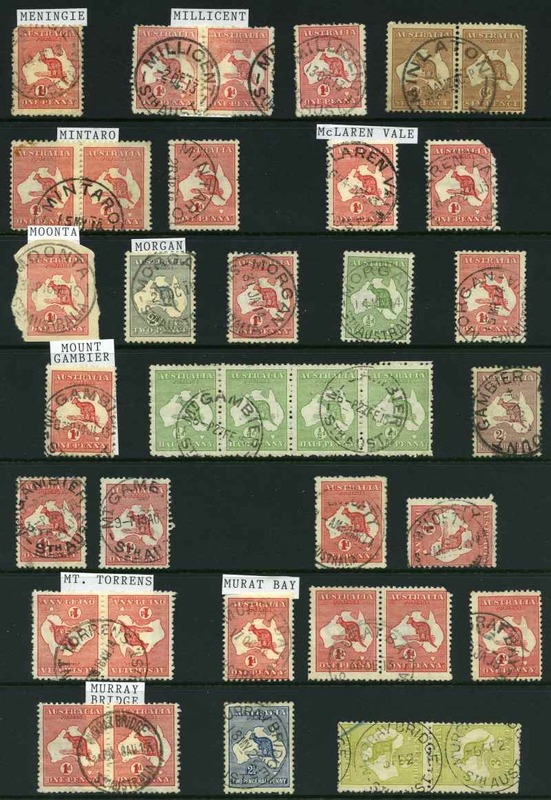 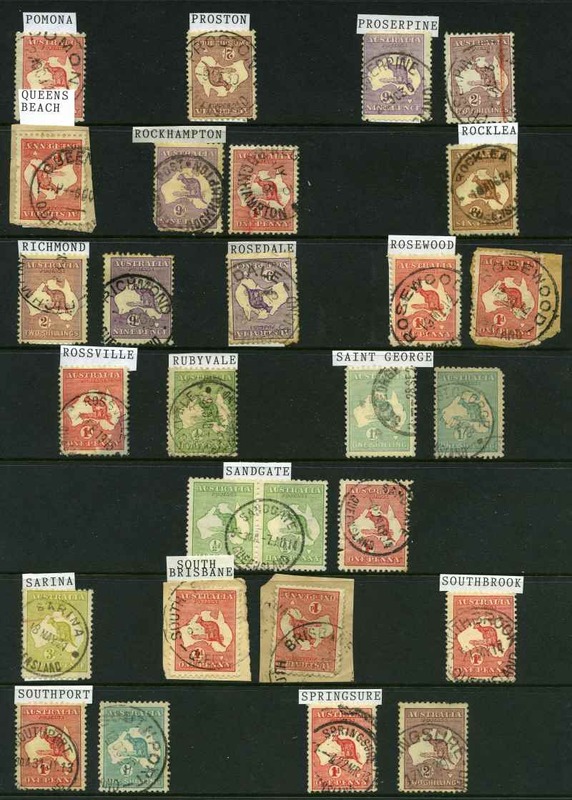 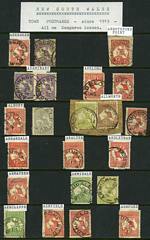 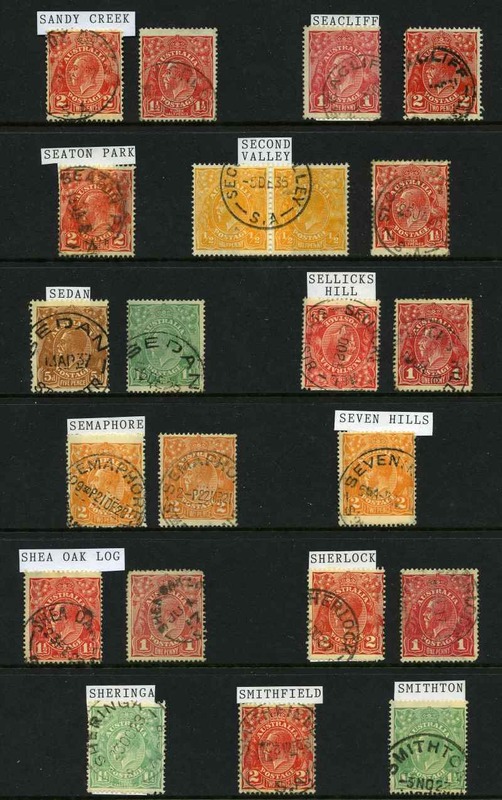 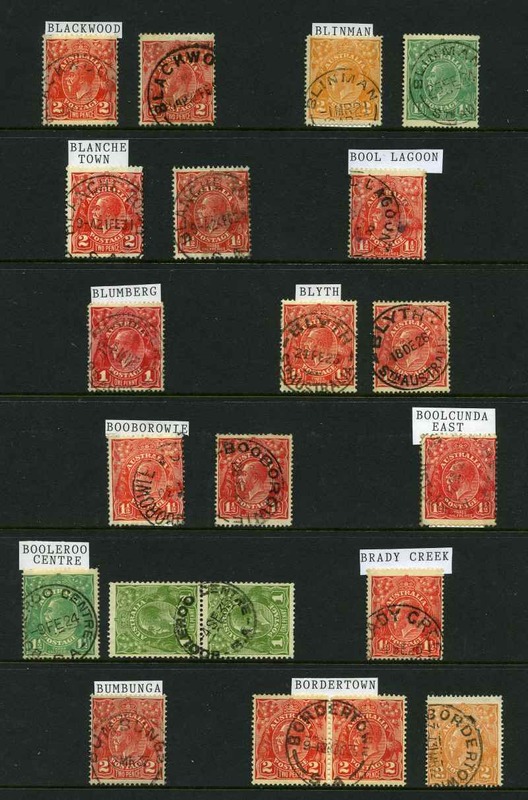 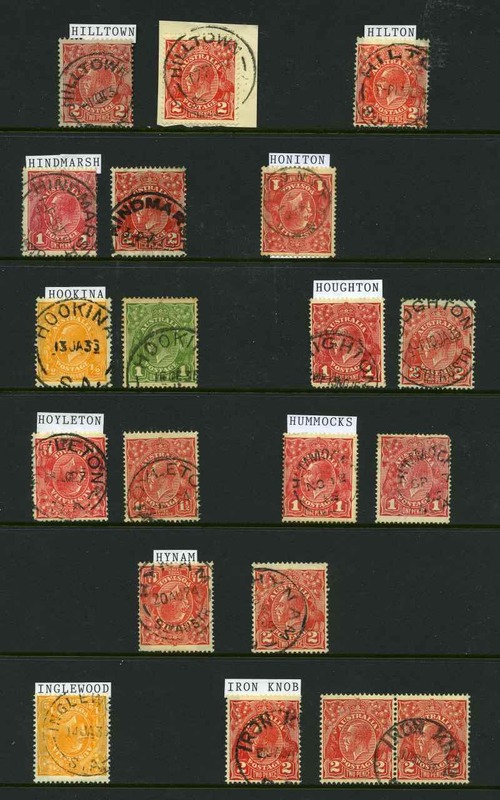 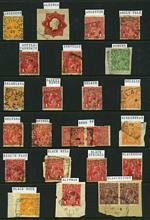 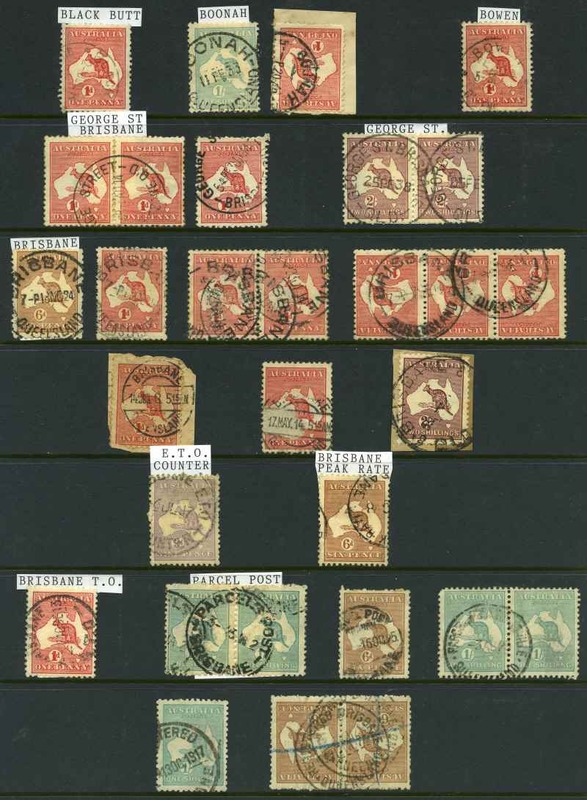 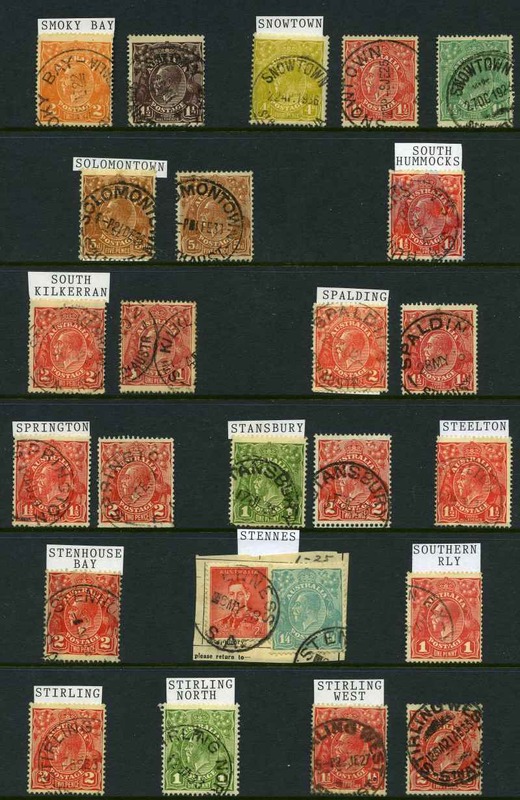 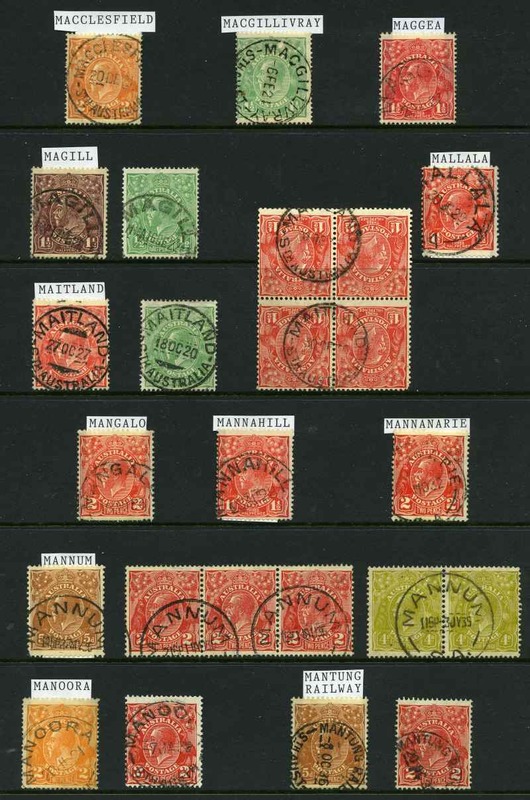 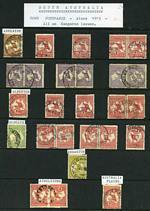 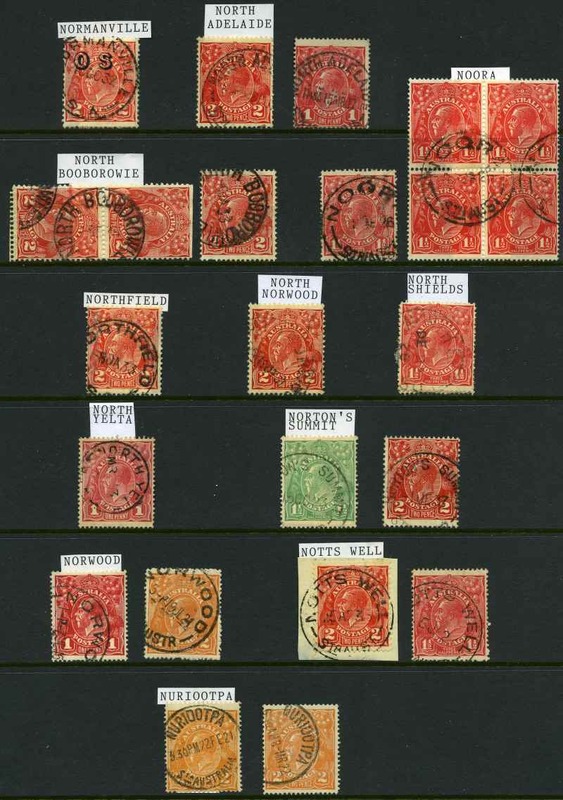 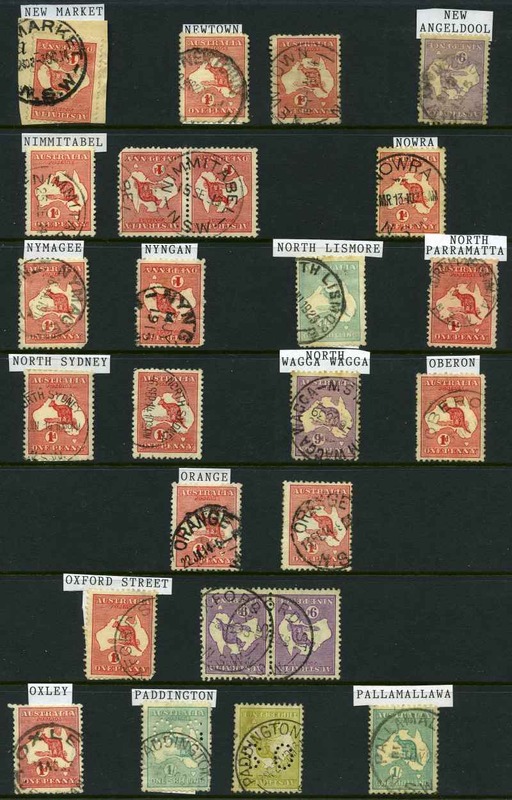 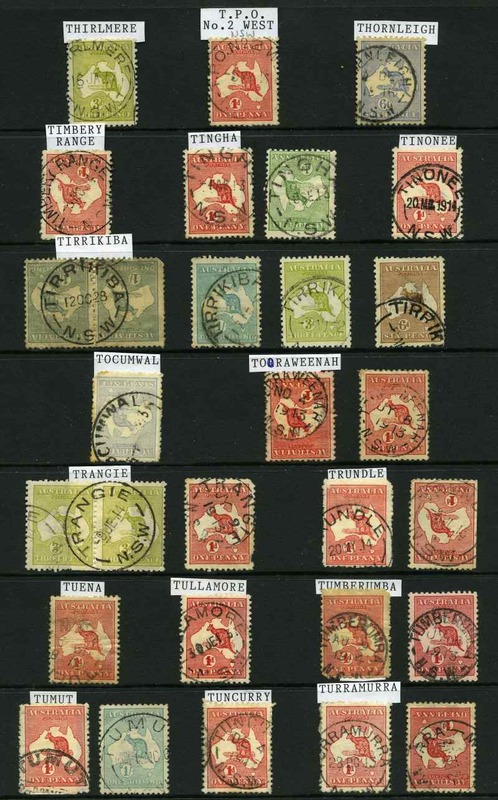 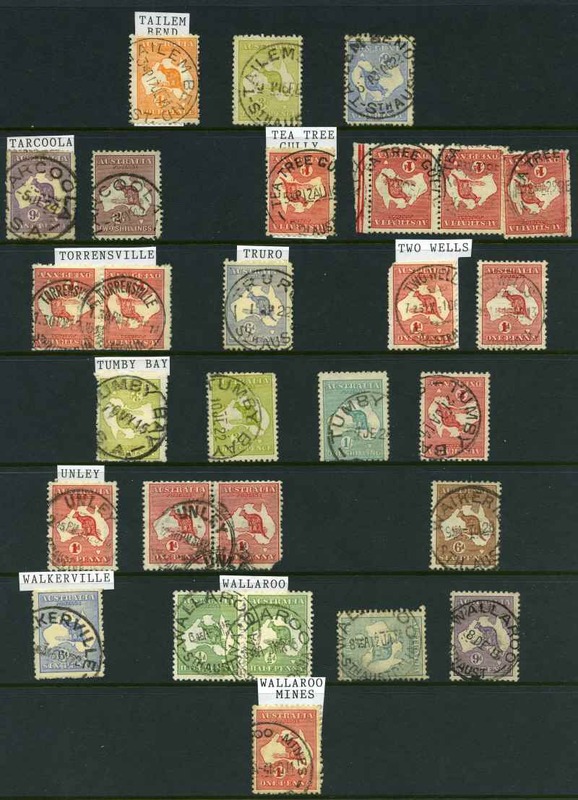 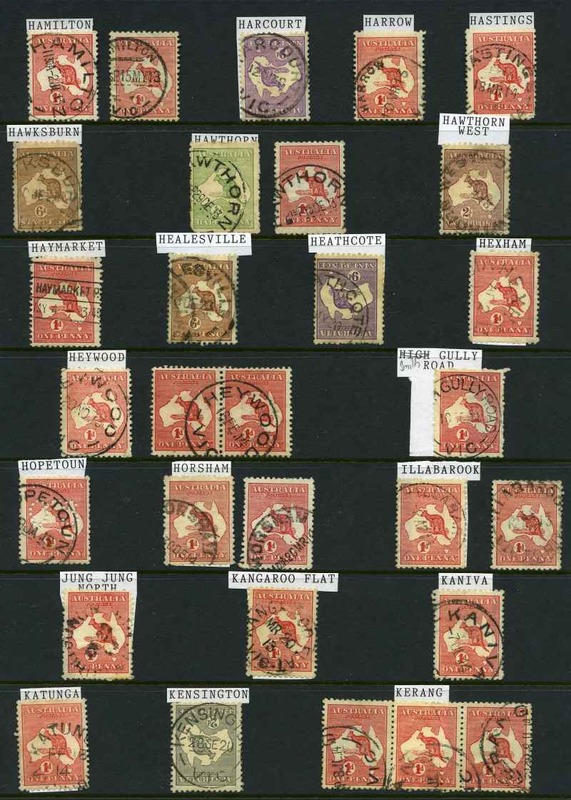 Collection of 20 different Commonwealth Type Circular Date Stamp postmarks on ½d Orange KGV on piece including Adelaide River, Banka Banka, Birdum, Brock's Creek, Borroloola, Brunette Downs, Daly Waters, Maranboy, Mataranka, Newcastle Waters, Powell Creek, Rankine River, Timber Creek (smudged strike) and Wave Hill. 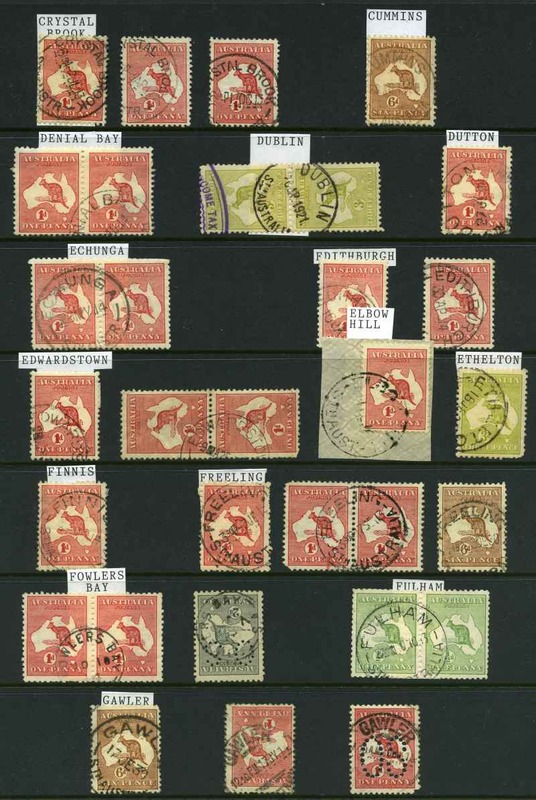 All full legible strikes dated 1935-36. 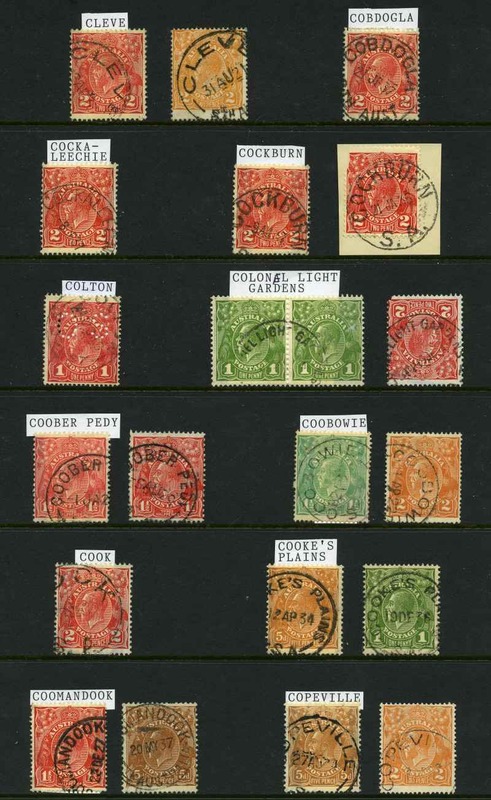 Noted items rated R (8), 2R (3), 3R (2) and 5R (1). Also additional CDS postmarks of Alice Springs (6), Darwin (8), Katherine (2) and Tennant Creek on KGV issues. 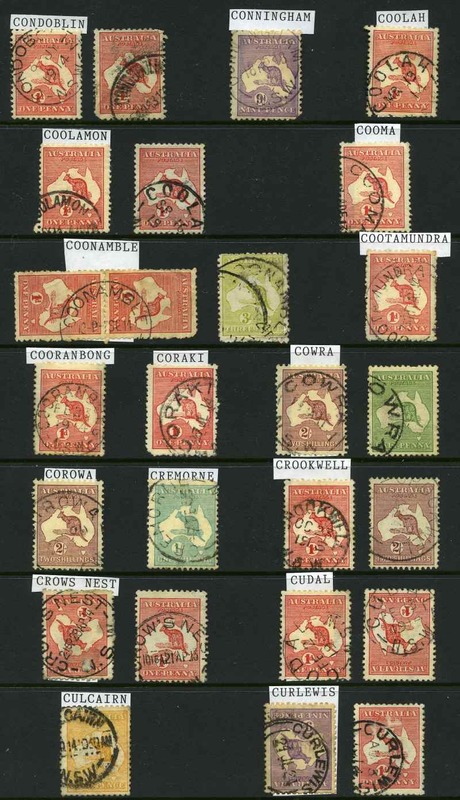 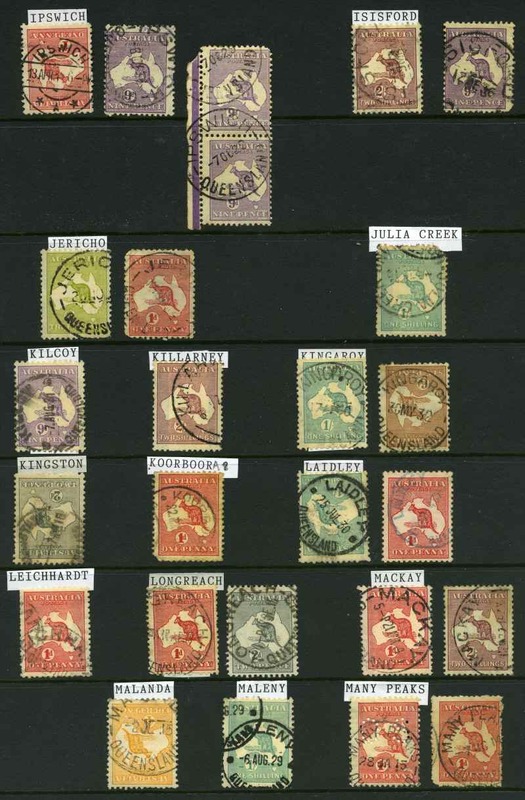 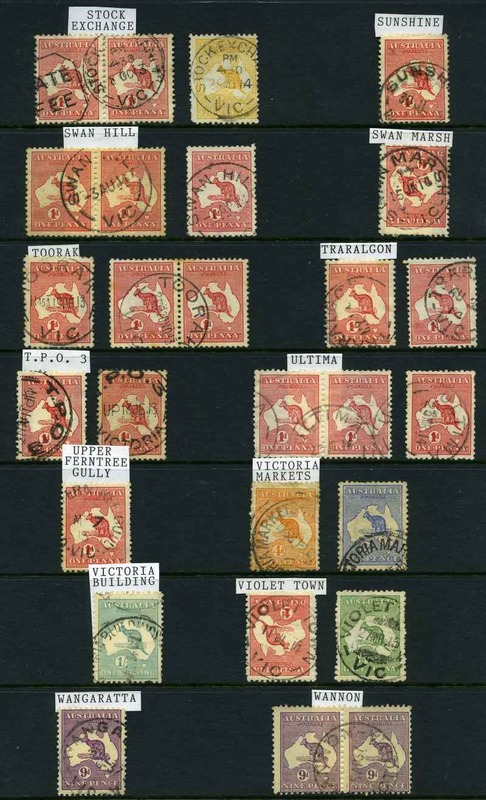 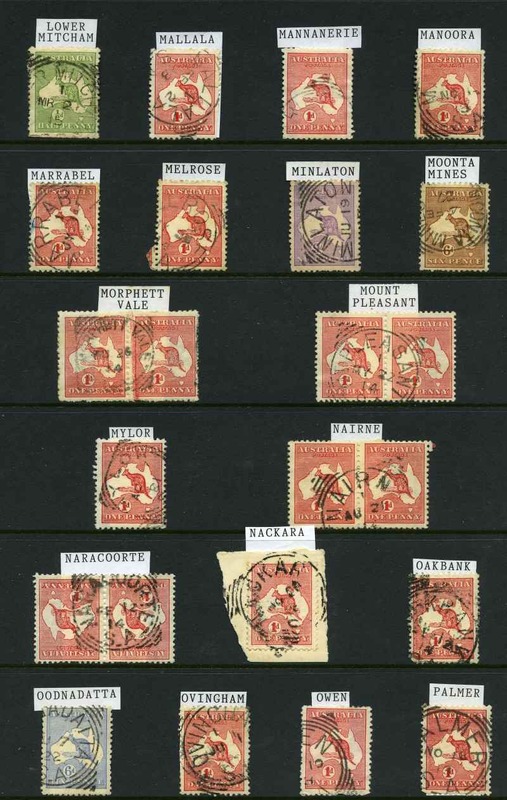 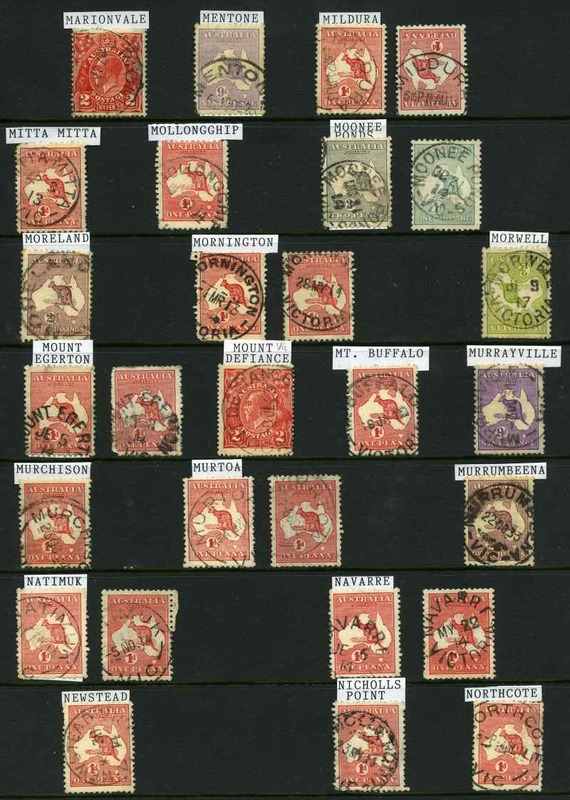 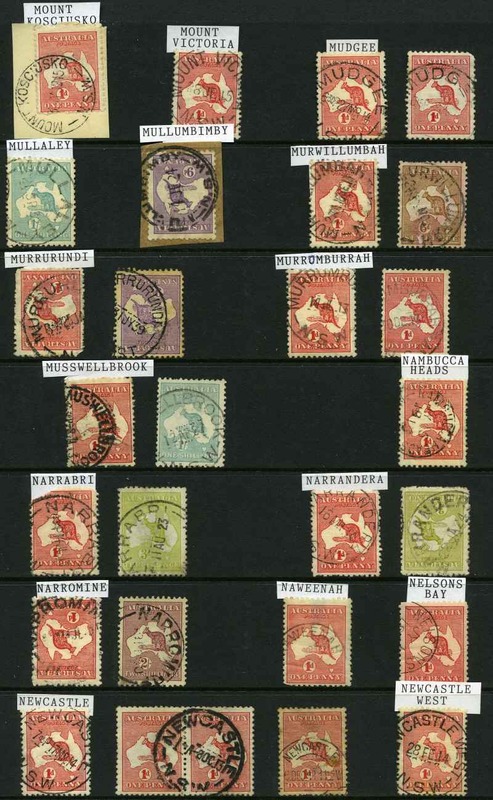 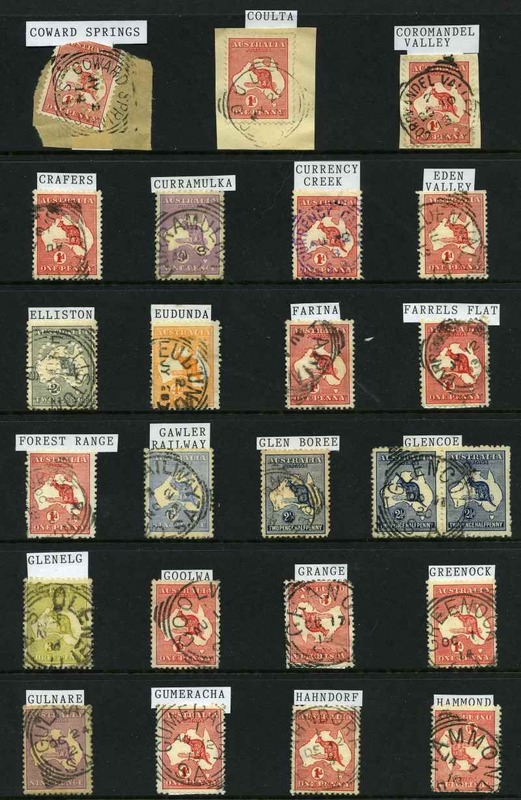 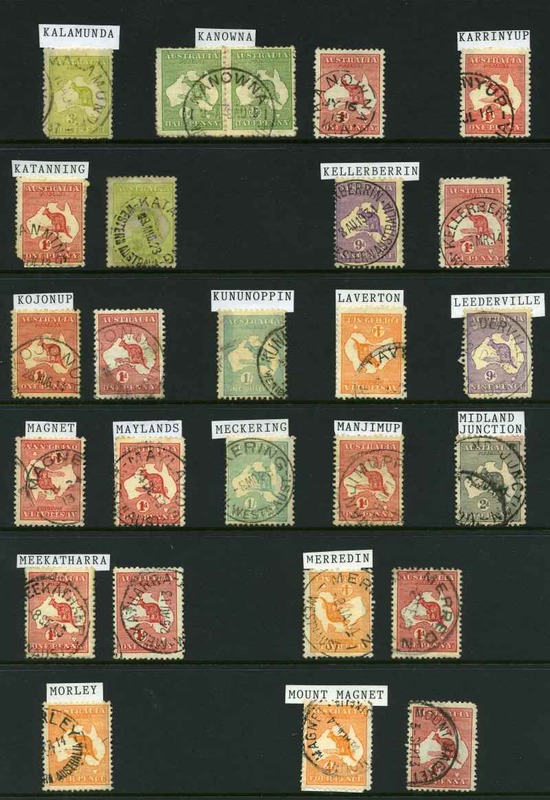 Collection of 257 mainly Commonwealth Type Circular Date Stamp postmarks on Kangaroo issues including Dulacca, Engelsberg, Home Hill, Julia Creek, Milmerran, Meringandan, Mount Cuthbert, Munbilla, One Mile and Woolloongabba. 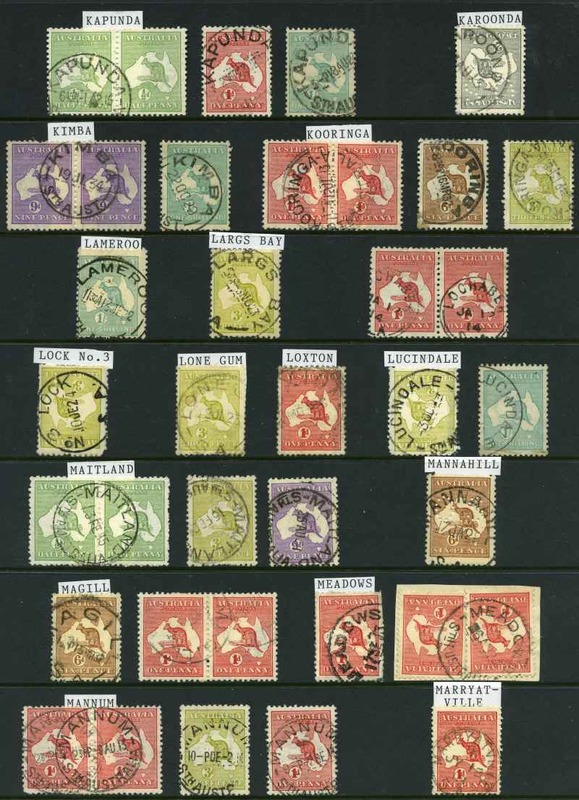 A good range of near complete strikes with 172 different towns represented. 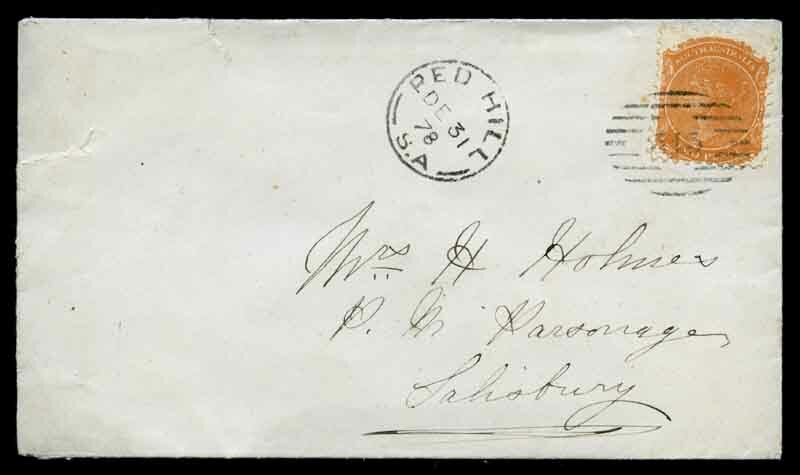 2d Orange-Red Queen Victoria, tied to December 1878 cover with clear No 313 Diamond Numeral cancellation and proving Red Hill full ring CDS postmark addressed to Salisbury. 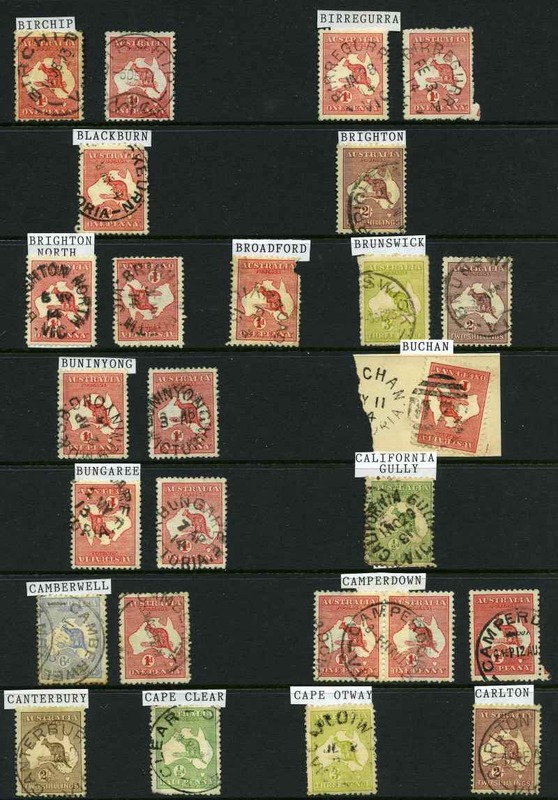 Railway full ring and Salisbury broken ring backstamps. 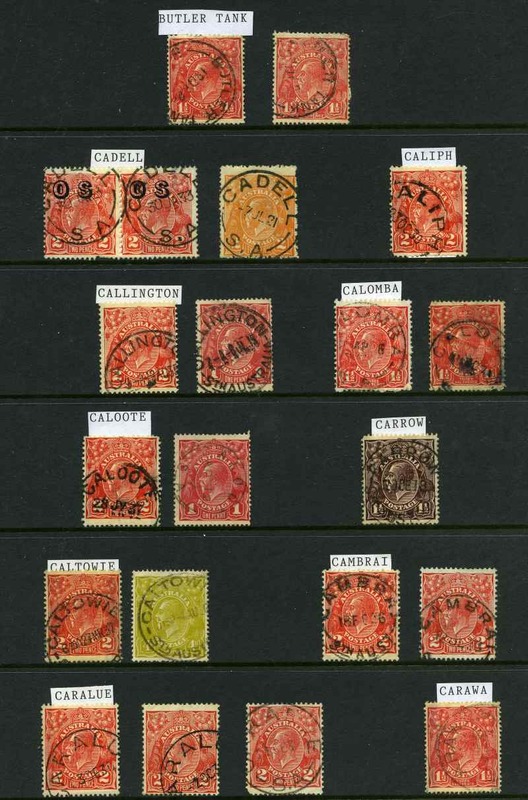 Minor tear at top left. 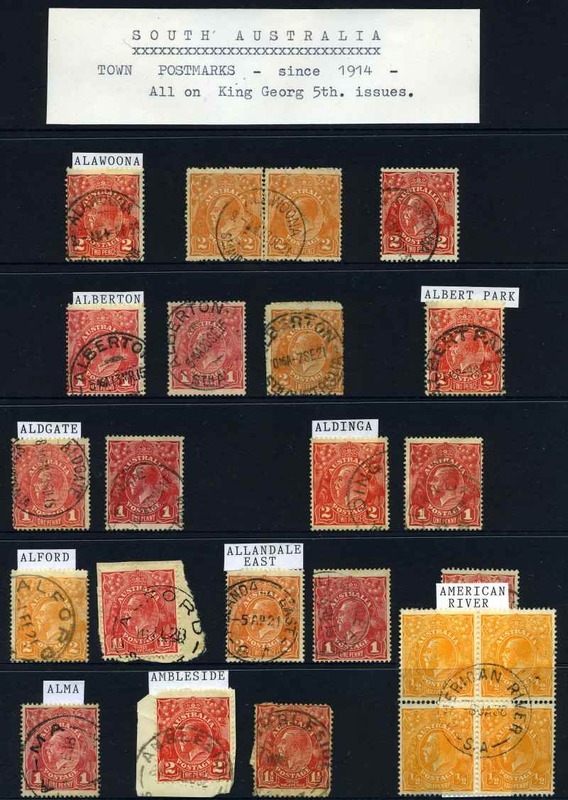 Rare and attractive. 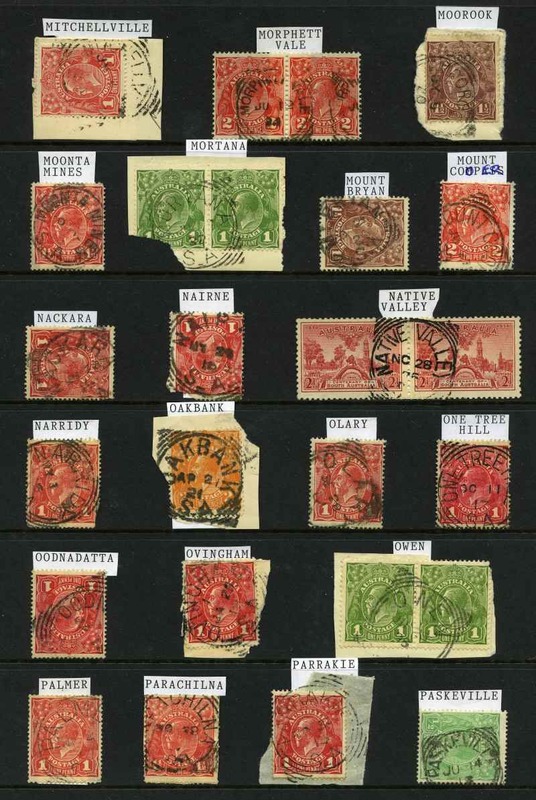 Rated RRR. 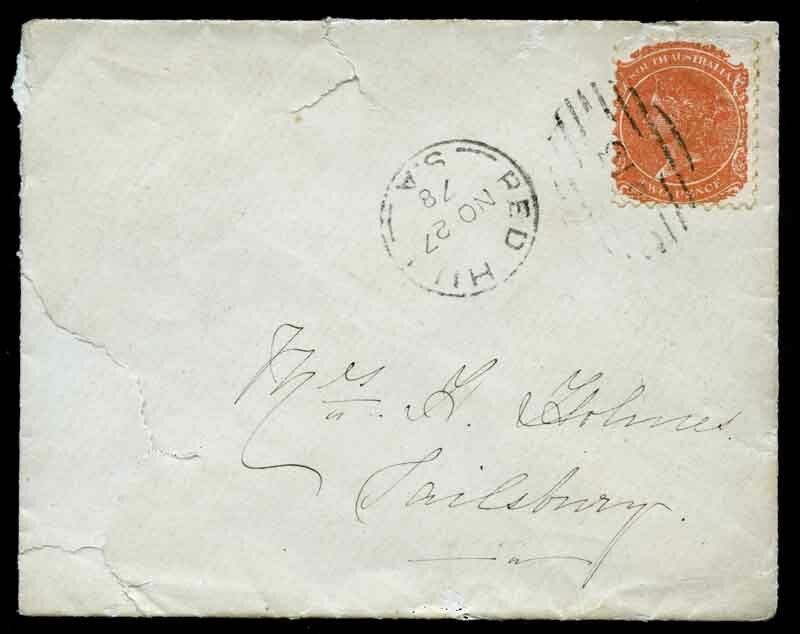 2d Orange-Red Queen Victoria, tied to November 1878 cover with faint No 313 Diamond Numeral cancellation and proving Red Hill full ring CDS postmark addressed to Salisbury. 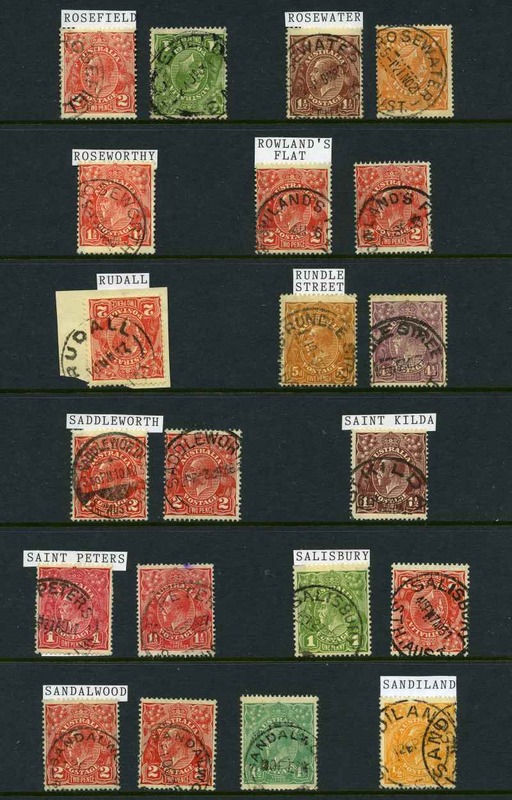 Railway full ring and Salisbury broken ring backstamps. 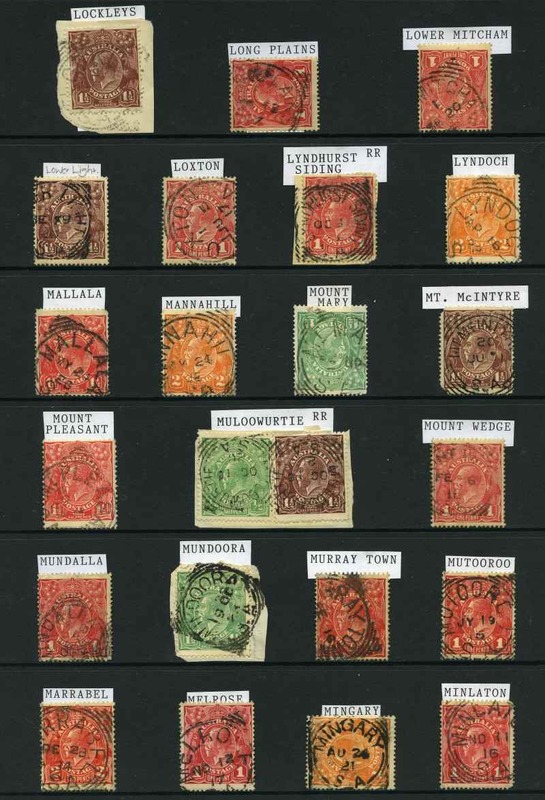 Some tears at left. 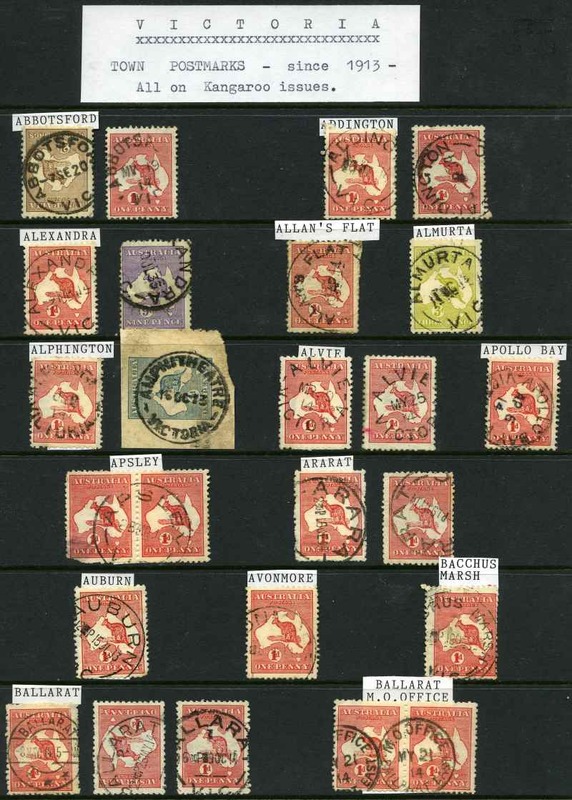 Rare. 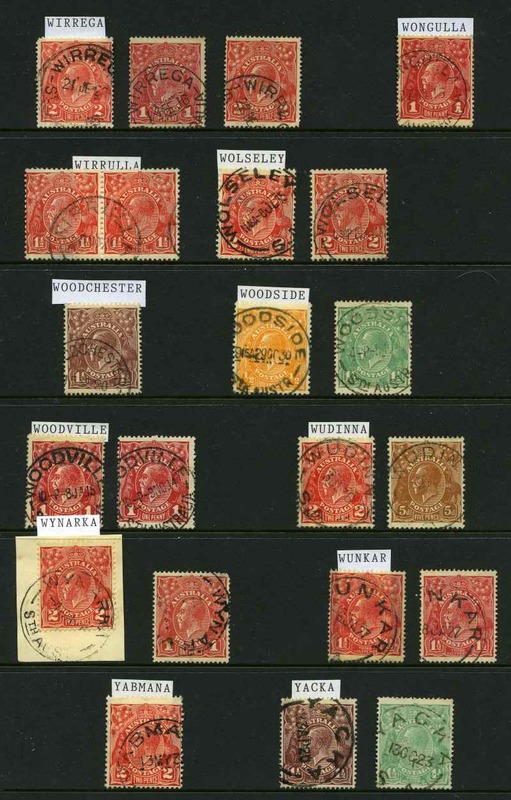 Rated RRR. 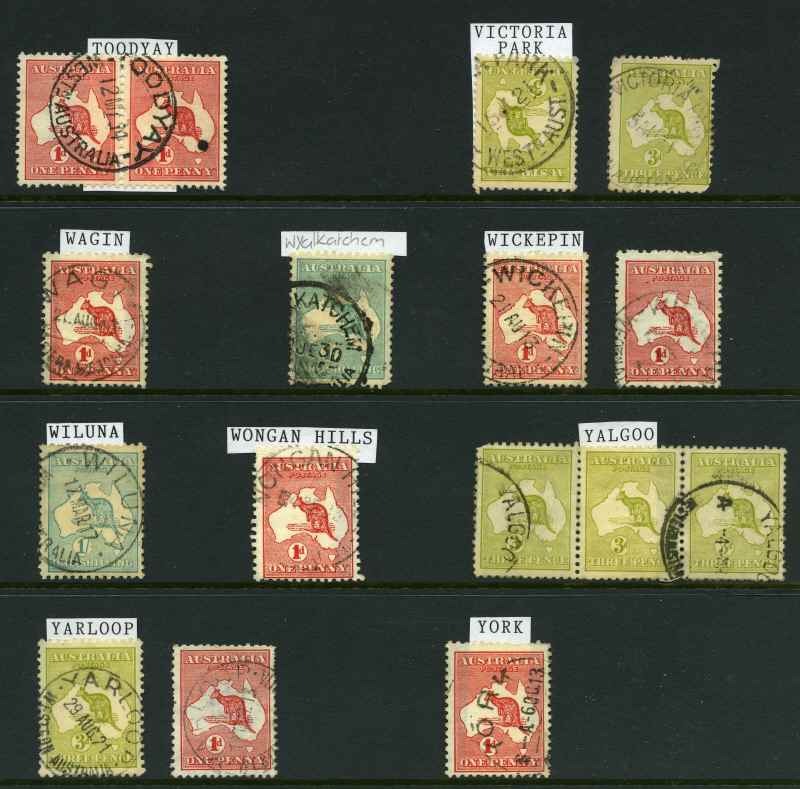 Alice Springs 28mm, Elliston, Farina 27mm, Mount Wedge (poor strike), Pt Pirie West and Talia 28mm squared circle cancellations tying South Australian and KGV issues to registered cover fronts. 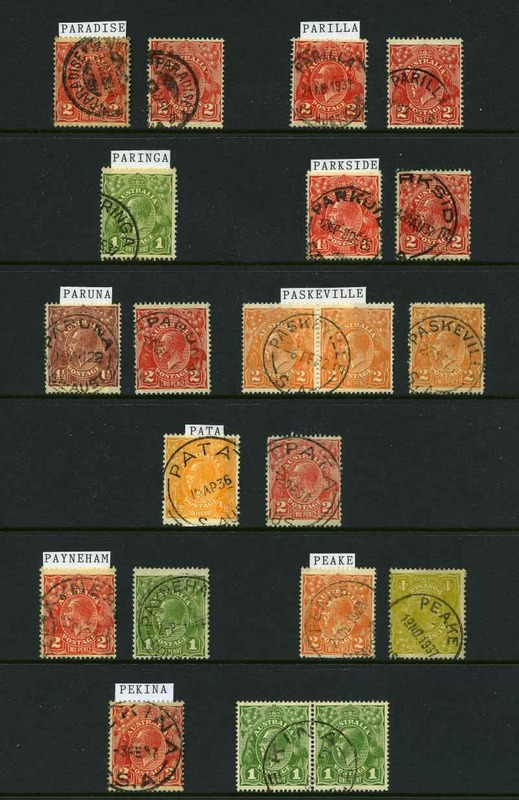 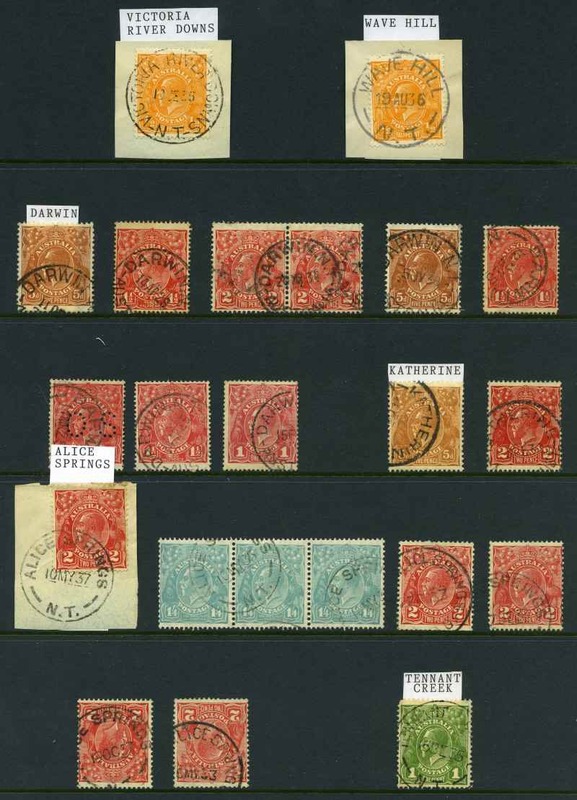 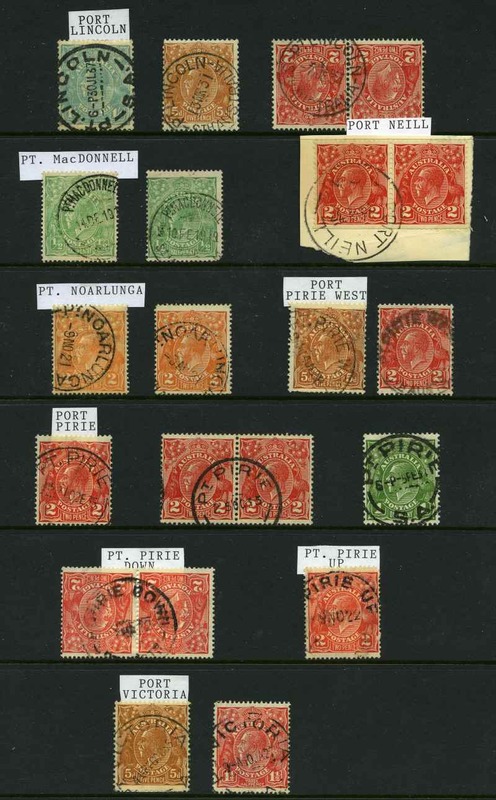 American River Type II squared circle cancellation on 1902 3d Olive-Green block of 6 and 4d Red-Orange block of 4 Thin Postage perf 12 Long Toms and 1904 1/- Brown Thick Postage Wmk crown SA perf 12 Long Tom block of 4, all perforated SA with gum. 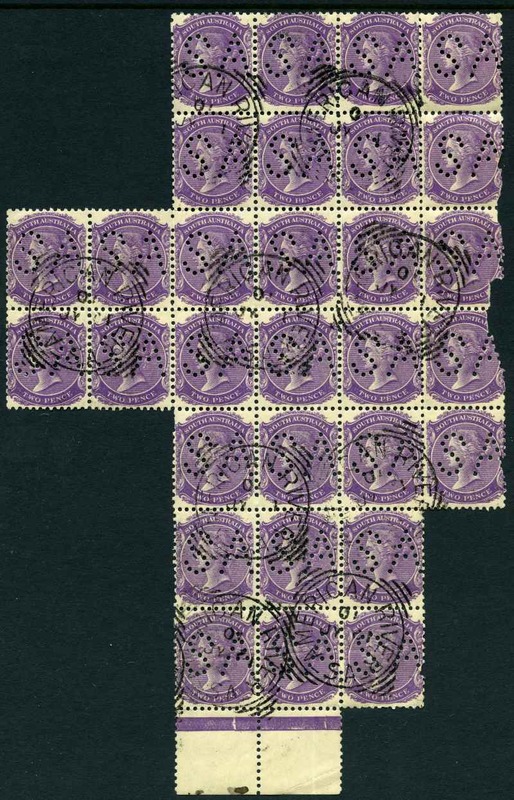 Full clear strikes rated R.
American River Type II squared circle cancellation on 1906 2d Violet block of 30 perforated SA with gum. 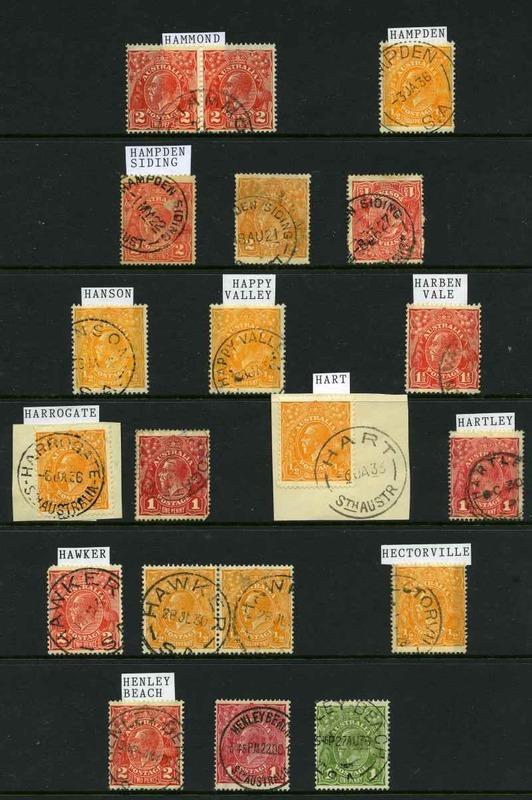 Several units with faults. 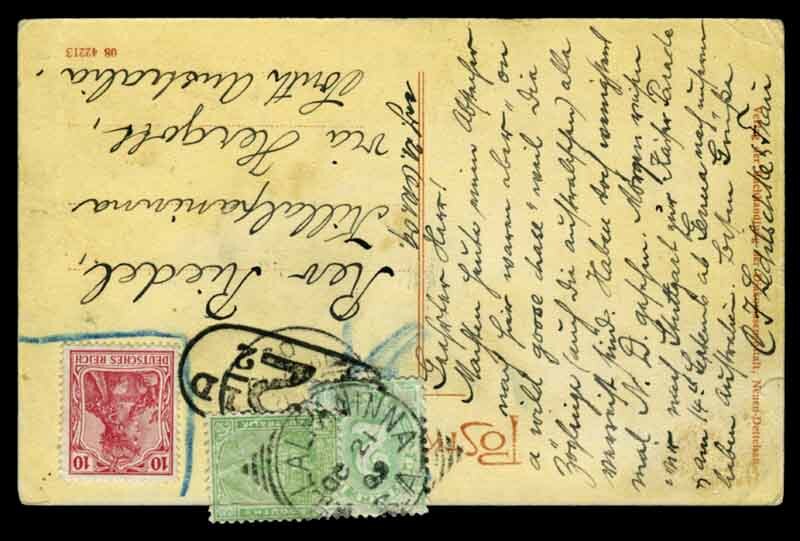 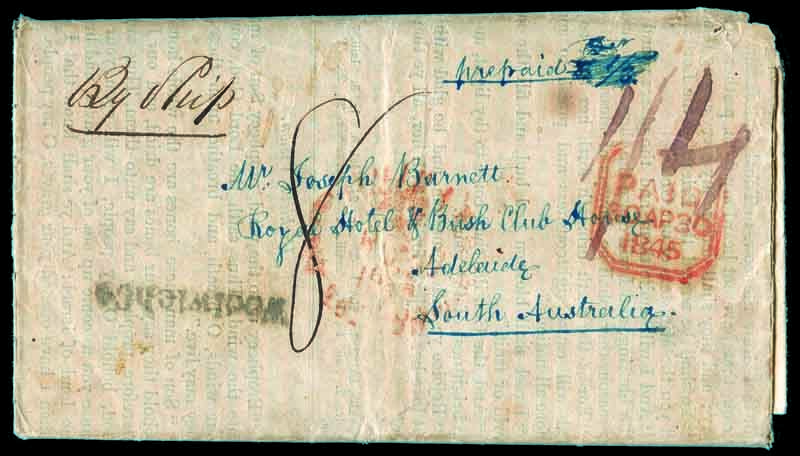 Full clear multiple strikes rated R.
1909 Postcard from Germany to South Australia, Underpaid with oval boxed T2½d postal marking, franked with South Australia ½d GPO Adelaide and 2d Postage Due, tied by 27mm Killalpaninna Squared Circle cancellation. 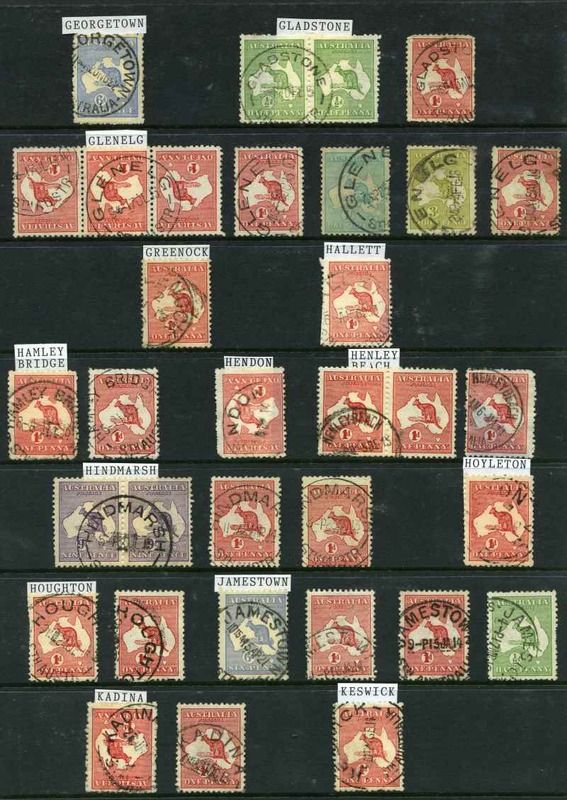 Near complete full strike. 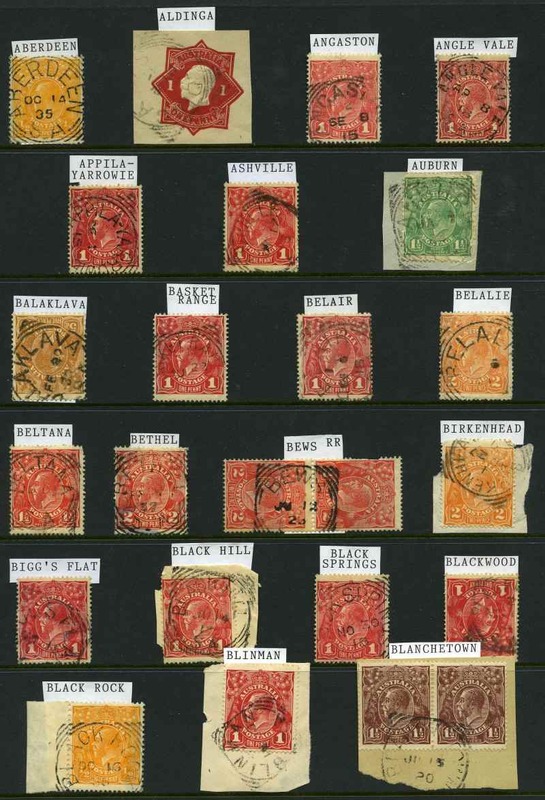 Rated 2R. 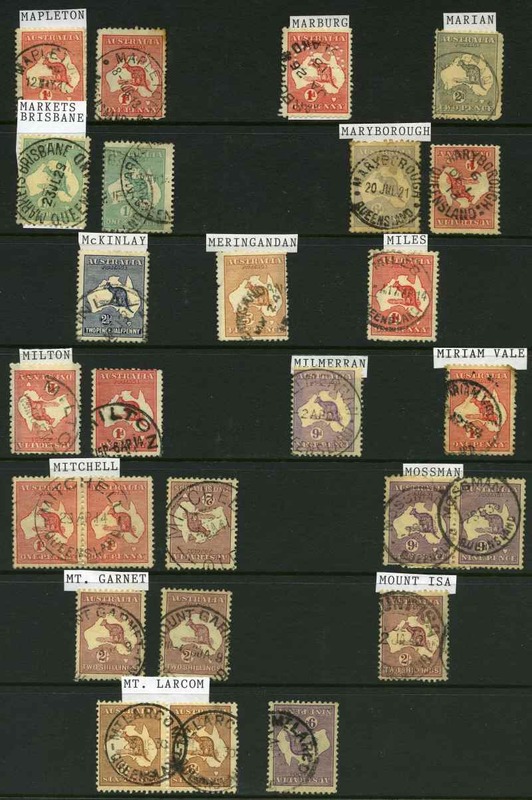 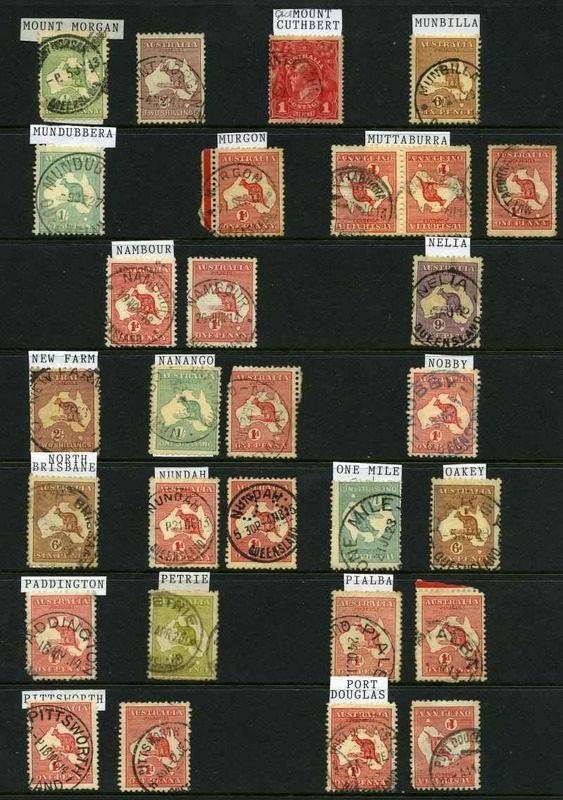 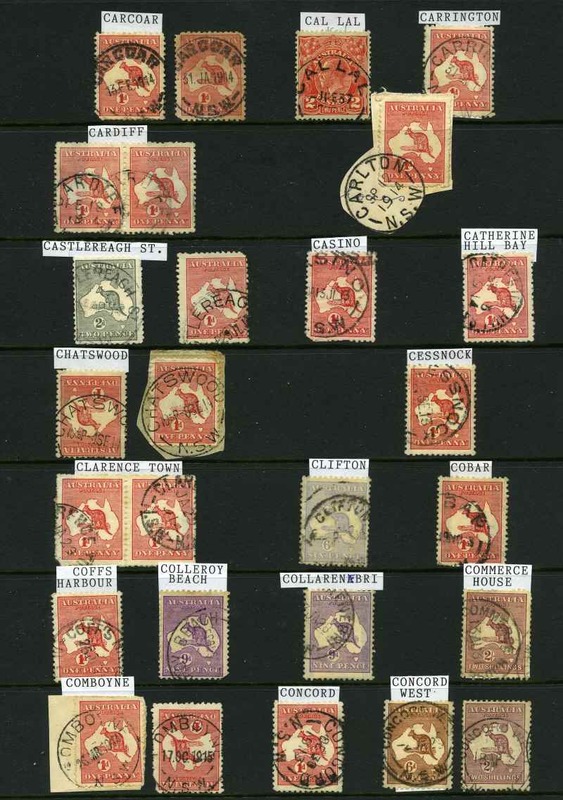 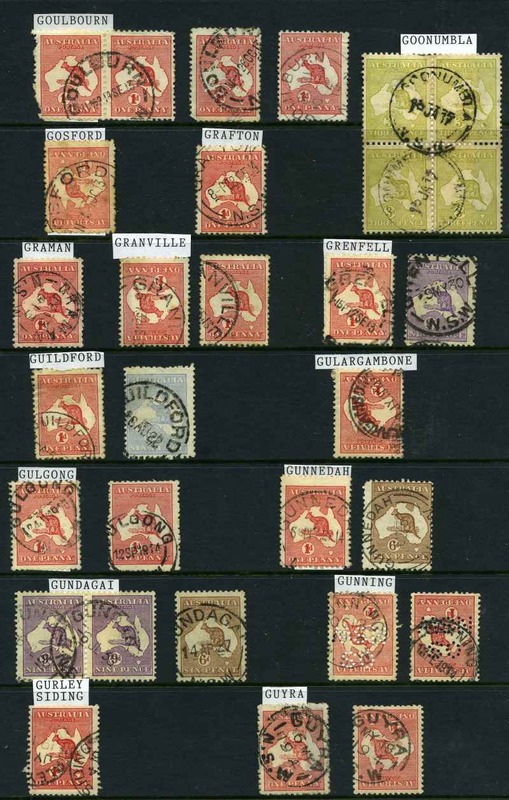 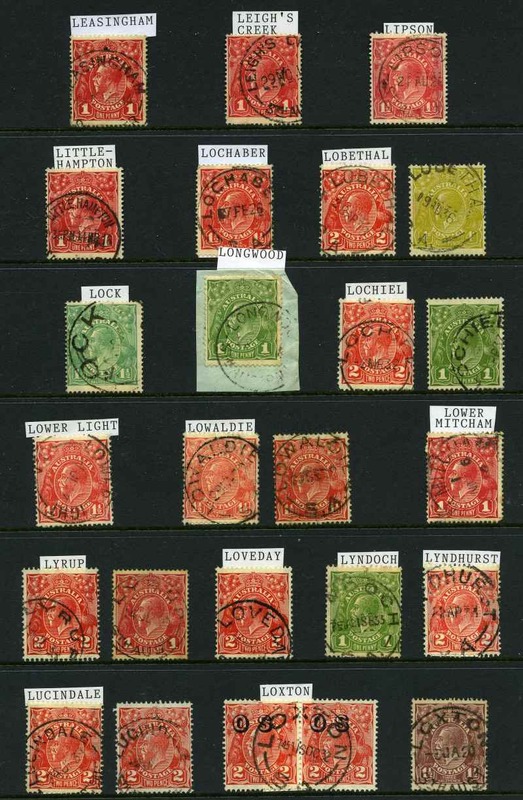 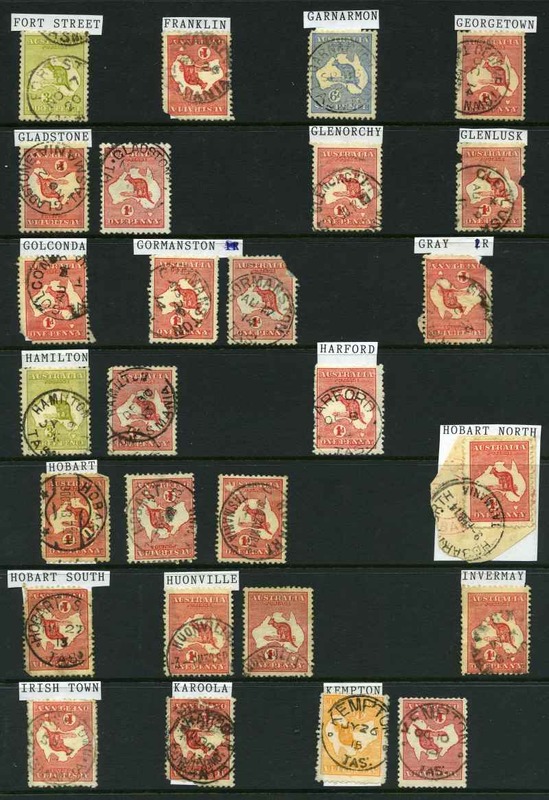 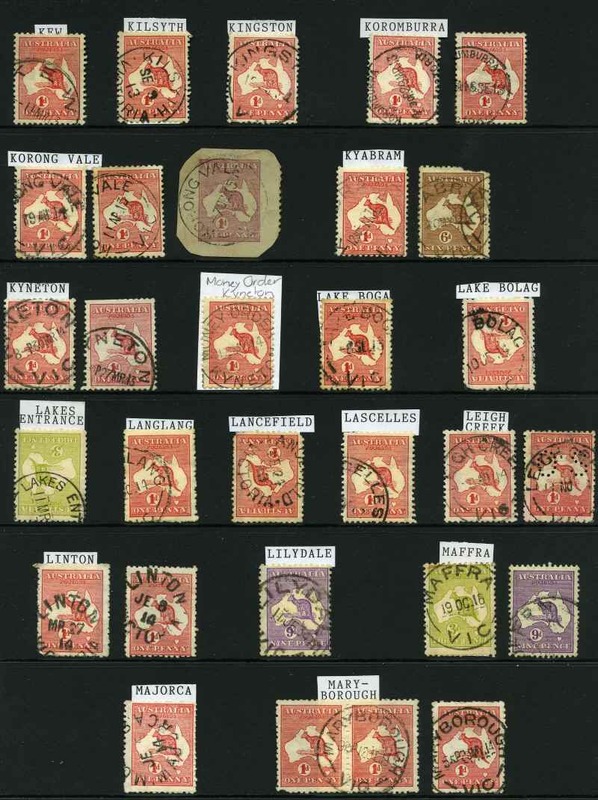 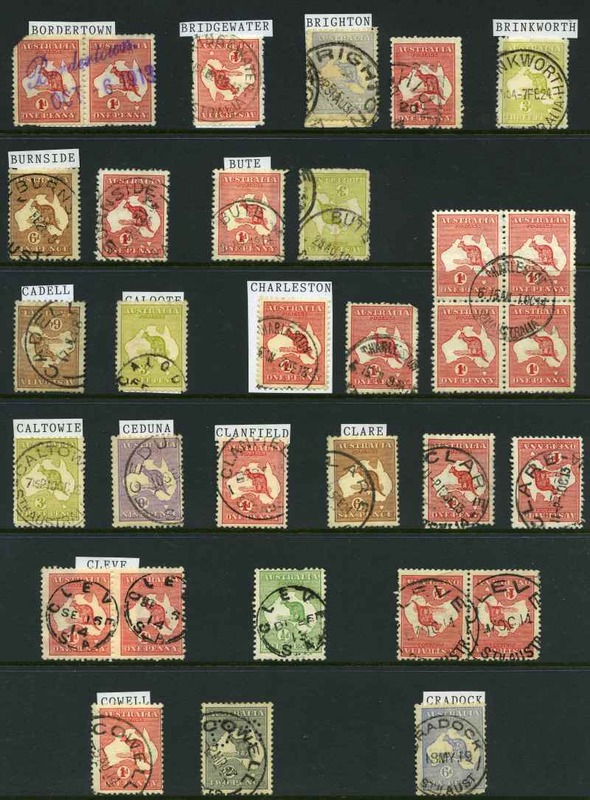 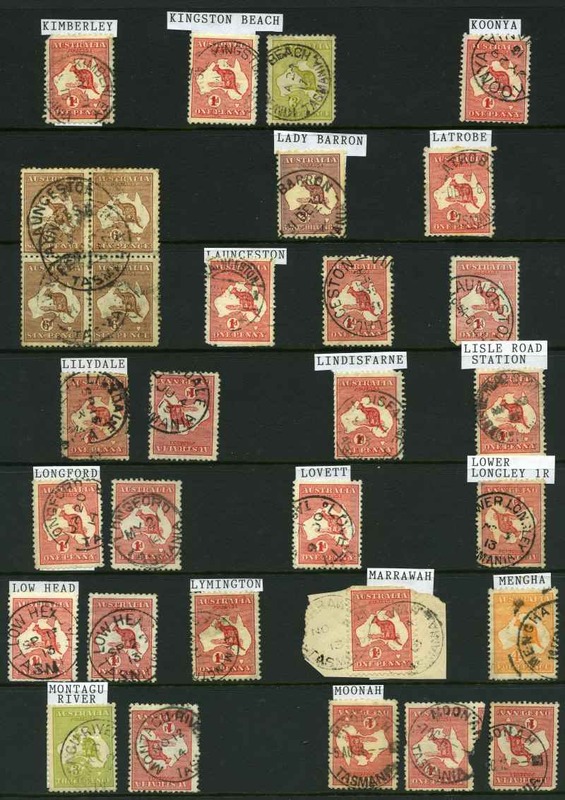 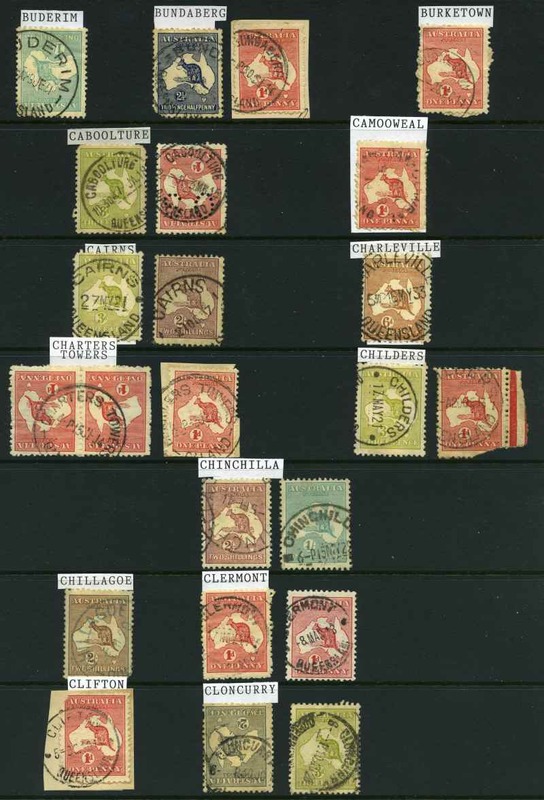 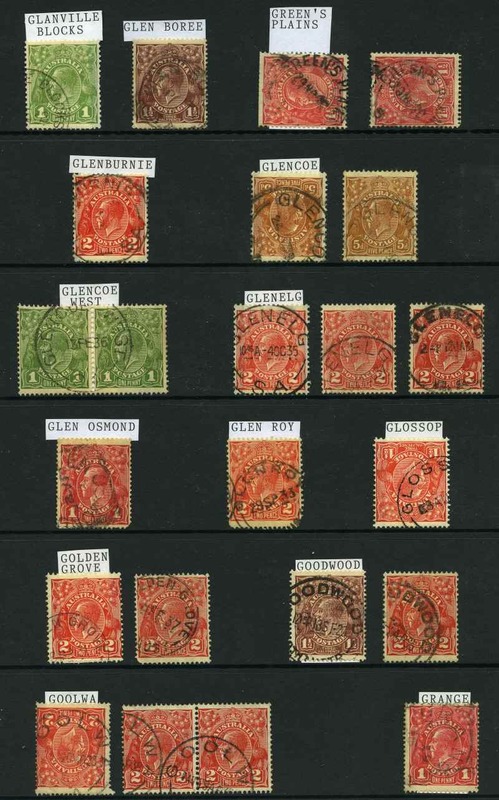 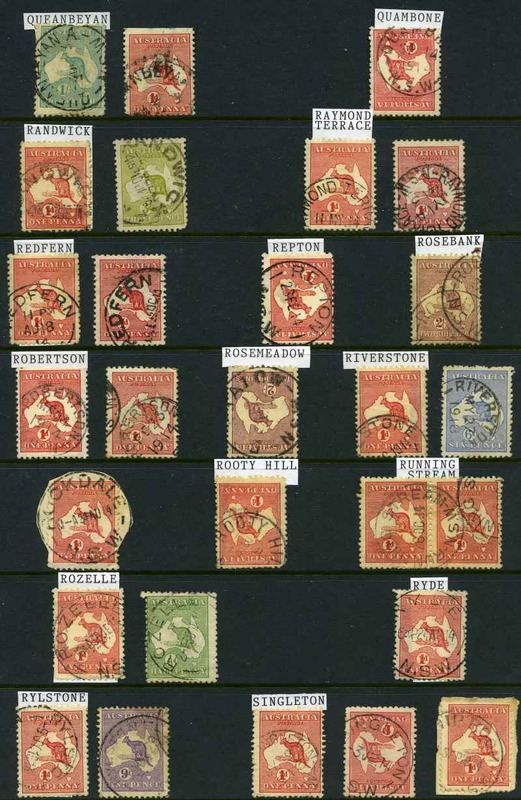 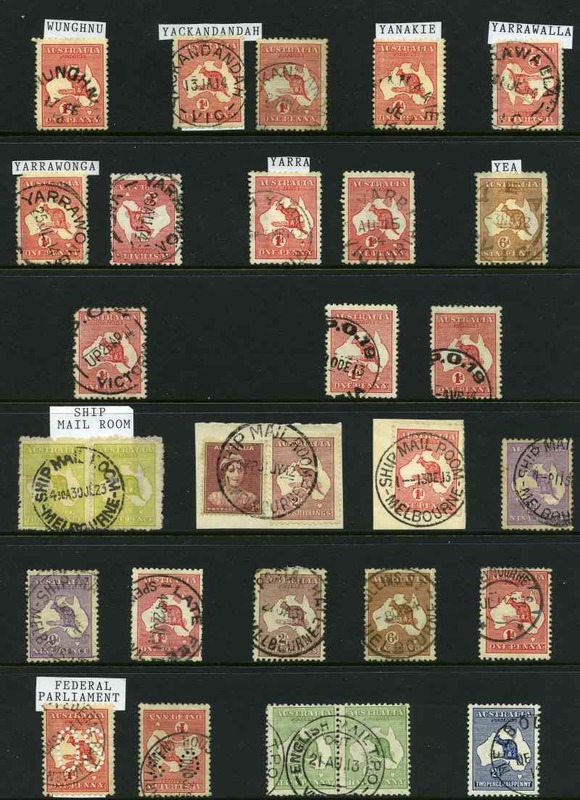 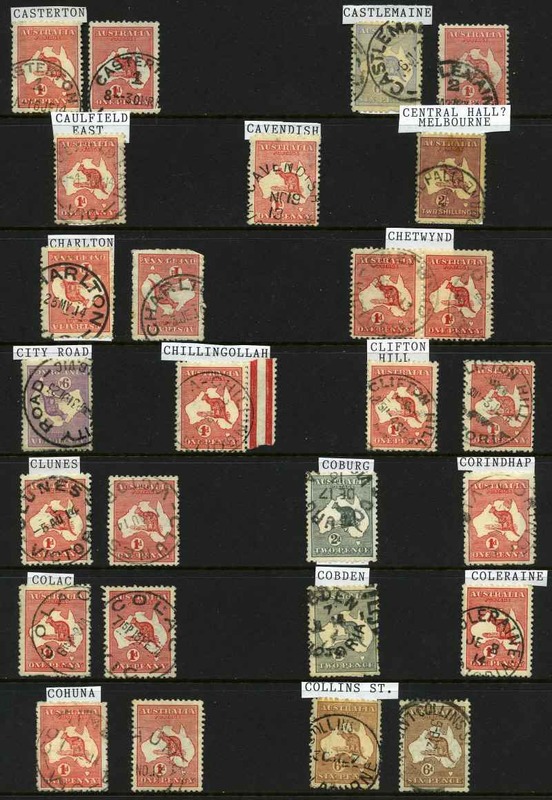 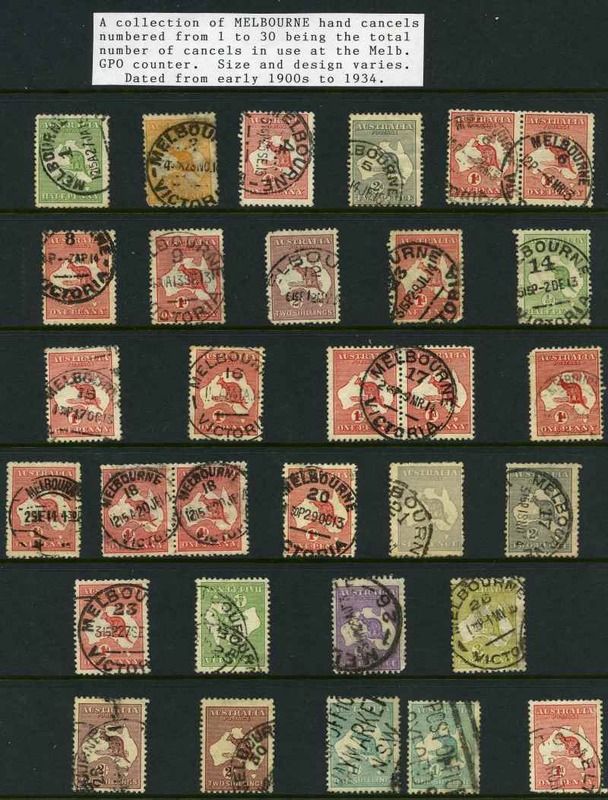 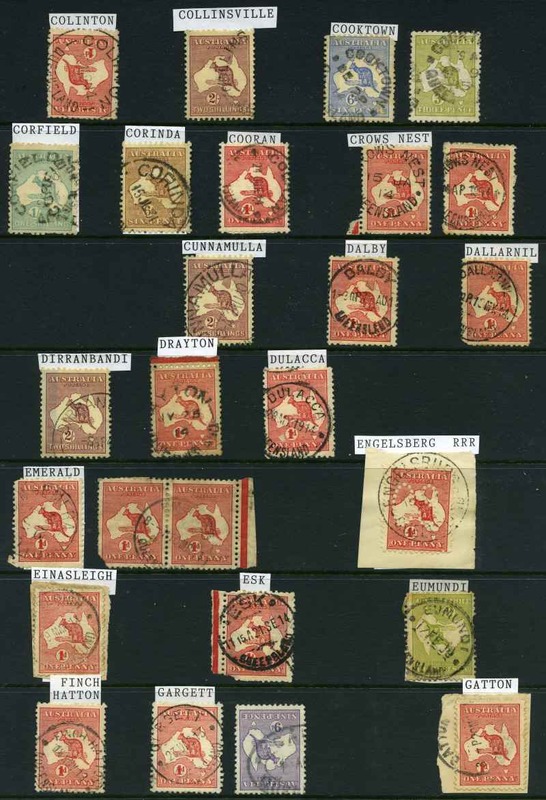 Collection of 127 different squared circle cancellations on Kangaroo issues including Ashville, Belalie, Charra, Glen Boree, Glencoe, Grange, Huddleston, Lochiel and Mylor. 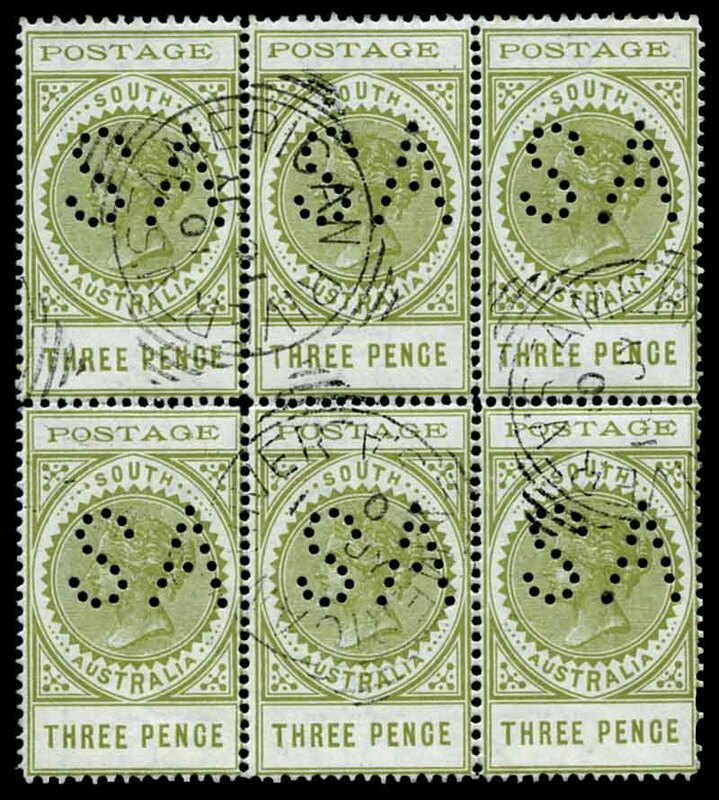 A good range of complete or near complete strikes. 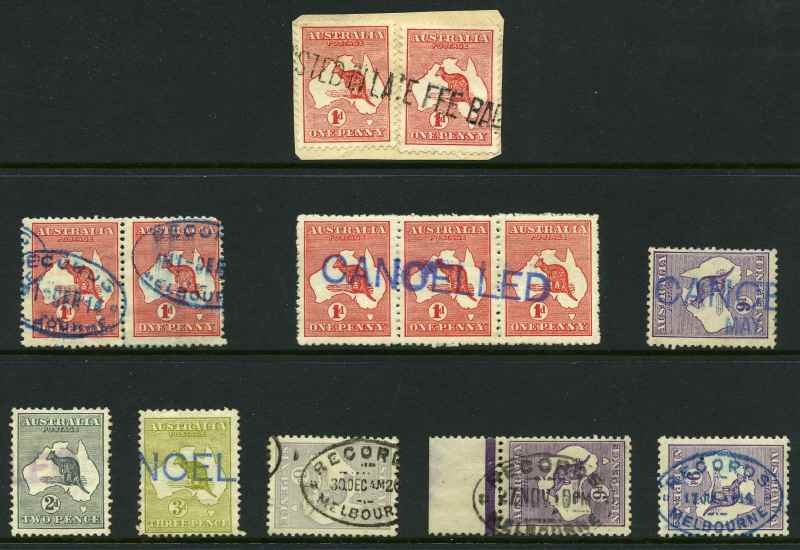 Noted items rated R (18), 2R (8) and 3R (1). 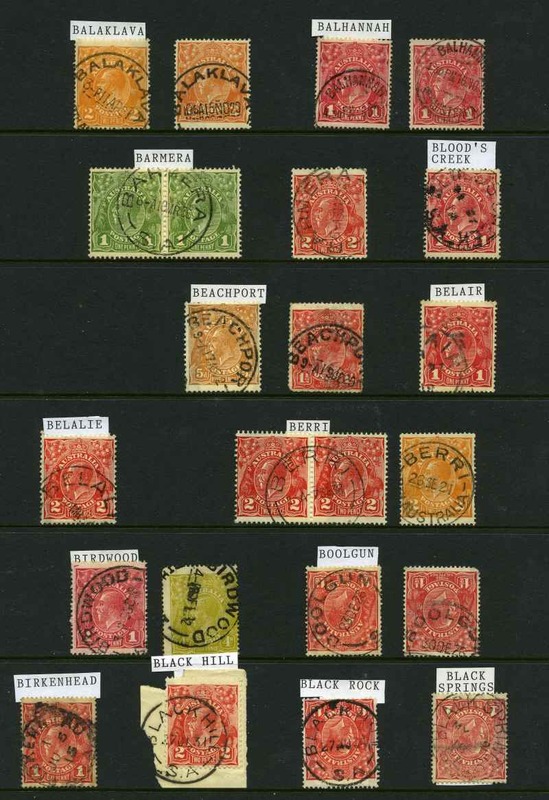 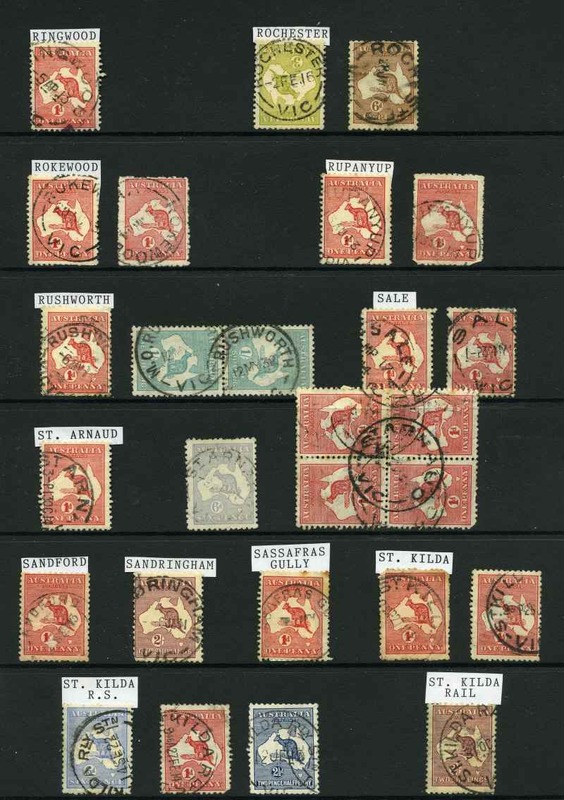 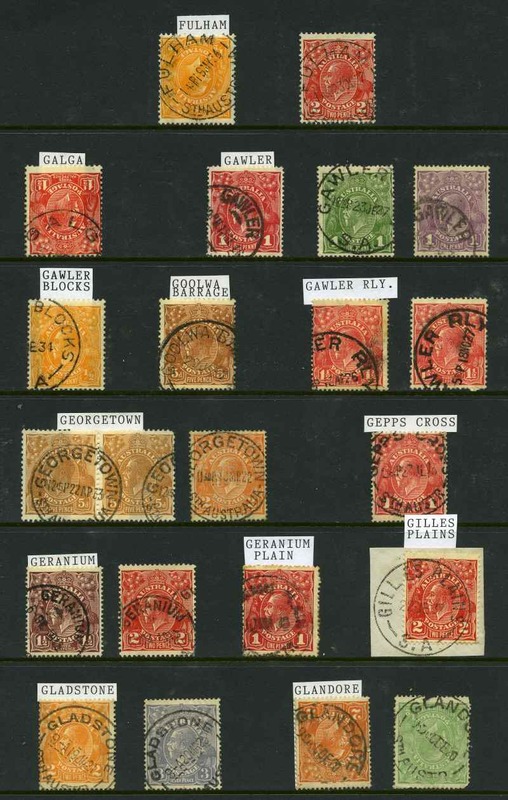 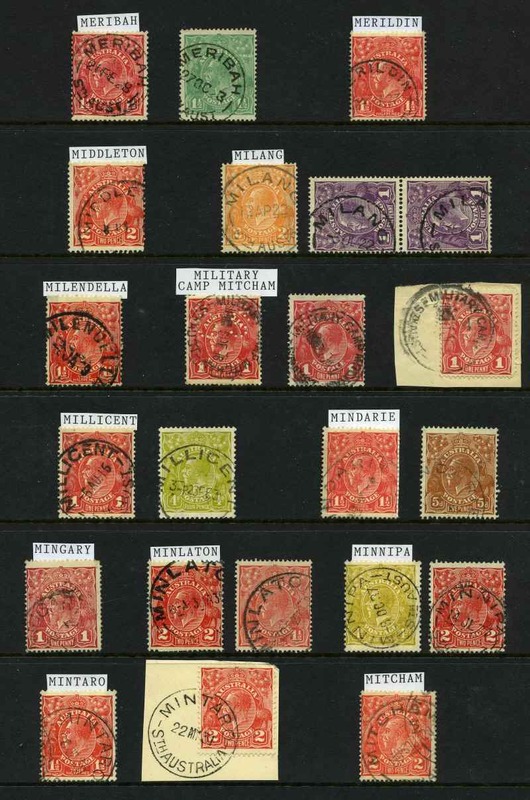 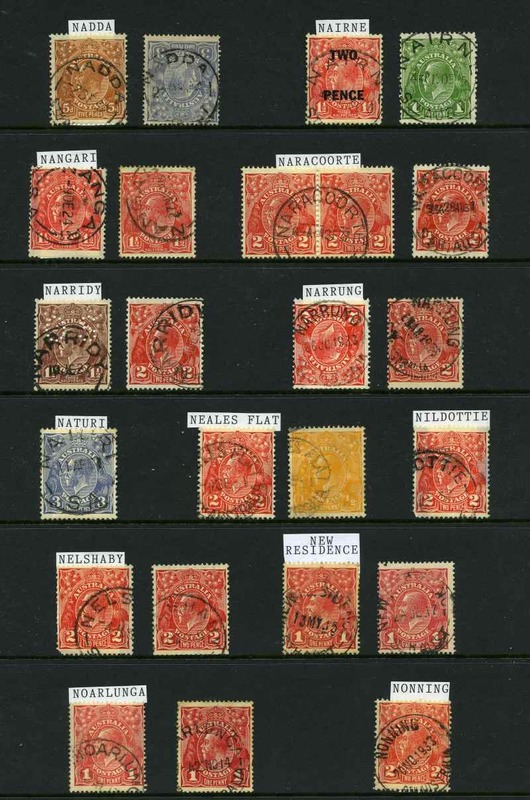 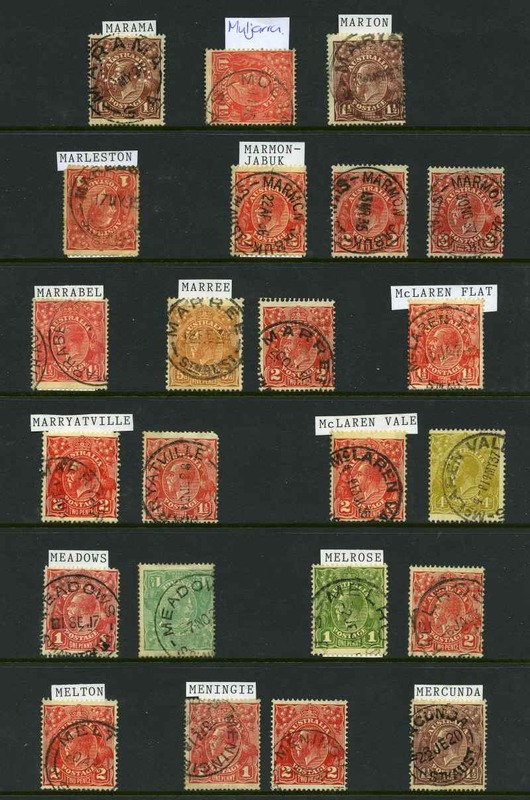 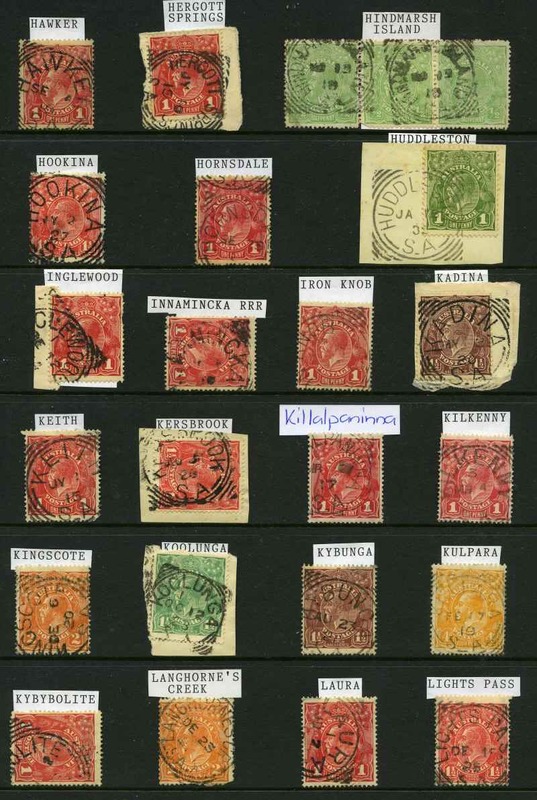 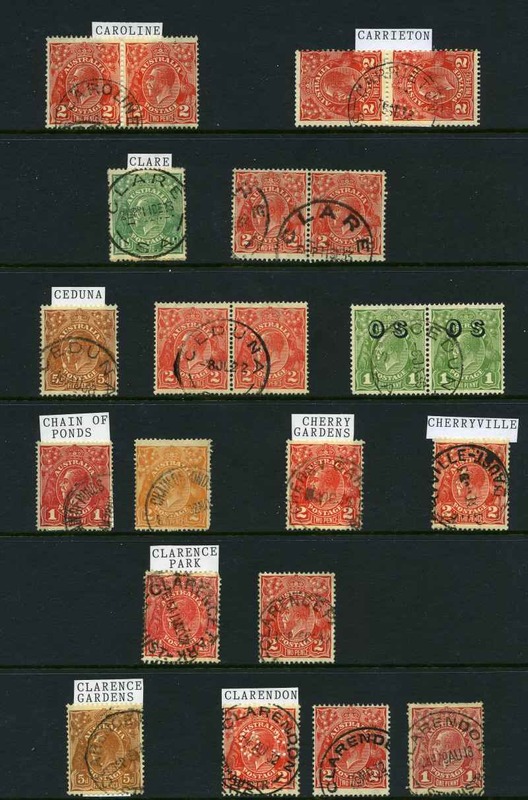 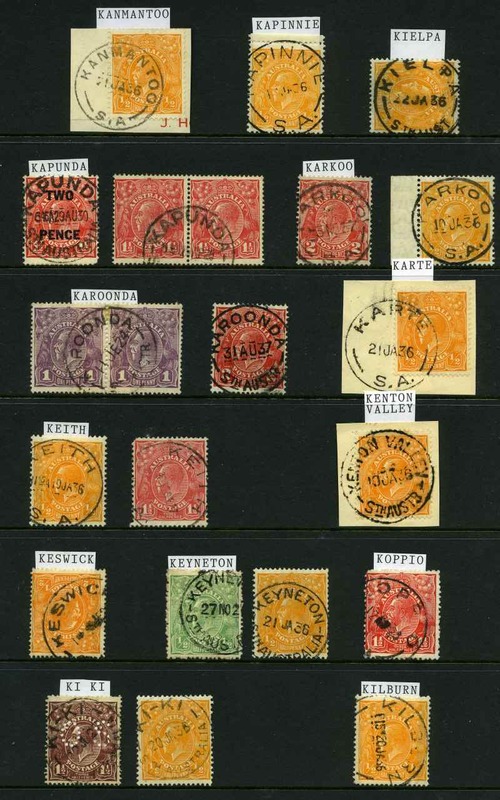 Colletion of 199 different squared circle cancellations on KGV issues including Ashville, Belalie, Bews, Bigg's Flat, Black Springs, Booleroo, Bookabie, Brucefield, Butler, Carey's Gully, Cherry Gardens, Custon, Eba, Fords, Frankton, Glencoe, Golden Grove, Grange, Hamilton, Hanson, Hornsdale, Huddleston, Inglewood, Innaminka, Killalpaninna, Kulpara, Kybybolite, Lockleys, Long Plains, Lyndhurst Siding, Mt Mary, Mt McIntyre, Mount Wedge, Muloowurtie, Murray Town, Mutooroo, Mitchellville, Parrakie, Piccadilly, Yallunda Flat, Yardea and Yudnapinna. 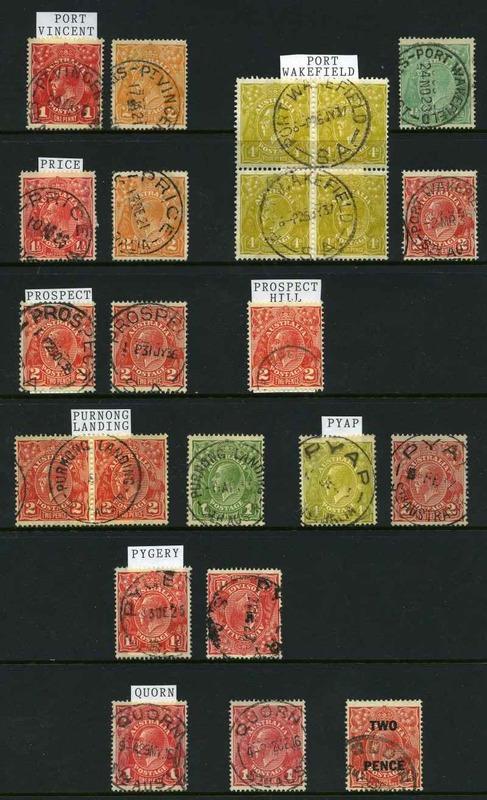 A good range of complete or near complete strikes. 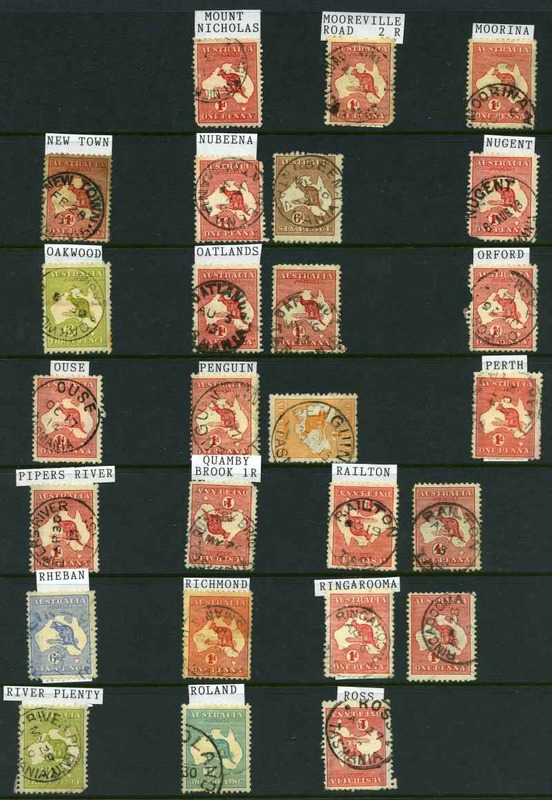 Noted items rated R (39), 2R (26), 3R (13) and 4R (3). 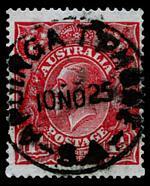 Apoinga T'Phone 10NO25 CDS postmark on 1½d Red KGV. 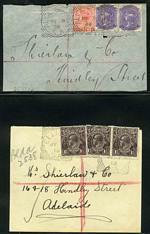 Near complete strike with ink annotation on reverse. Rated 5R. 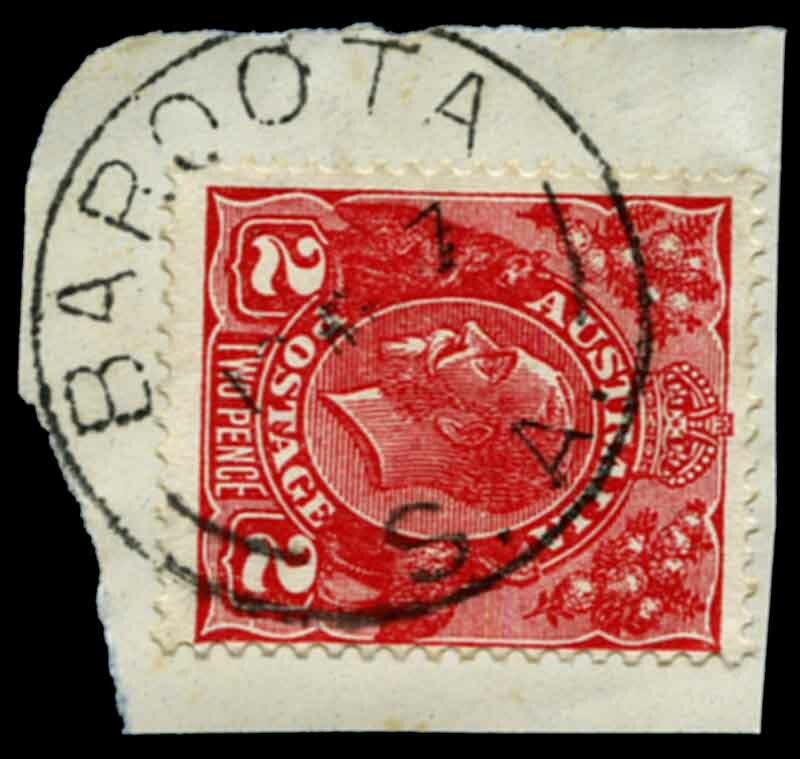 Baroota CDS postmark on 2d Red KGV on piece. 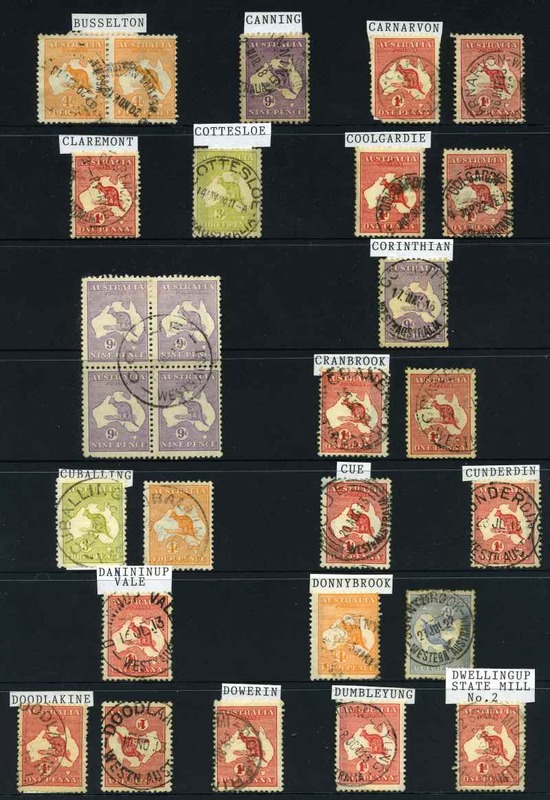 Near complete full strike. 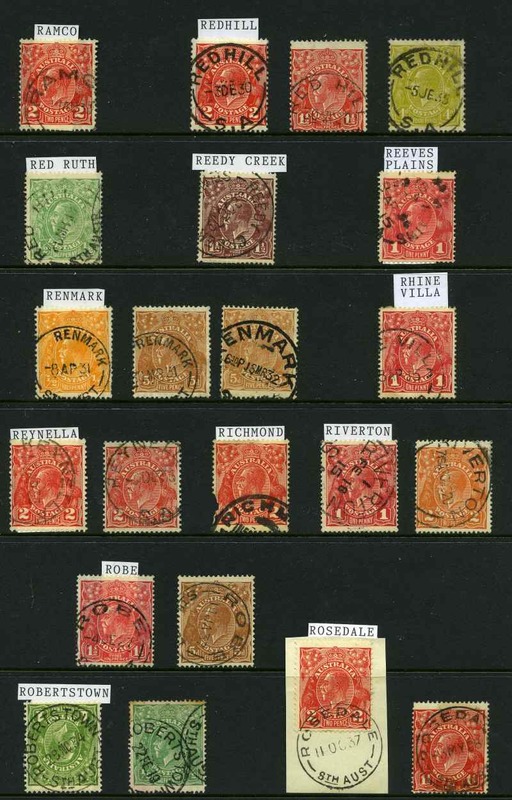 Rated 3R. 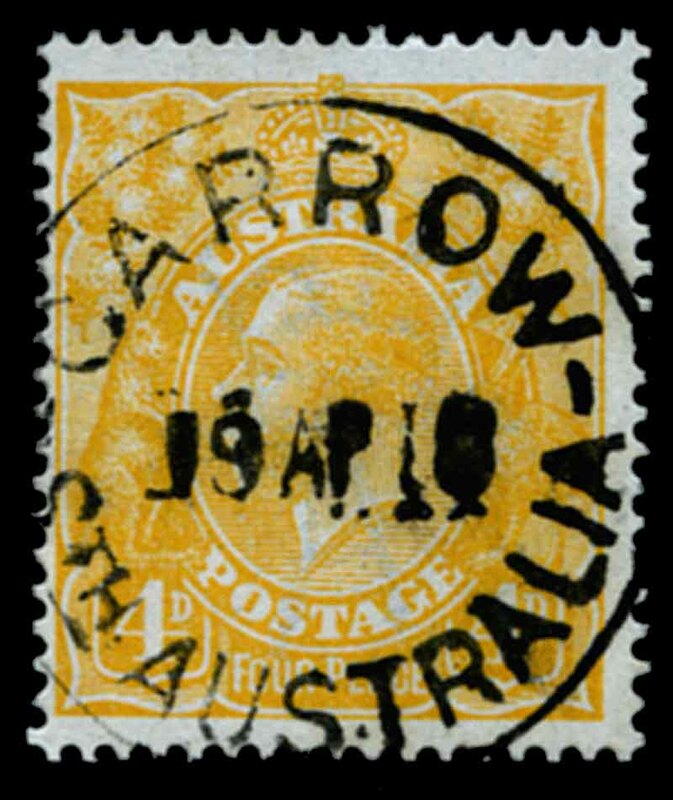 Carrow 19AP1? 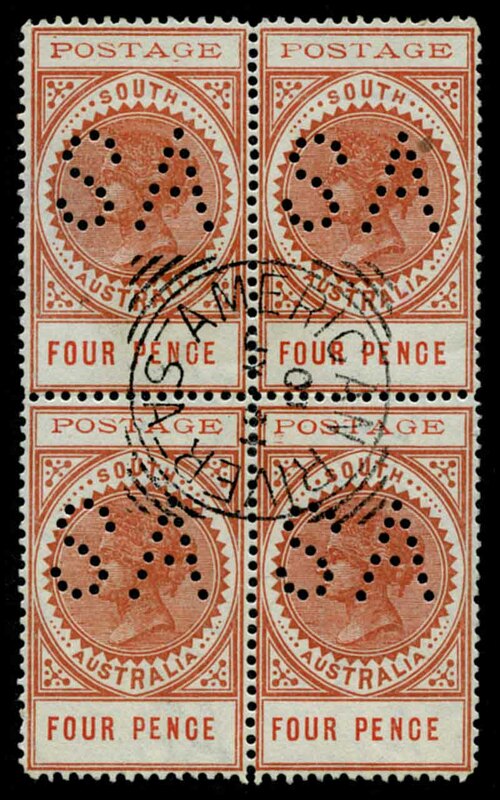 CDS postmark on 4d Orange KGV. 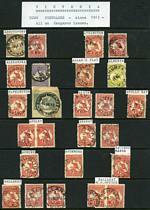 Complete full strike. 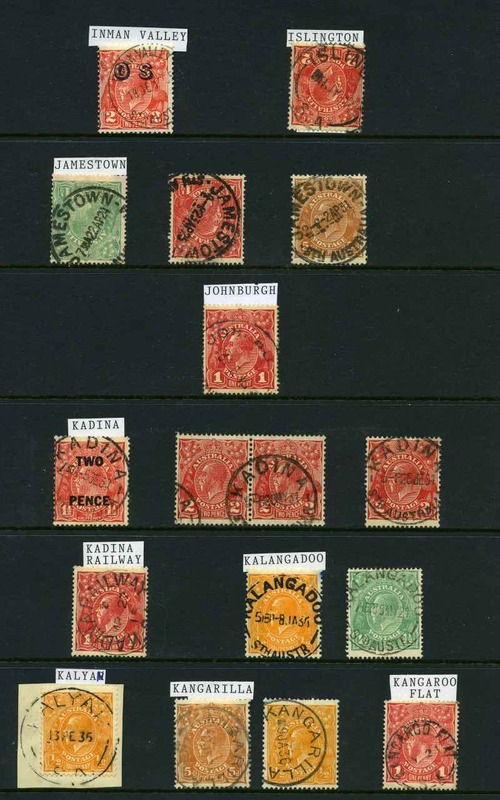 Rated 3R. 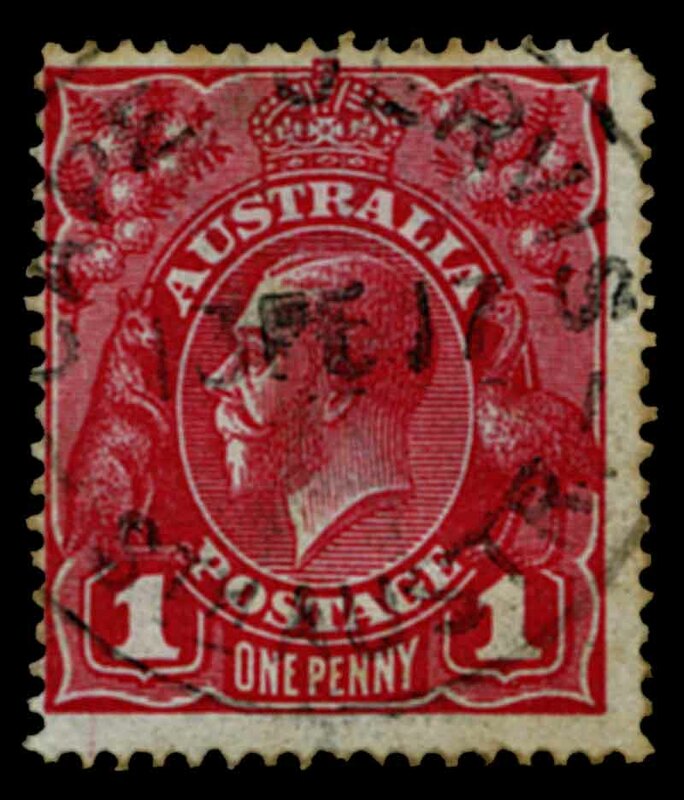 Cape Jervis 13FE17 CDS postmark on 1d Red KGV. 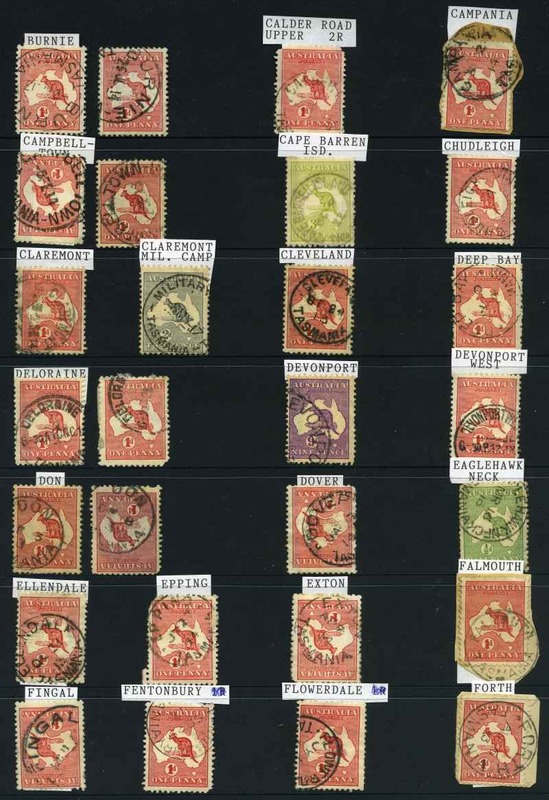 Near complete full strike. Rated 4R. 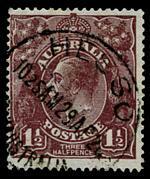 Hesso 29AP20 CDS postmark on 1½d Brown KGV. 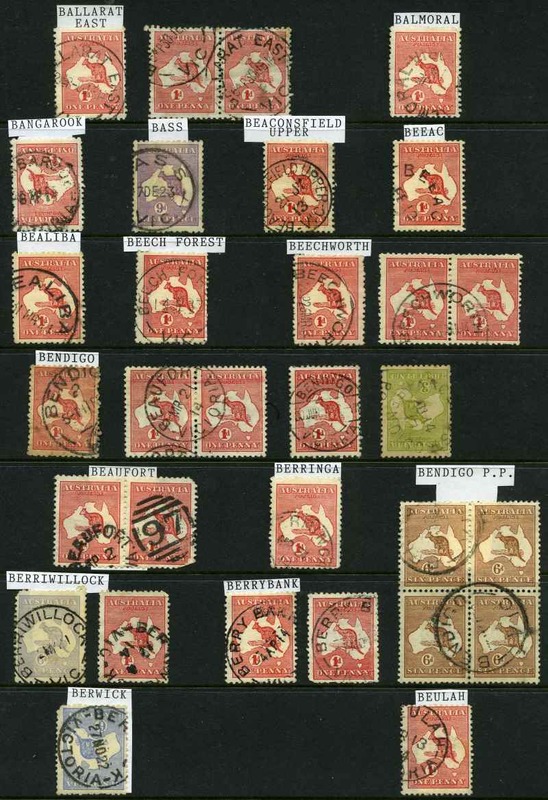 Near complete full strike. 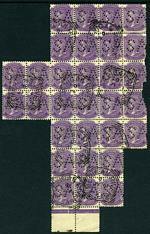 Rated 4R. 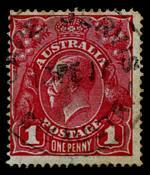 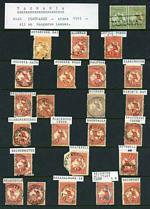 Mintaro Rly Teleg Office CDS postmark on 1d Red KGV. 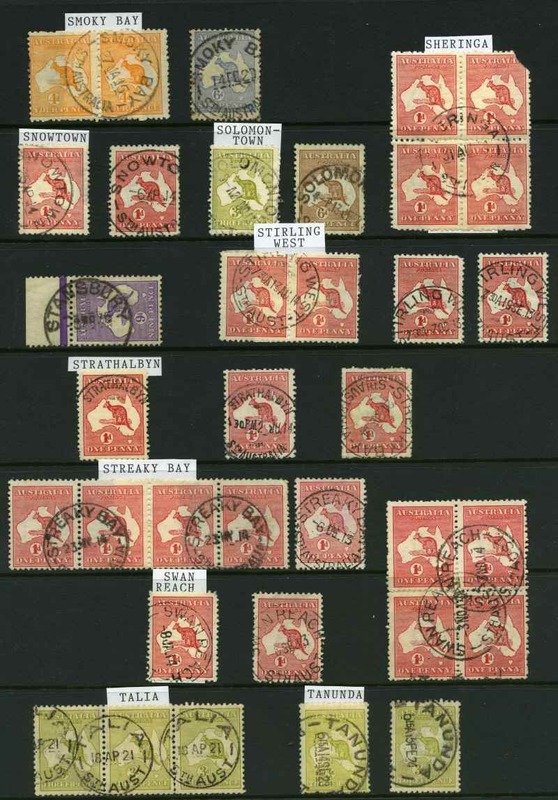 Near complete strike. Rated 4R. 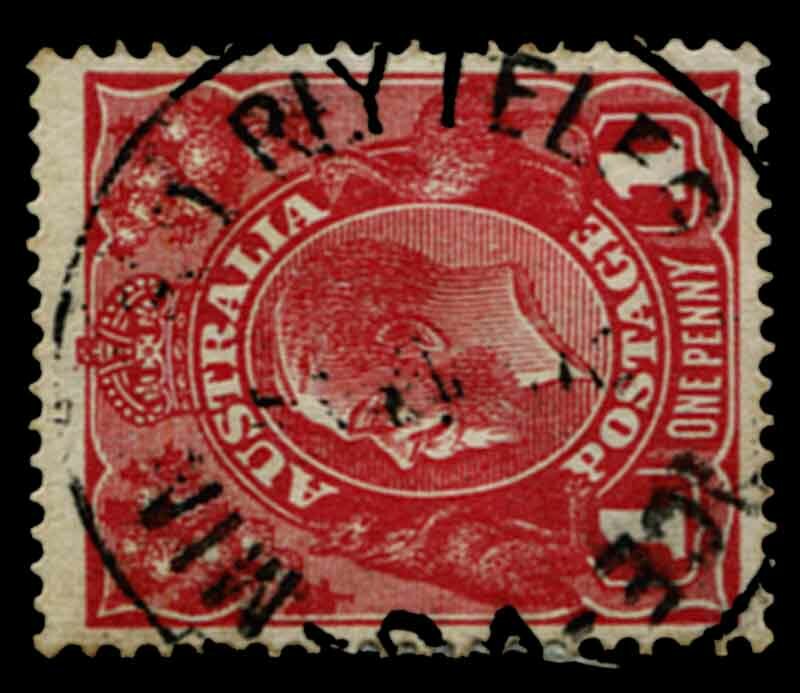 Mt Benson 20AP36 CDS postmark on 2d Red KGV. 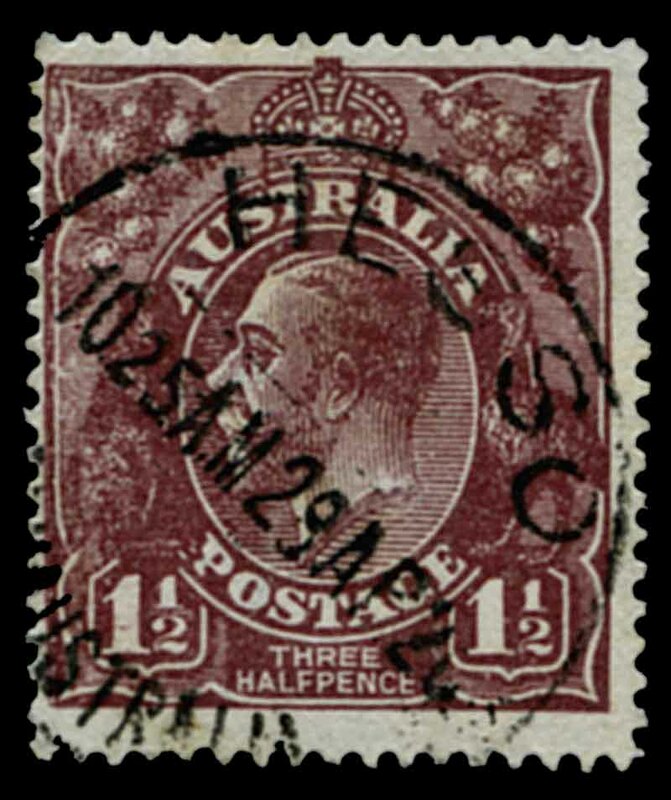 Near complete strike. 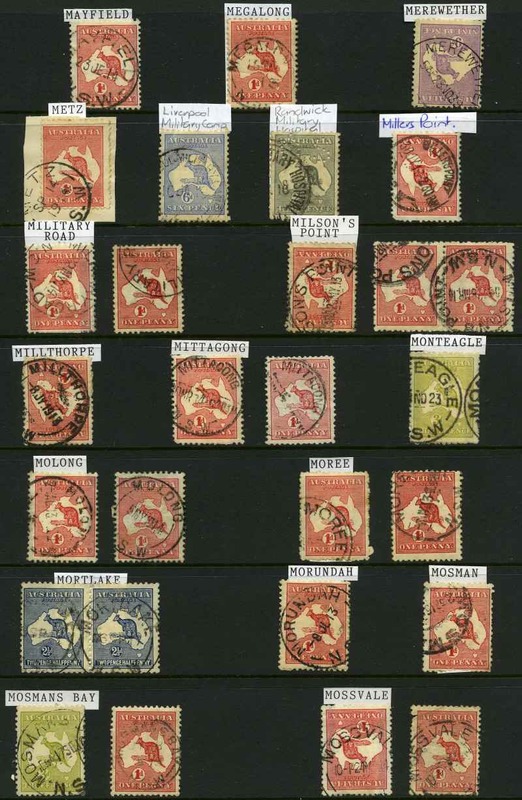 Rated 2R. 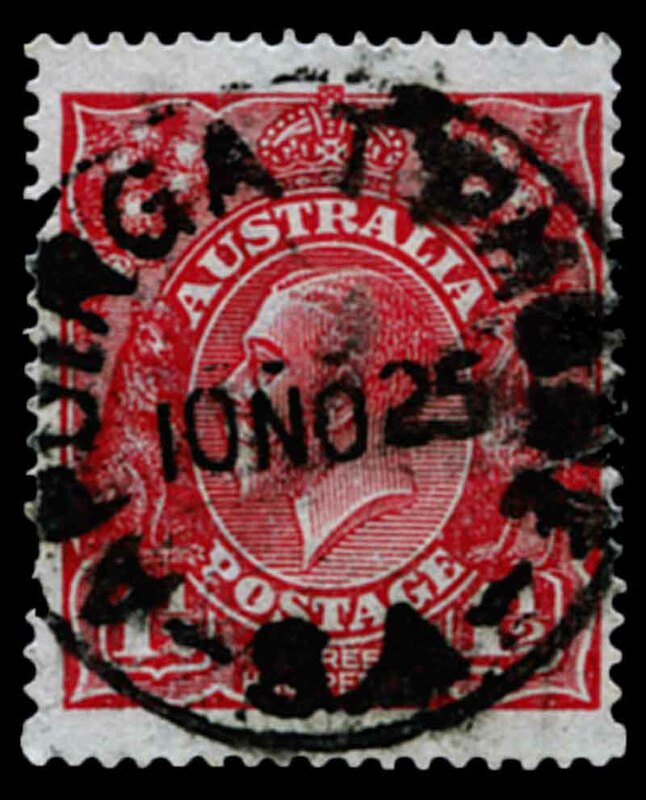 Mundoo Barrage 29OC37 CDS postmark on 2d Red KGV. 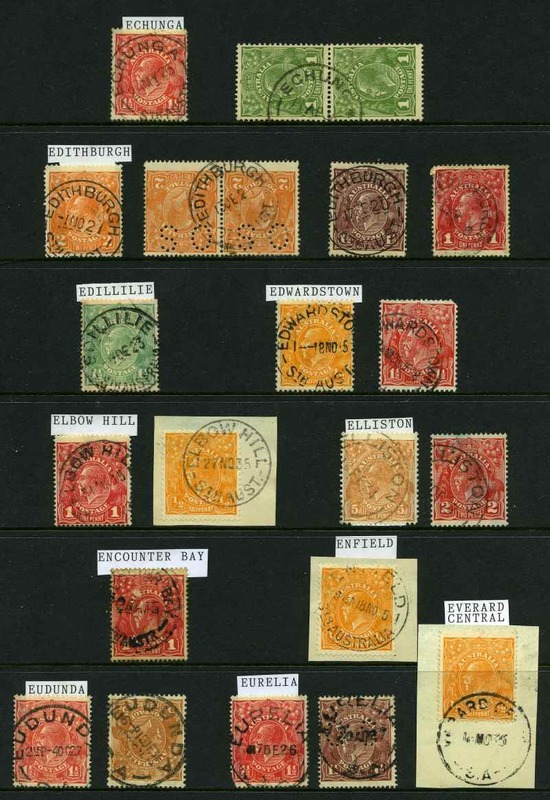 Rated 3R. 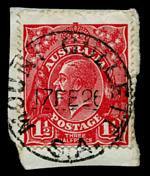 Mount Gullett 17FE26 CDS postmark on 1½d Red KGV on piece. 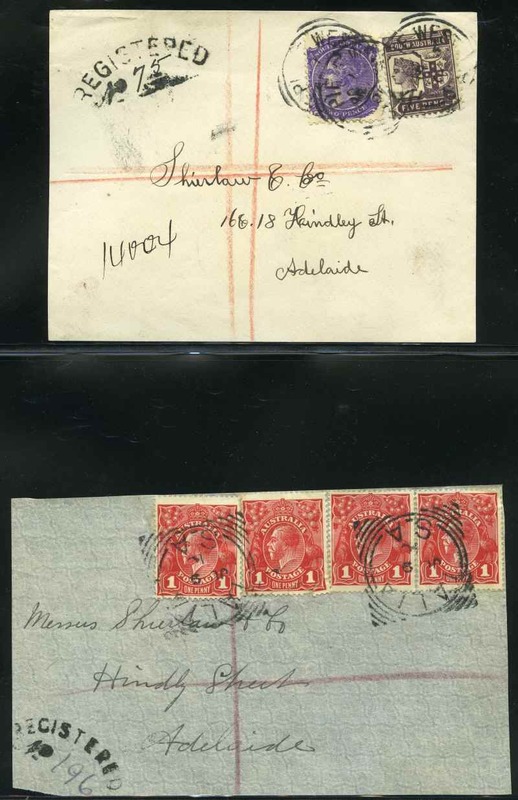 Complete strike. 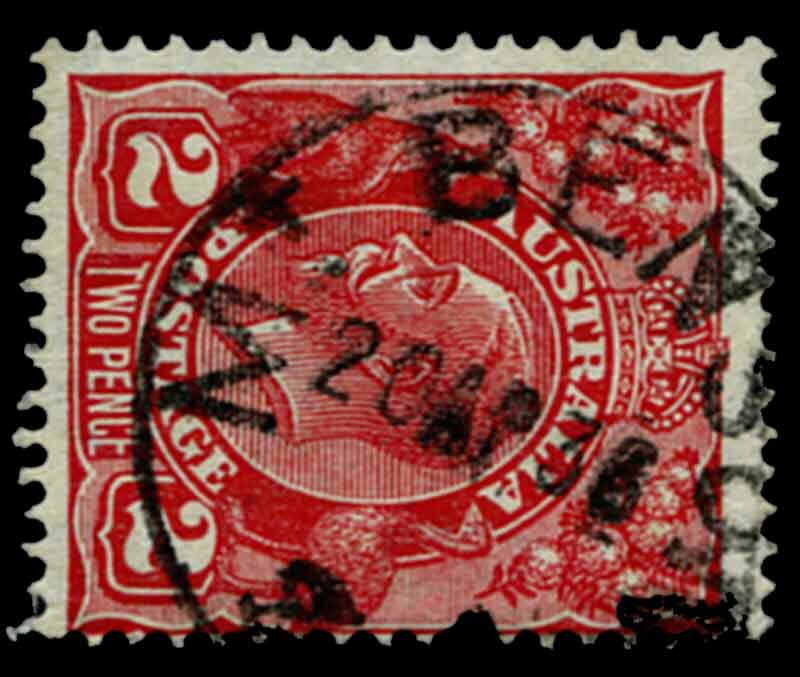 Rated 2R. 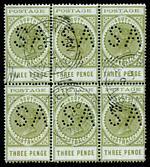 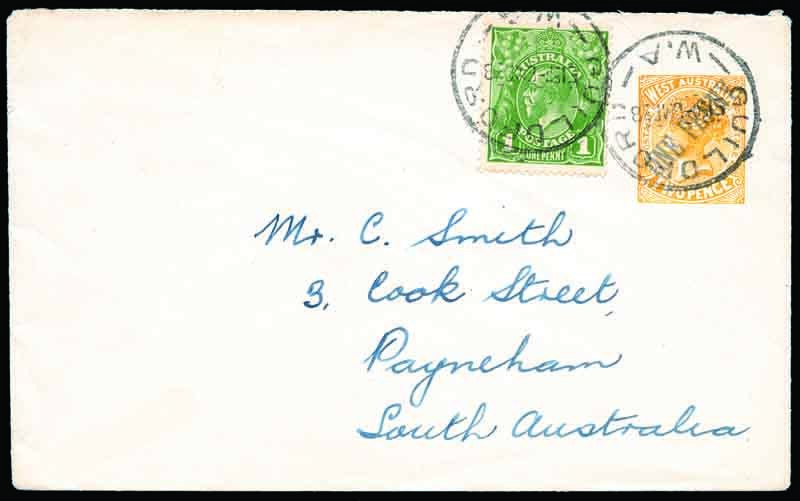 Pt Pirie Down 7MR18 CDS postmark on ½d Green KGV pair. 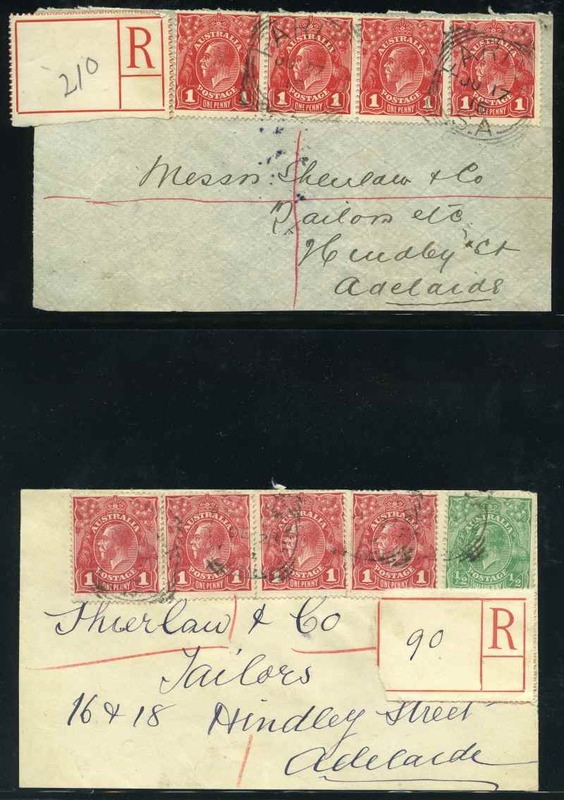 Near complete strike. 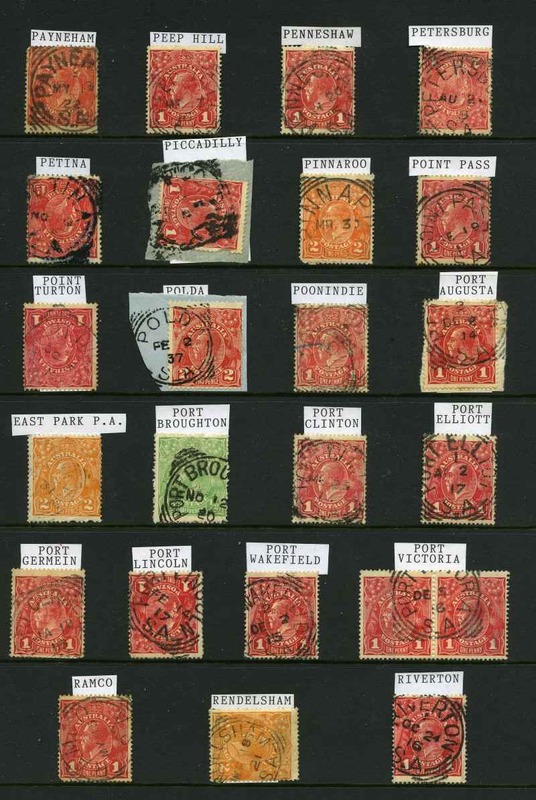 Rated 3R. 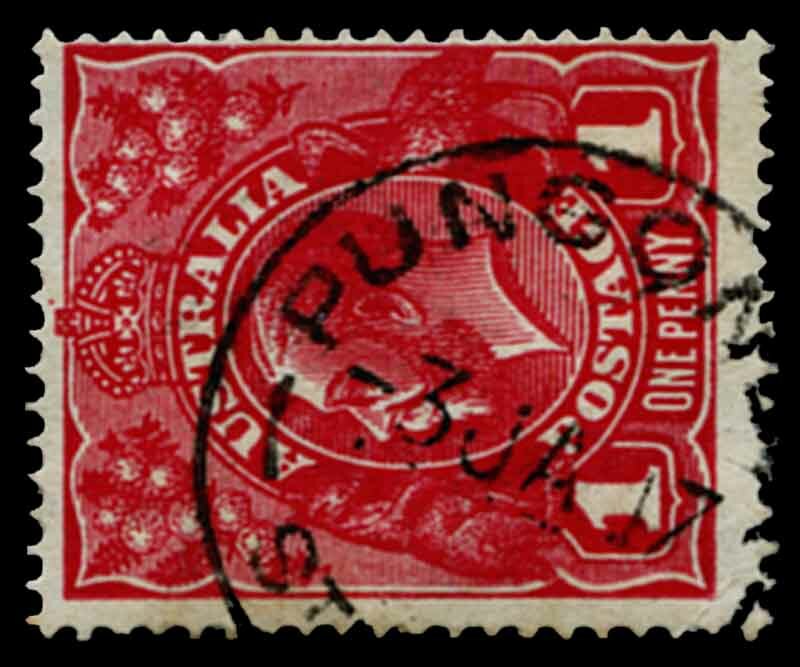 Pungonda 3JA17 CDS postmark on 1d Red KGV. 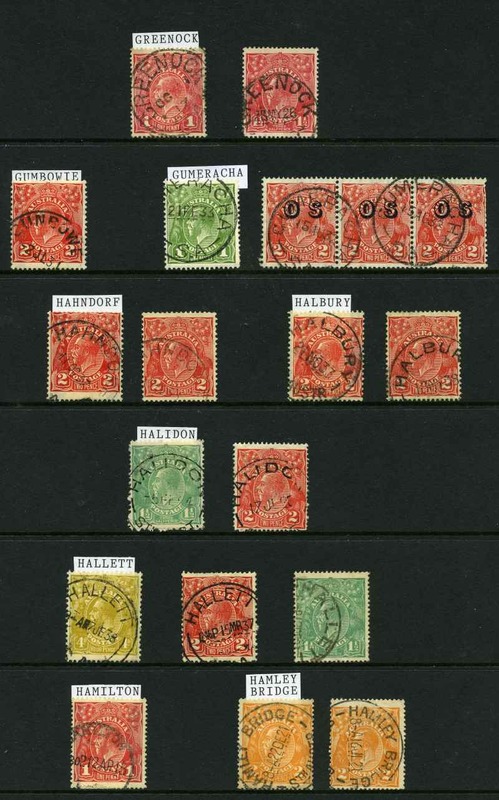 Near complete strike. 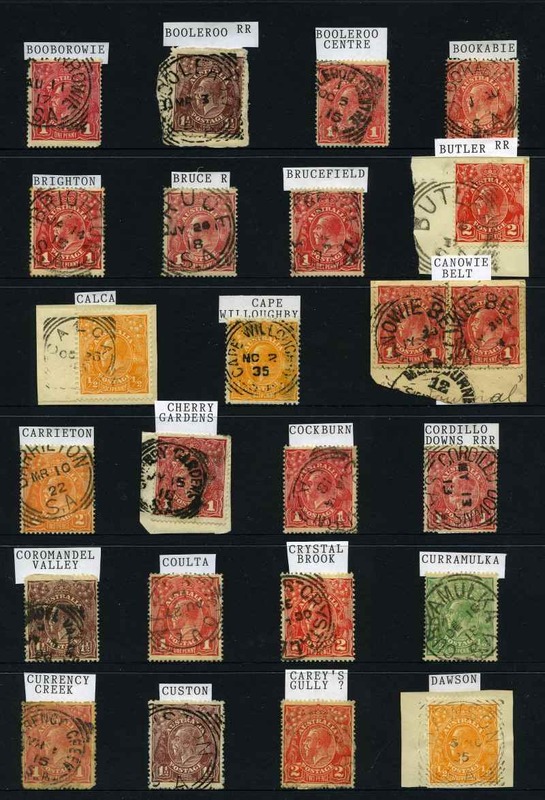 Rated 3R. 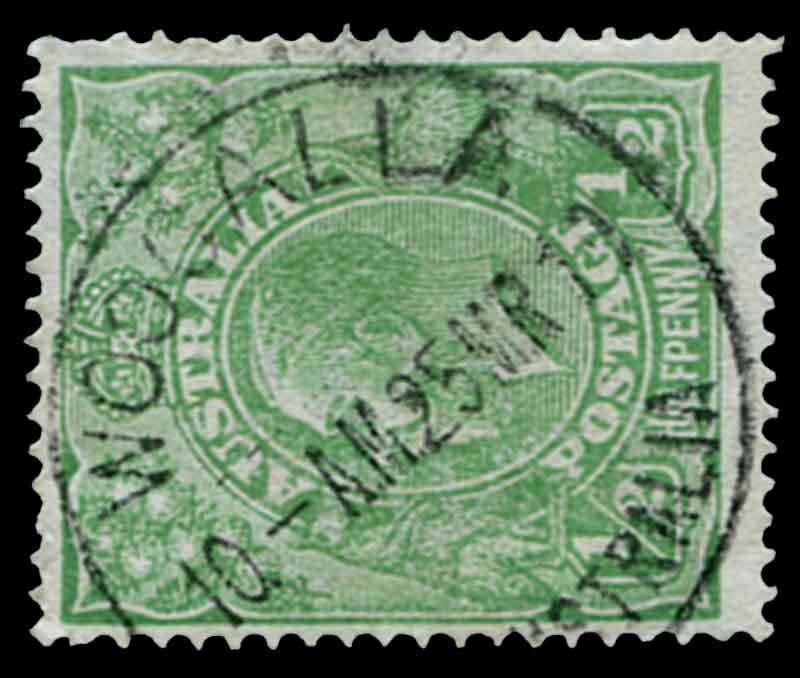 Woocalla 25MR19 CDS postmark on ½d Green KGV. 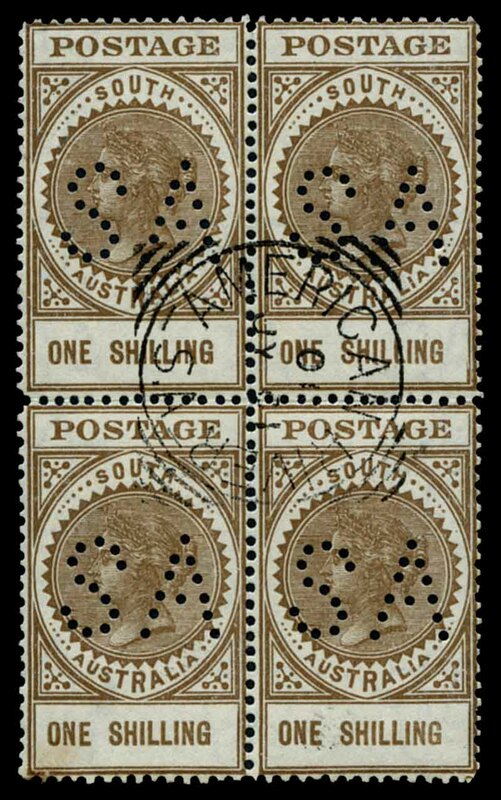 Near complete strike. 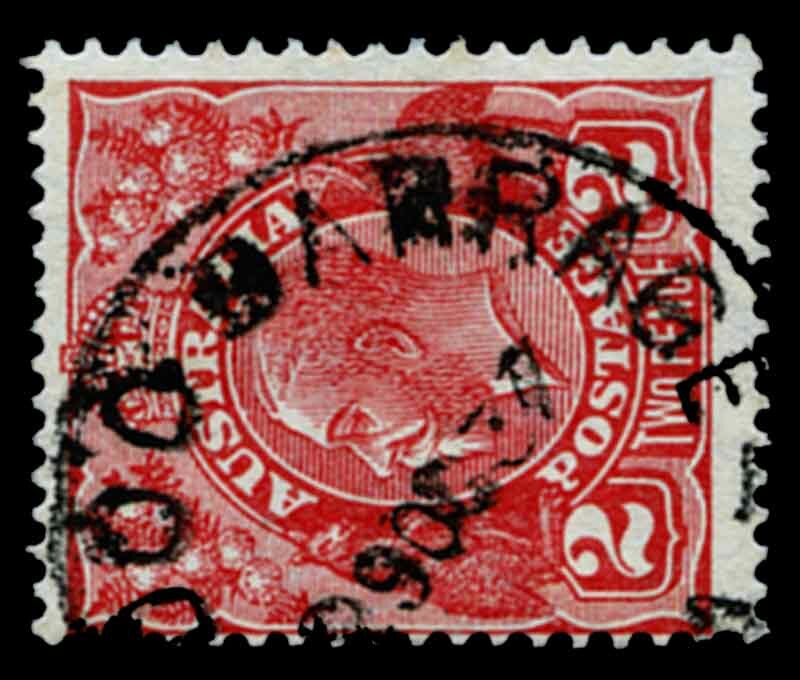 Rated 3R. 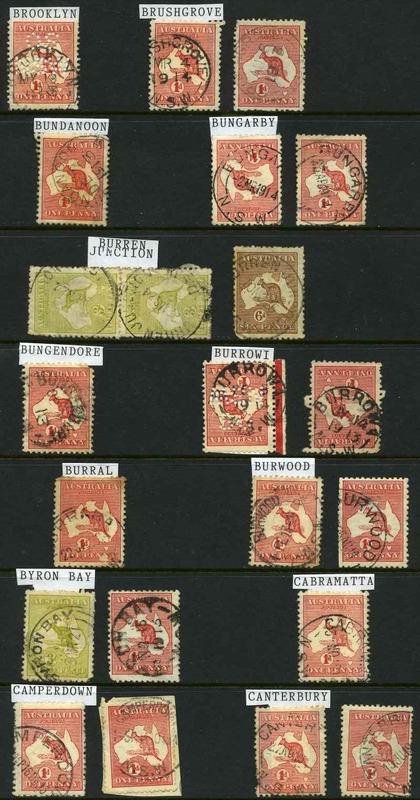 Collection of 1,248 Commonwealth Type Circular Date Stamp postmarks, mainly on KGV issues including Blood's Creek, Boolgun, Bool Lagoon, Brady Creek, Bumbunga, Butler Tank, Caloote, Carawa, Cockaleechie, Colton, Cunliffe, Davenport North, Dawesley, Encounter Bay, Emu Downs, Everard Central, Express Railway Up, Forster, Gawler Blocks, Geranium Plain, Gilles Plains, Glanville Blocks, Goolwa Barrage, Green's Plains, Harben Vale, Hummocks, Islington, Johnburgh, Kangaroo Flat, Kielpa, Koppio, Kulde, Lowaldie, Macgillivray, Maggea, Mangalo, Mannanarie, Marama, Mercunda, Merildin, Milendella, Mount Bryan, Muljarra, Mt.Crawford, Mount Hope, Mt.McKenzie, Muloowurtie, Mundalla, Muston, Myrta, Nangari, Nelshaby, North Booborowie, Notts Well, Penfield, Pt.Pirie Up, Redruth, Reeves Plains, Rowland's Flat, Sellicks Hill, Seven Hills, Sth Hummocks, Stennes, Sutton Town, Taylorville, Telowie Creek, Terowie Rly, Tooligie, Tuscan, Warramboo, White's Flat, Winulta and many more. 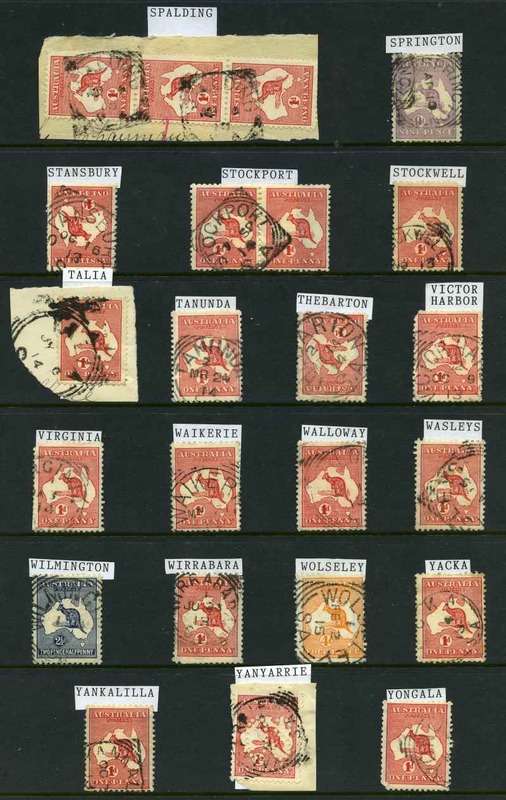 A good range of near complete strikes with 601 different towns represented. 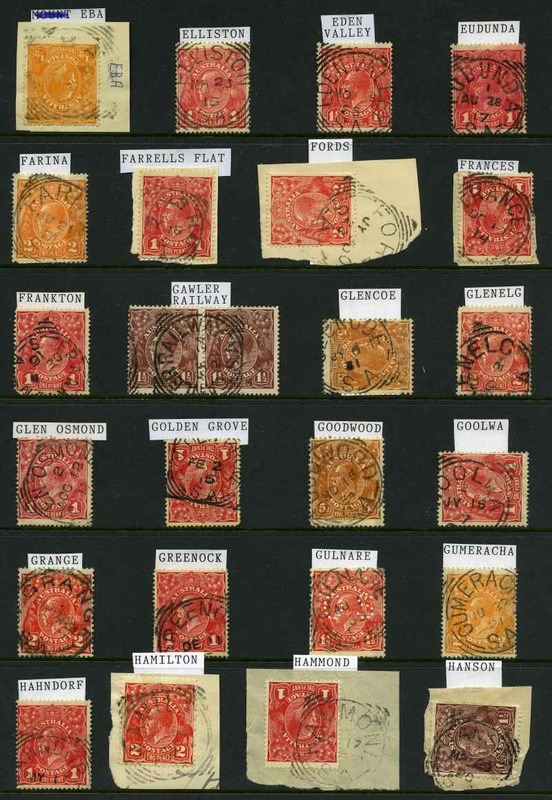 Excellent basis for an advanced collection. 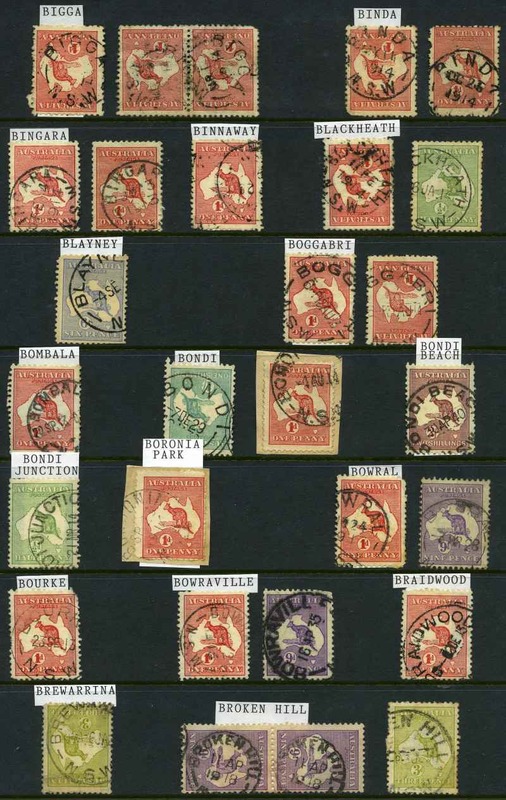 Collection of 302 mainly Commonwealth Type Circular Date Stamp postmarks on Kangaroo issues including Australia Plains, Clanfield, Denial Bay, Elbow Hill, Express Rly Down, Hoyleton, Lock No 3, Lone Gum, New Residence, Parilla, Pine Creek NT, Wanbi, Wilkawatt and Wirrega. 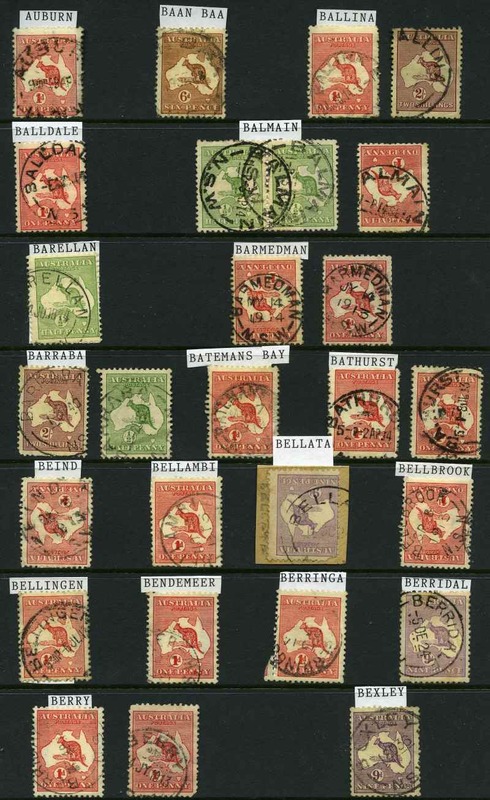 A good range of near complete strikes with 162 different towns represented. 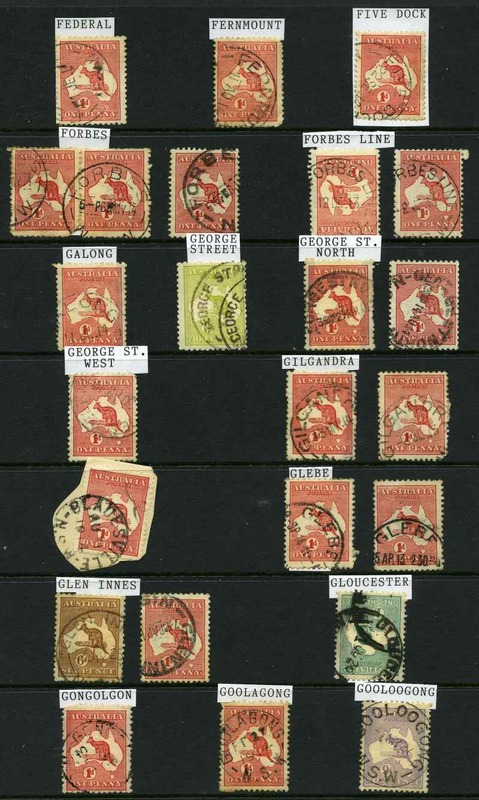 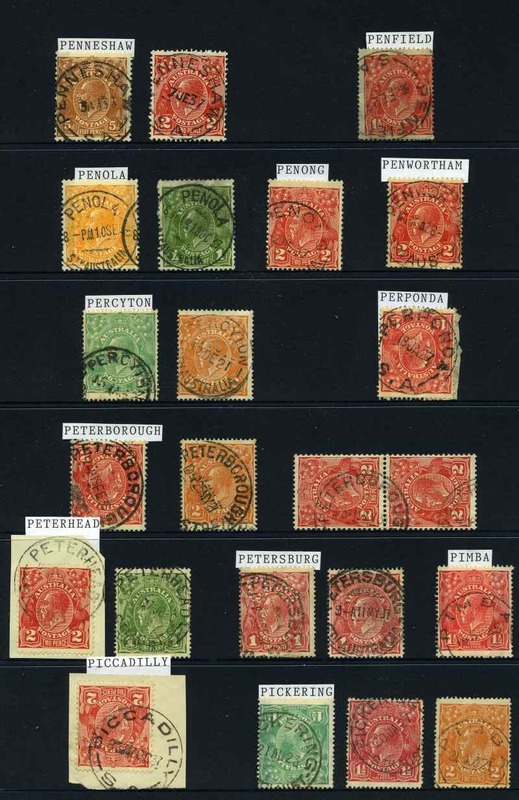 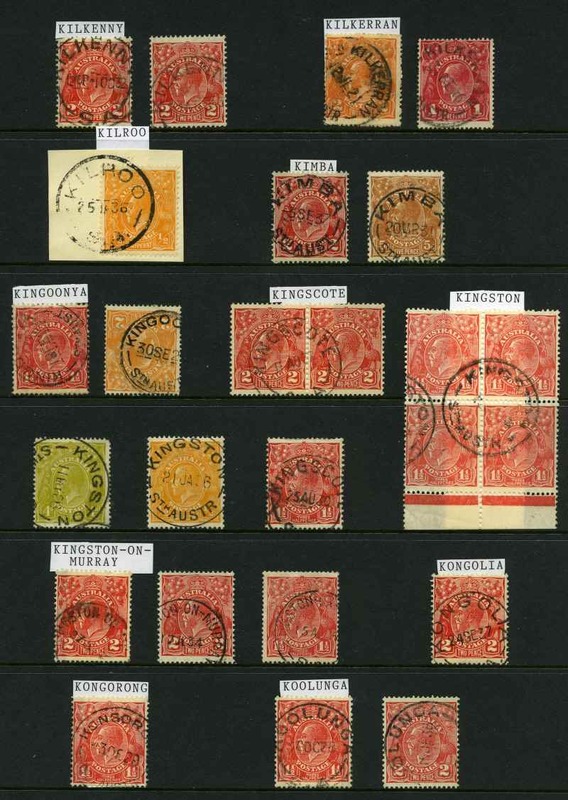 Selection of 179 plain covers with CDS postmarks of various towns and suburbs including many cancelled on closing day of Post Offices, with some duplication and Northern Territory postmarks. 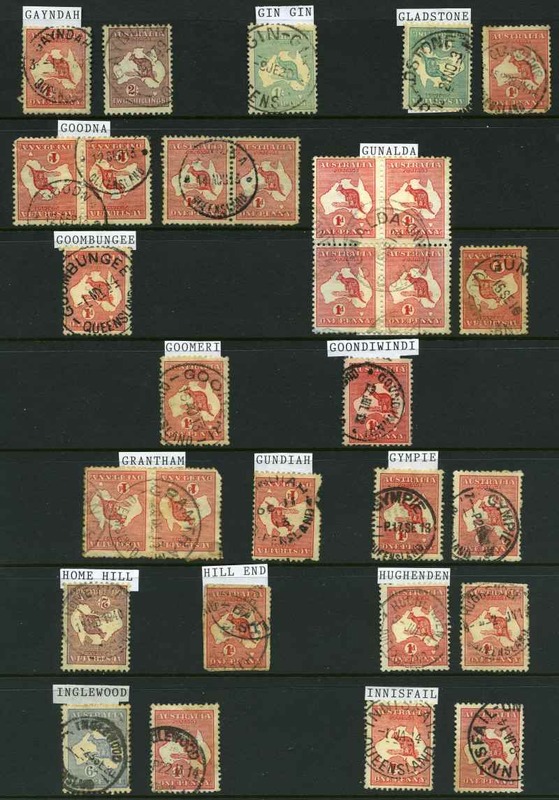 Circa 1981-1994. 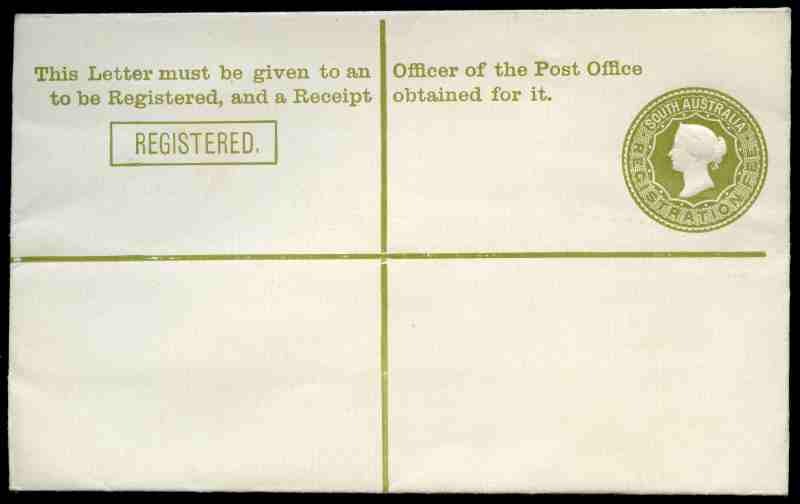 1911 (3d) Olive-Green Queen Victoria Registered Envelope mint, in superb condition. 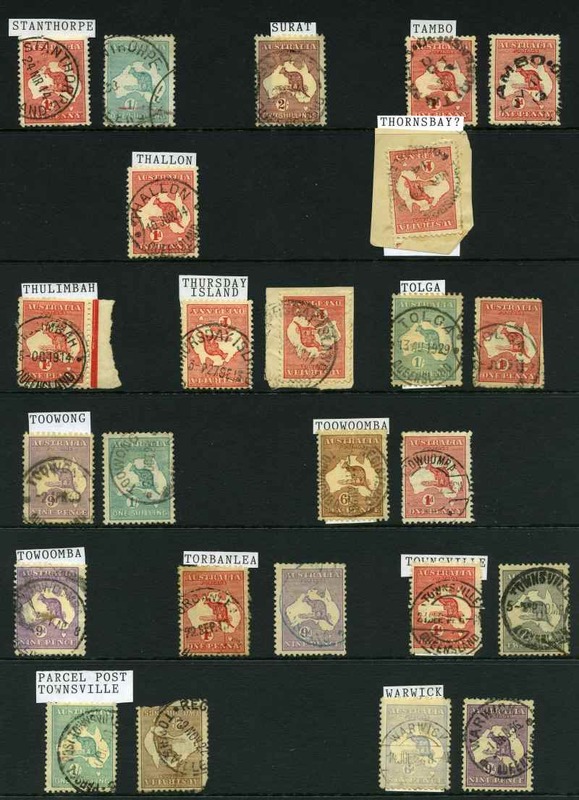 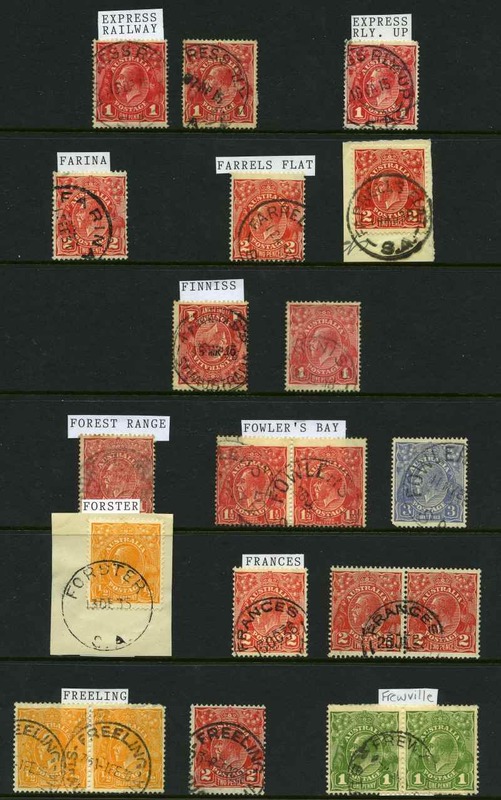 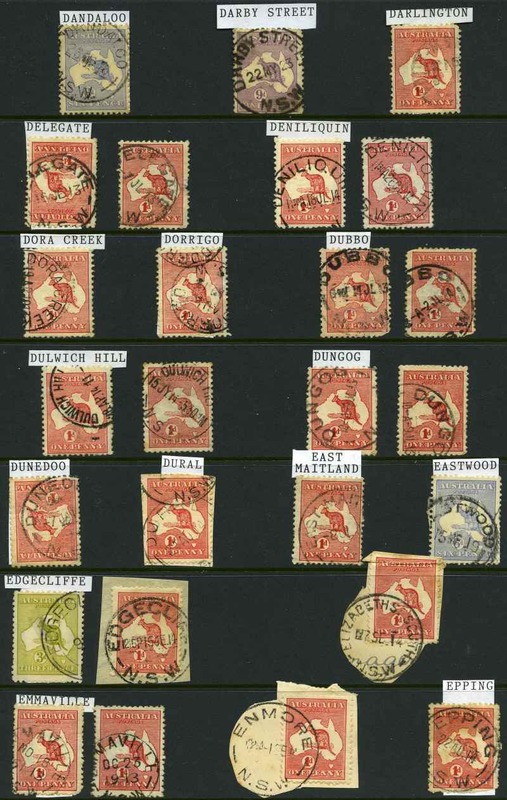 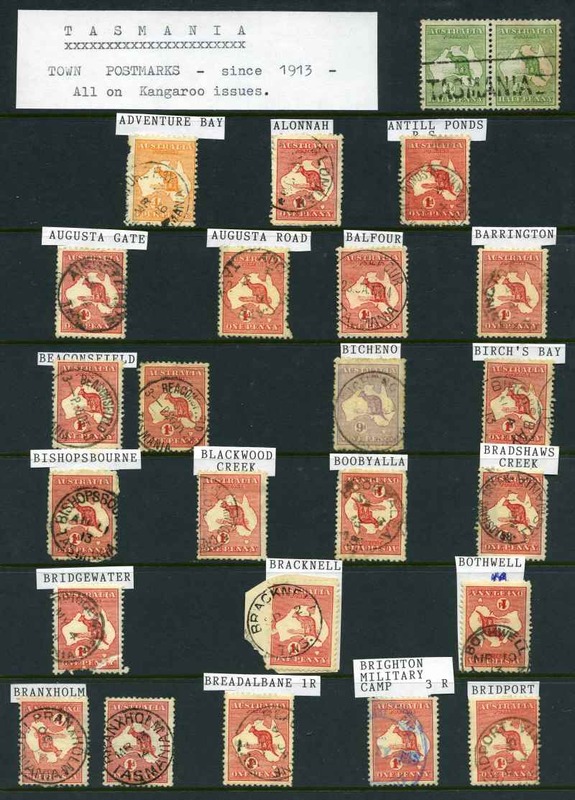 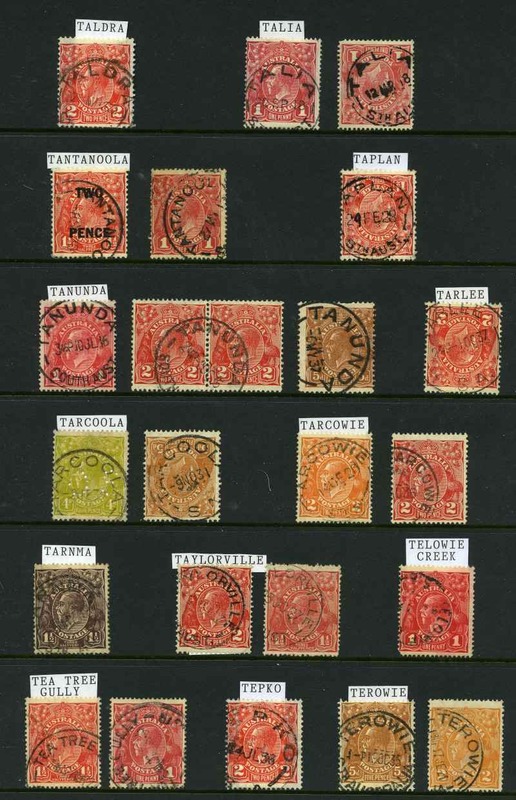 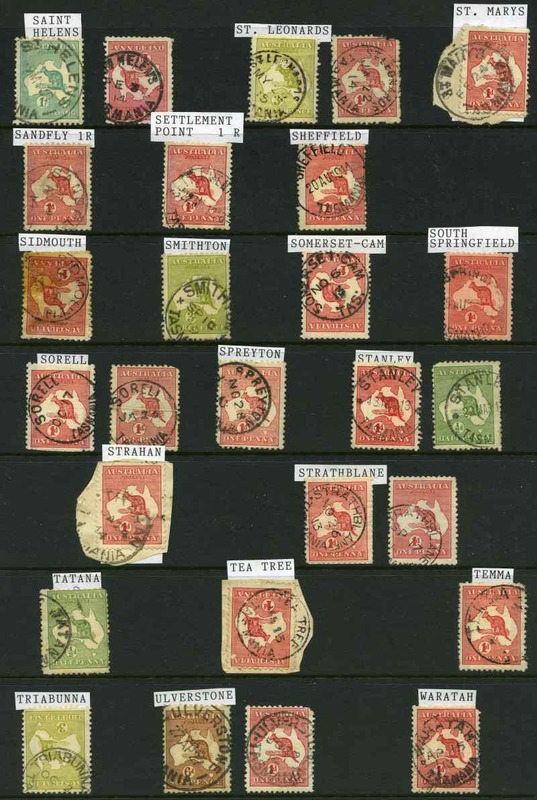 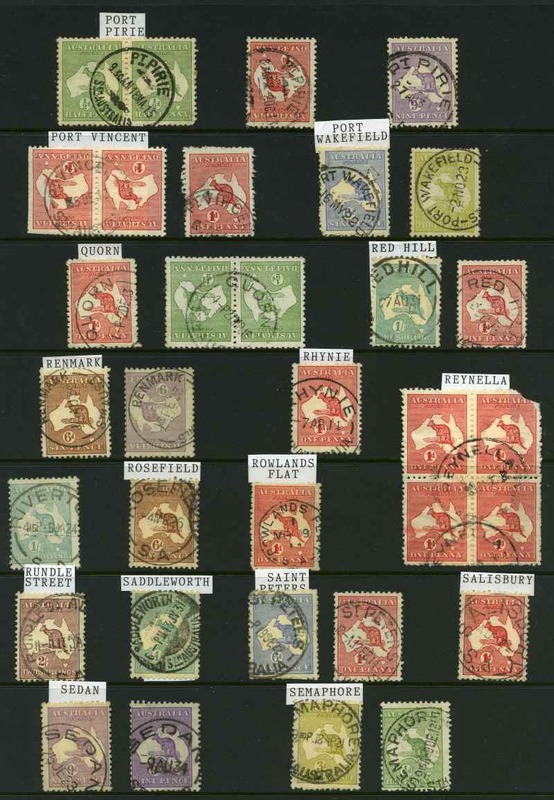 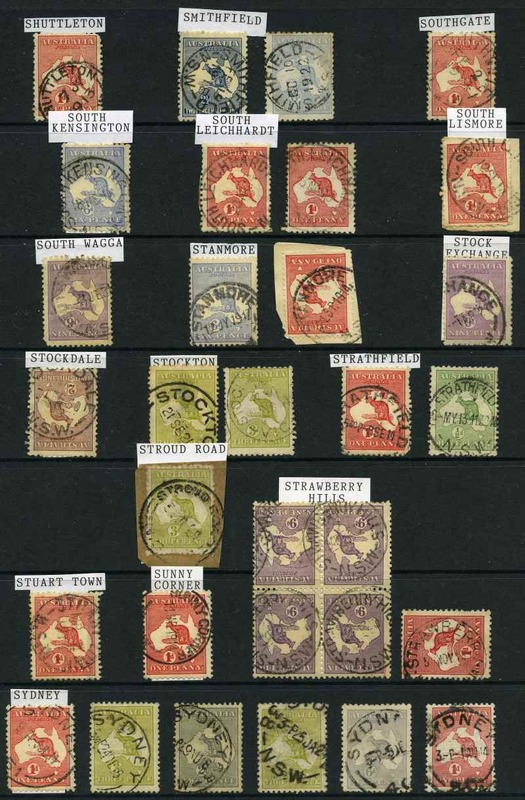 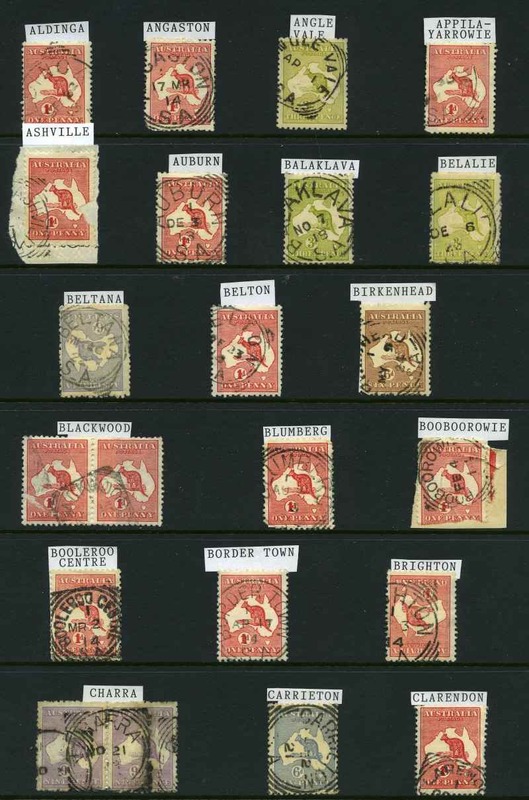 Collection of 168 Circular Date Stamp postmarks on Kangaroo issues including Alonnah, Breadalbane, Calder Road Upper, Falmouth, Gray, Lower Longley, Mengha, Military Camp Tasmania, Military Camp 1, Mooreville Road, Quamby Brook, Sandfly, Strathblane, Tatana, West Pine Road and White Hills. 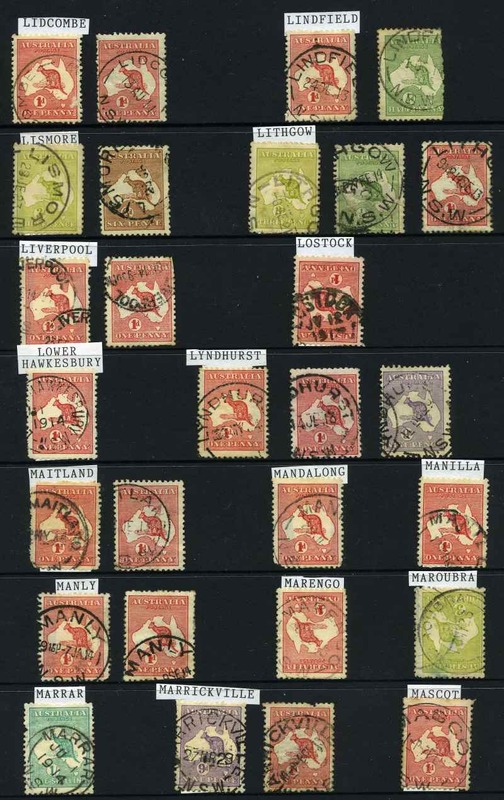 A good range of near complete strikes with 132 different towns represented. 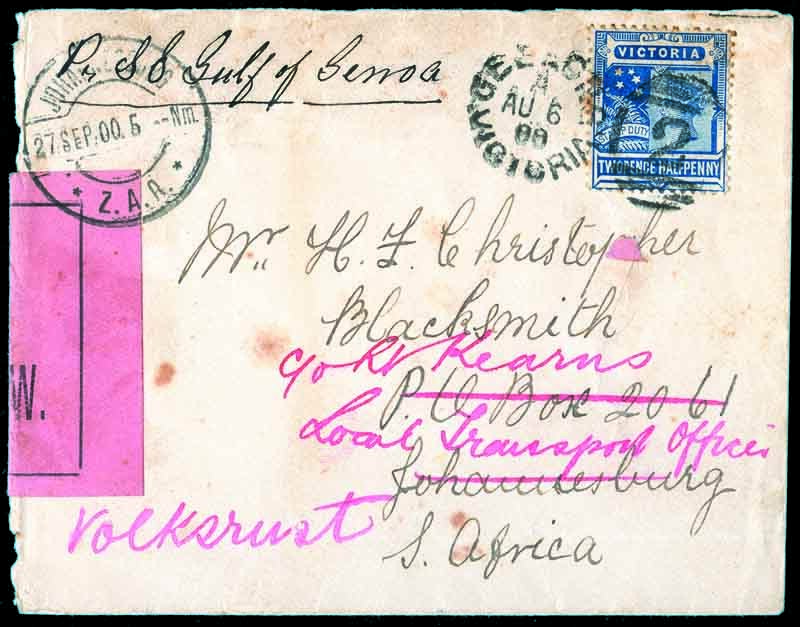 1900 (6th Aug) Cover from Geelong, 'Per SS Gulf of Genoa' stamped with 2½d Blue Queen Victorian issue addressed to Mr. H.F. Christopher, Blacksmith, Johannesburg, South Africa, with Pink "Opened Under Martial Law" censor label attached. 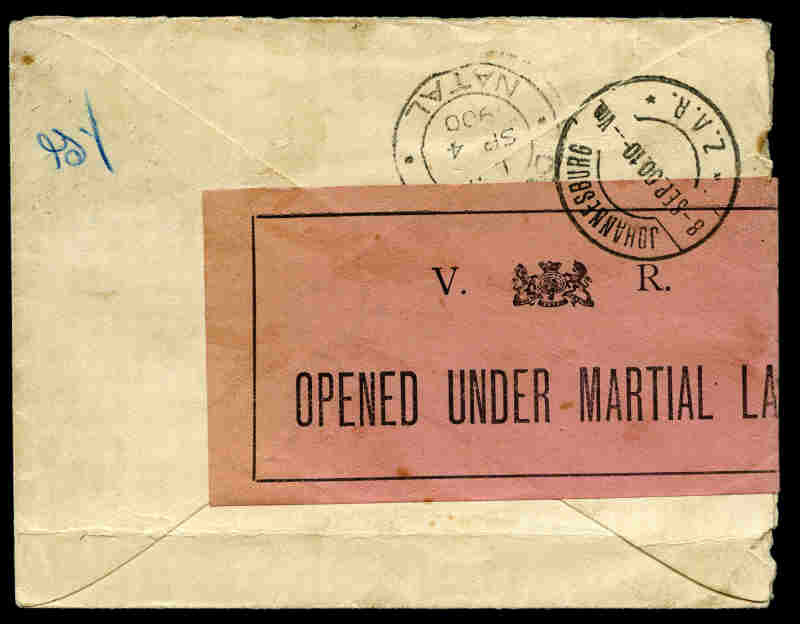 Item has then been redirected to C/- Lt.? 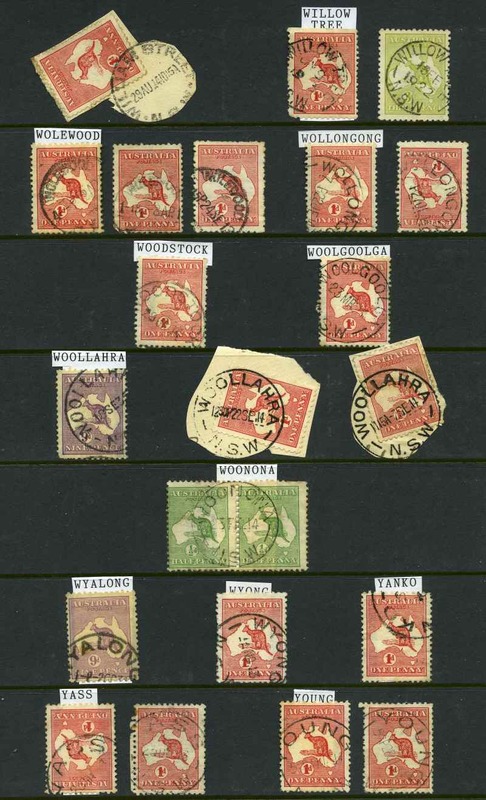 Kearns, Local Transport Officer, Volkrust. 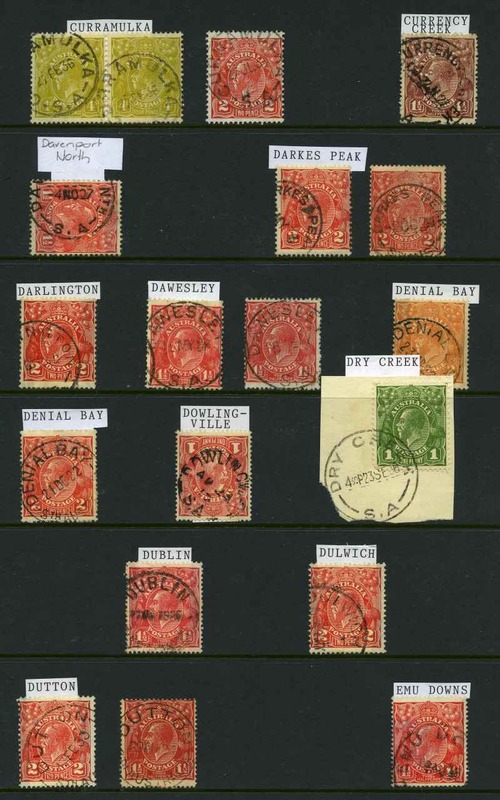 A Lt. Kearns was a Riding Master with the British Army Service Corp and this may refer to him. 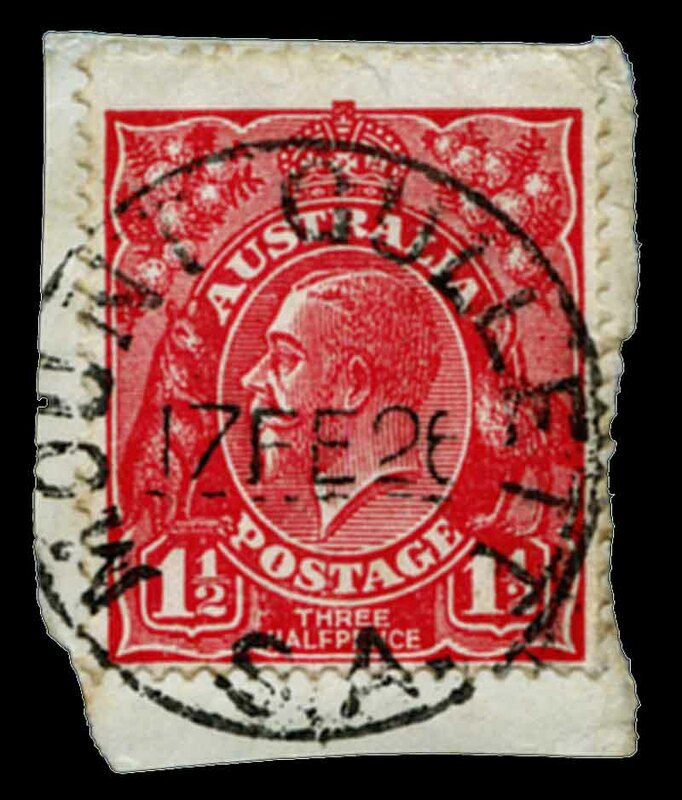 Incoming mail from Australia is scarce. 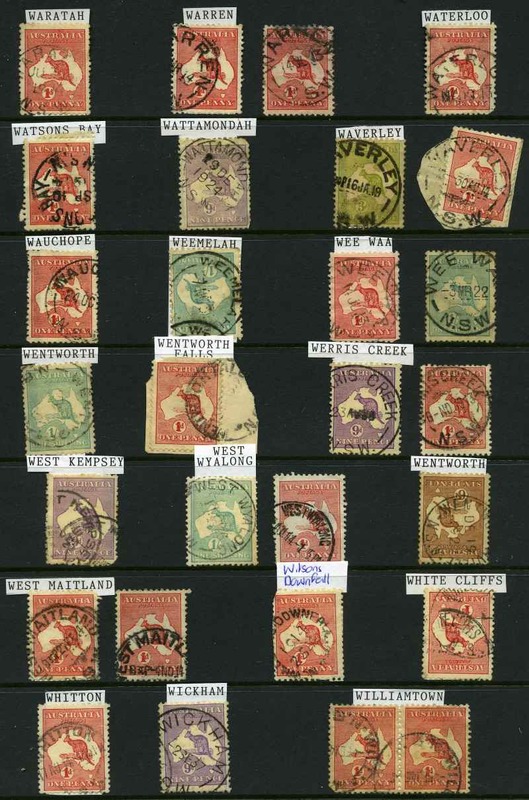 Collection of 421 mainly Commonwealth Type Circular Date Stamp postmarks on Kangaroo issues including Bealiba, Cape Otway, Chillingollah, Gheringhap, Jung Jung North, Marionvale, Mollongghip, Mount Defiance, Piavella, Sheep Hills, Wunghnu and Yarrawalla. 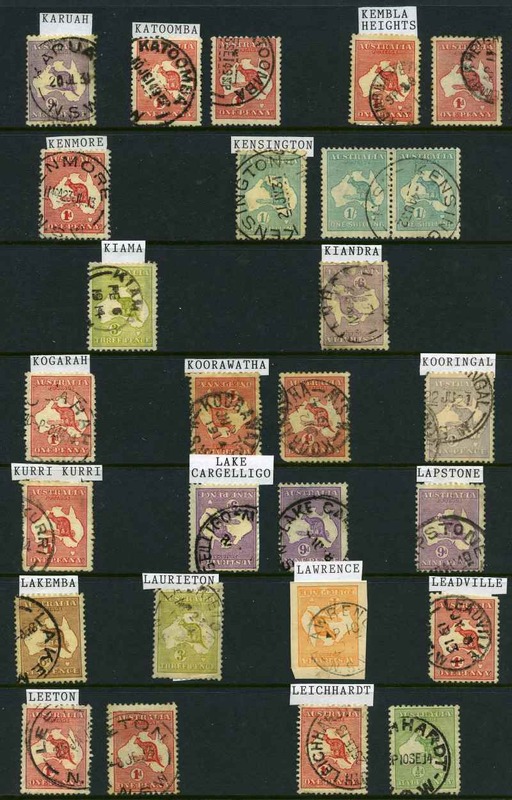 A good range of near complete strikes with 257 different towns represented. 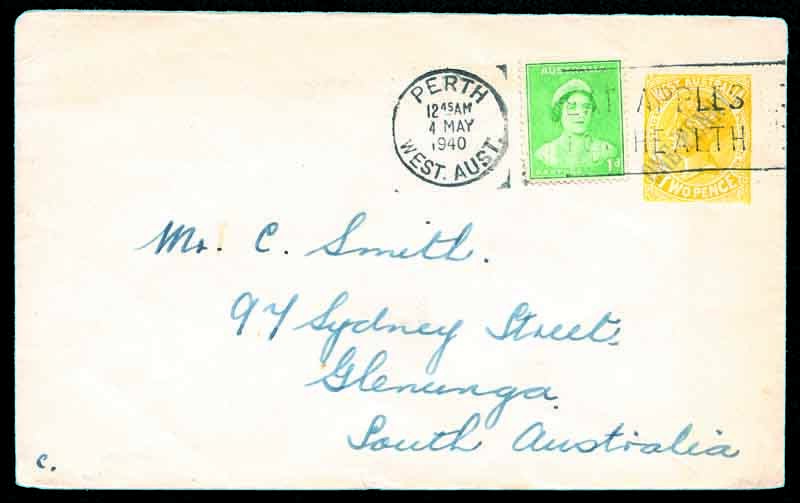 1938 2d Yellow surcharged 'One Penny' diagonally in blue envelope addressed to South Australia uprated with 1d Green Die II Queen Mother, tied by Perth 4 MAY 1940 West. 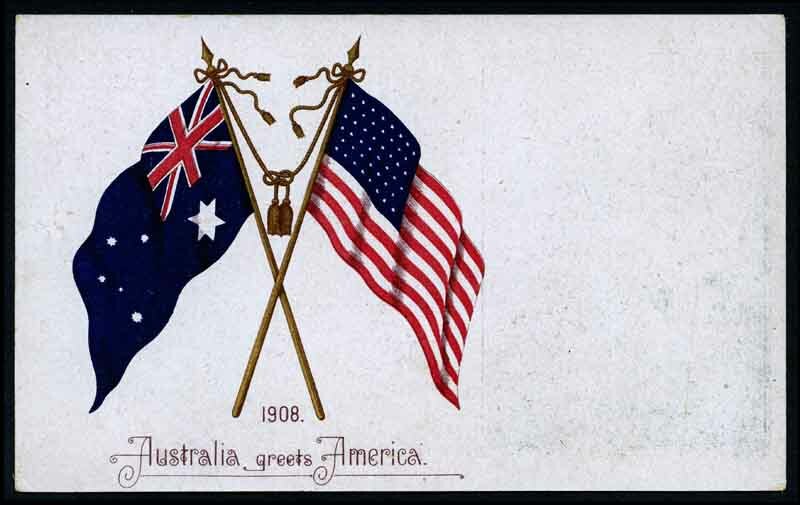 Aust slogan cancellation. Tiny tear at base and back flap. 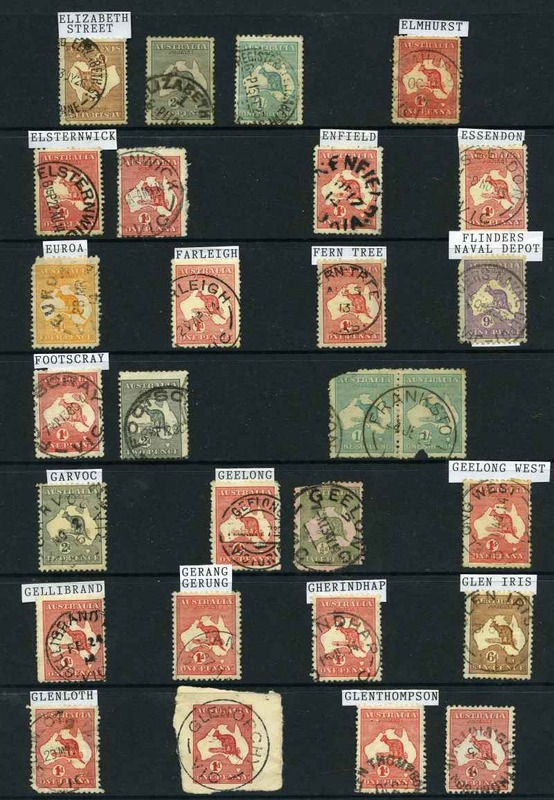 Unusual philatelic usage. 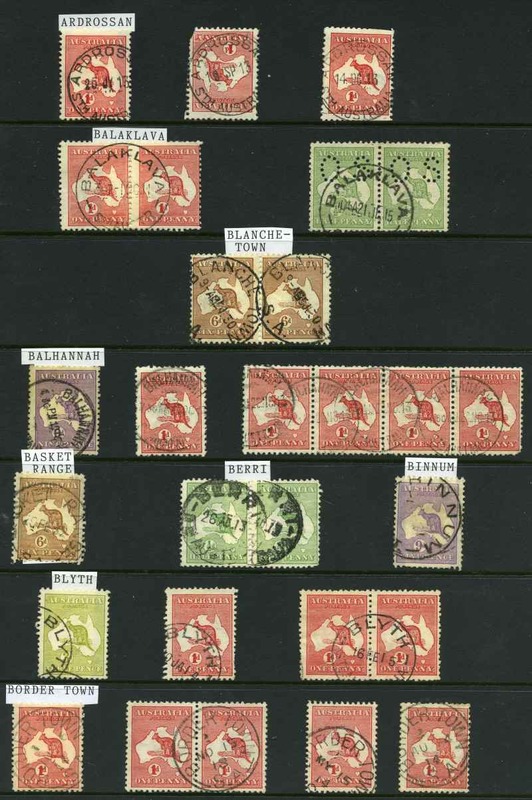 Rare. 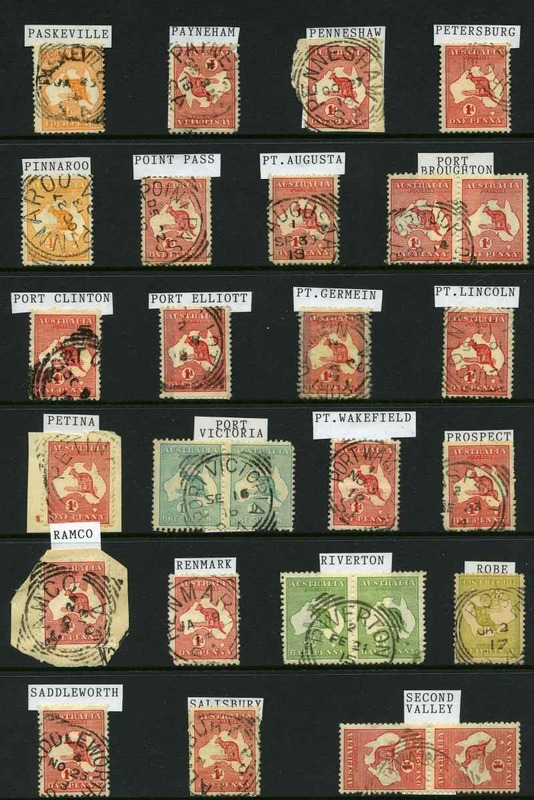 P&T EN 7. 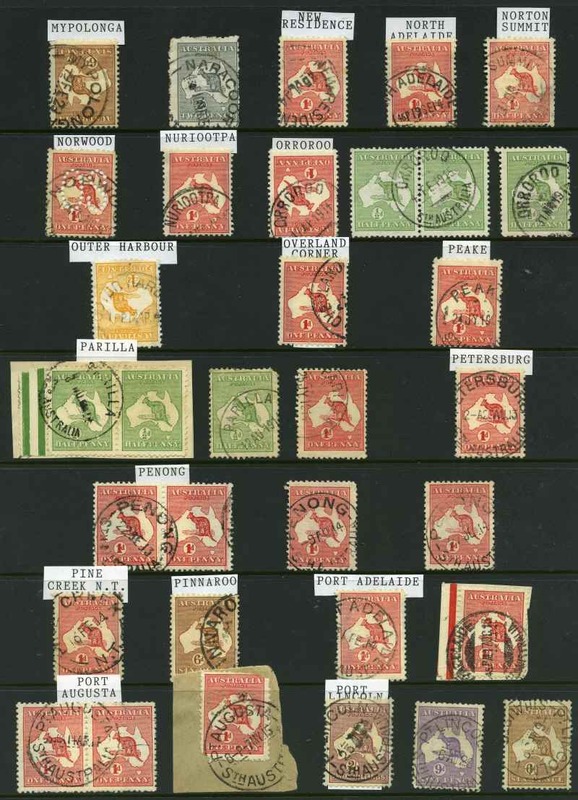 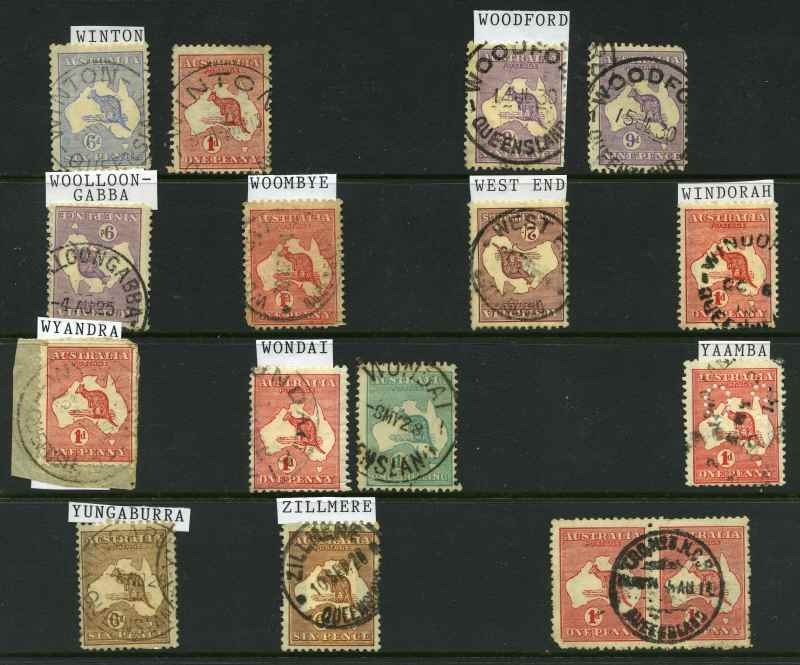 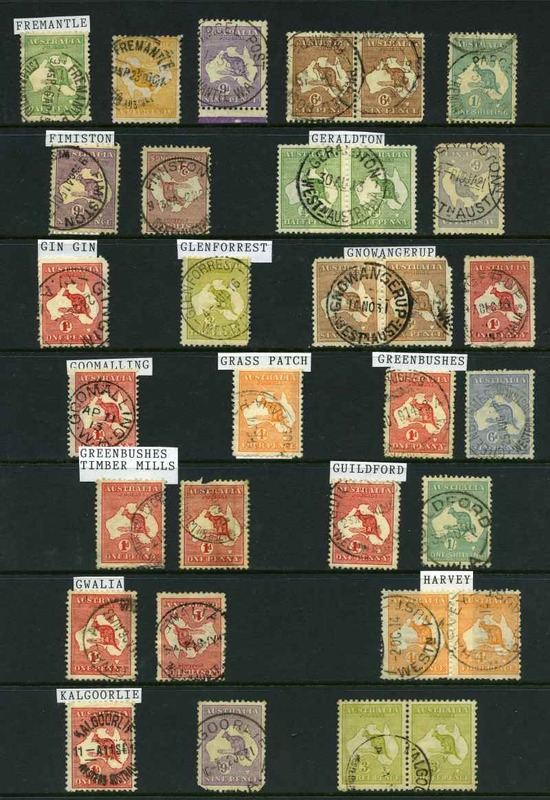 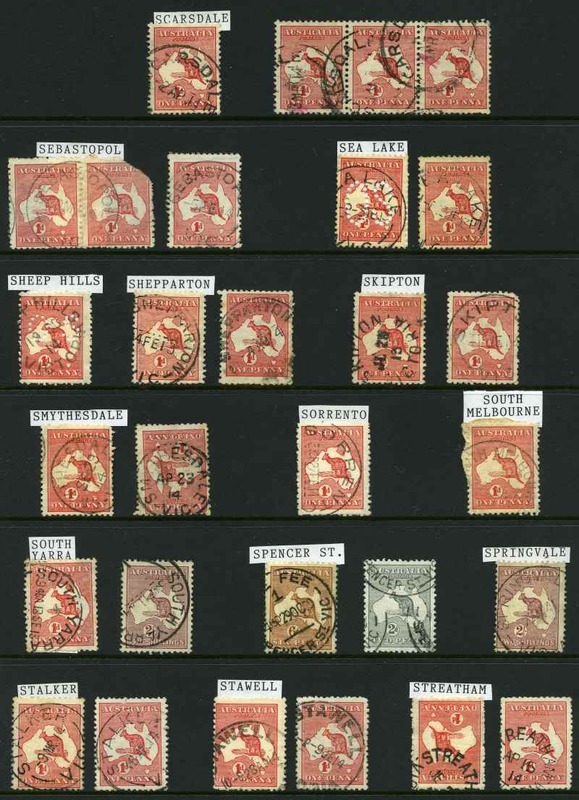 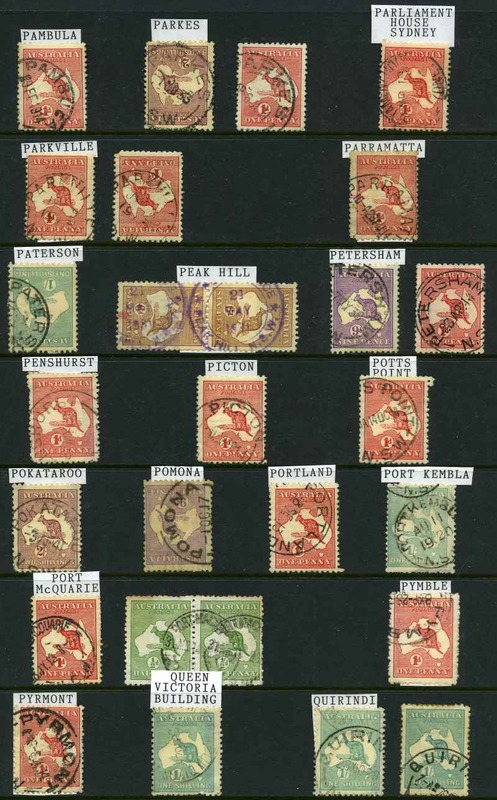 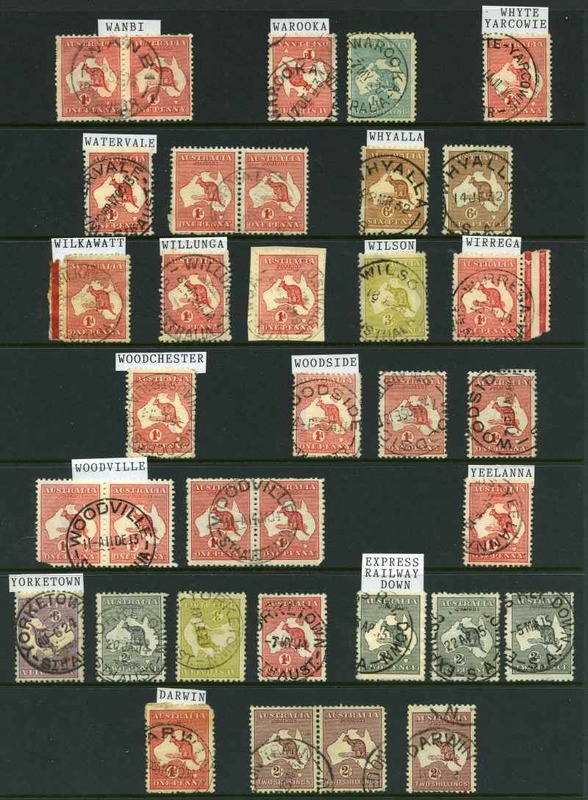 Collection of 134 mainly Commonwealth Type Circular Date Stamp postmarks on Kangaroo issues including No 2 State Mill Dwellingup, Goomalling, Pinjarra, Timber Mills Greenbushes and Wyalkatchem. 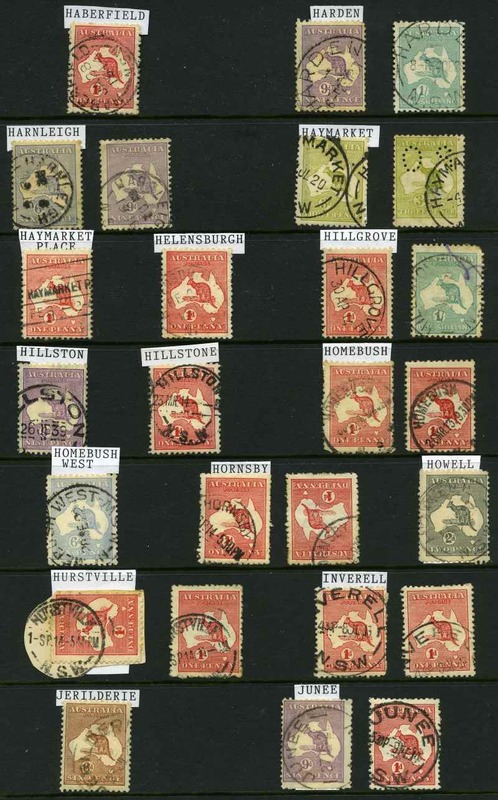 A good range of near complete strikes with 87 different towns represented.